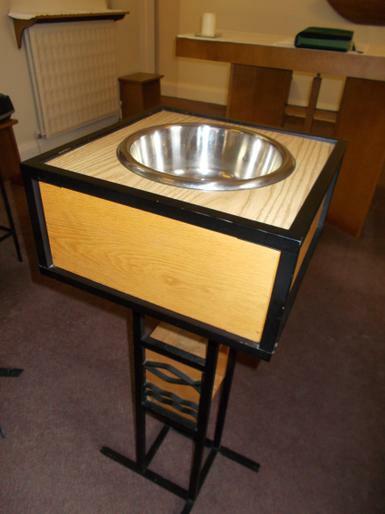 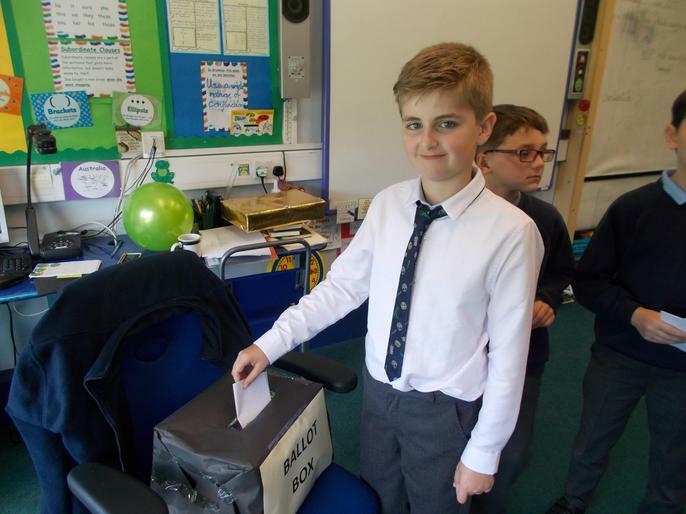 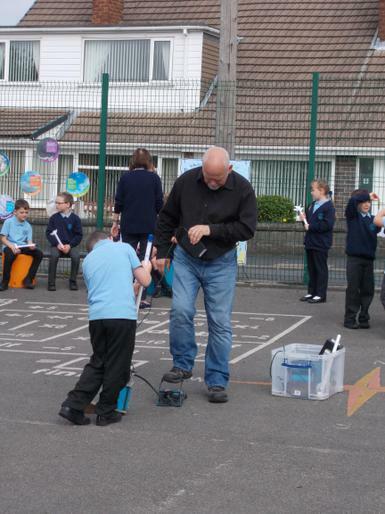 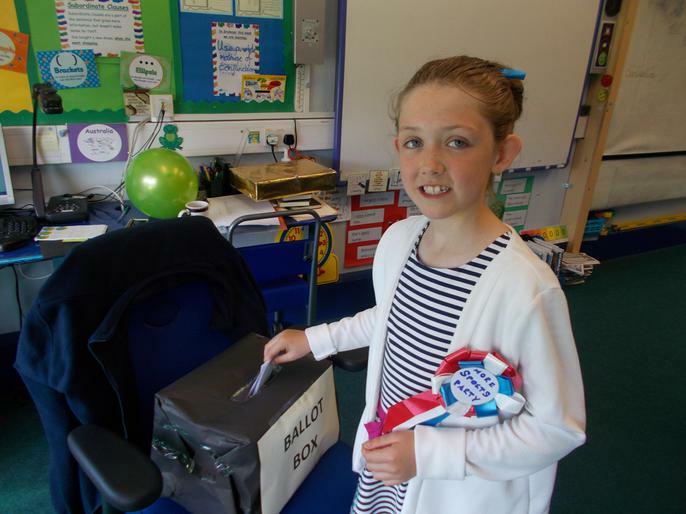 This week, members of the parish council took part in an election. 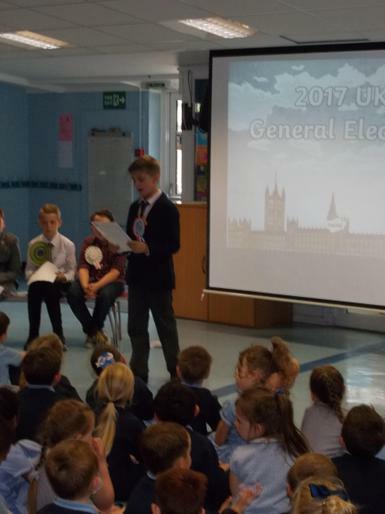 They had to create a name for their party, a rosette, a poster and a manifesto. 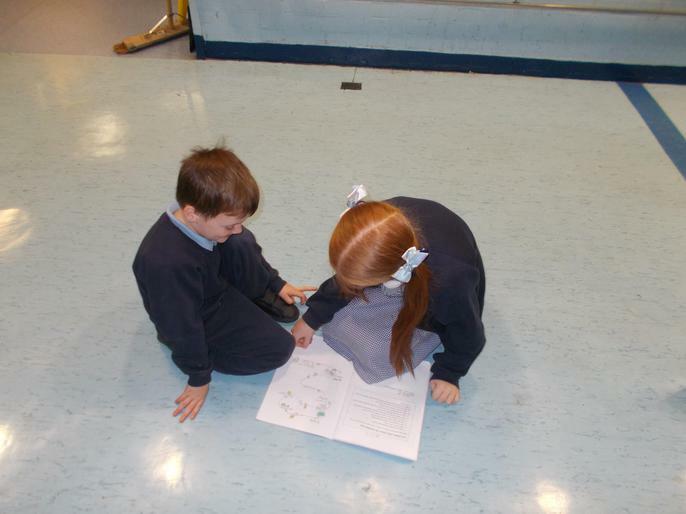 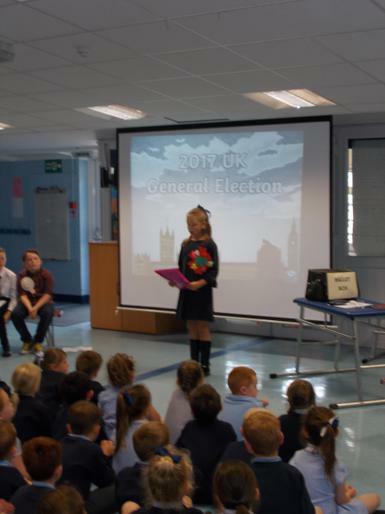 The manifesto had to promise to give something to our school which would help to make our school a fitter place. 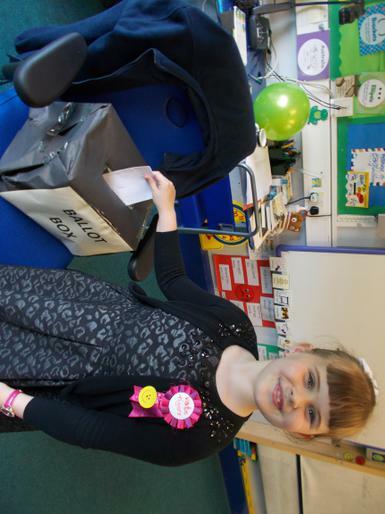 The winning councillor gets £200 from Ms Ainsworth-Brown to spend on fulfilling the promises of their manifesto. 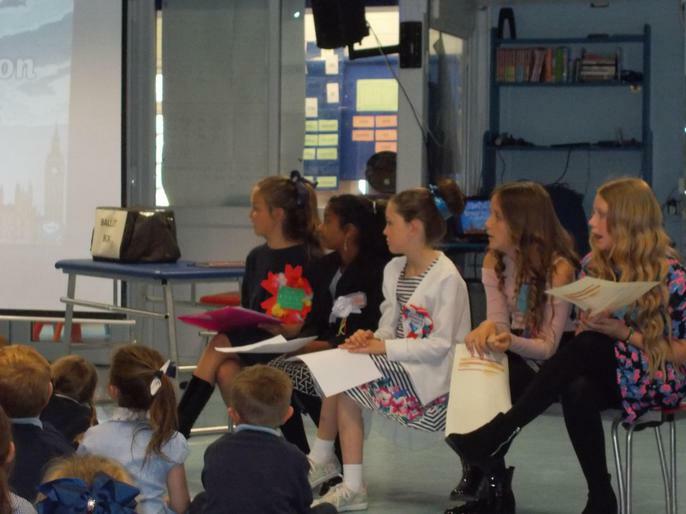 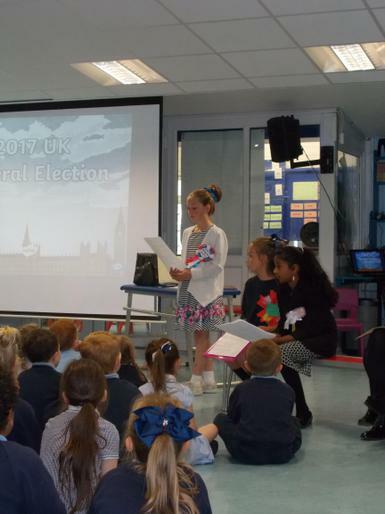 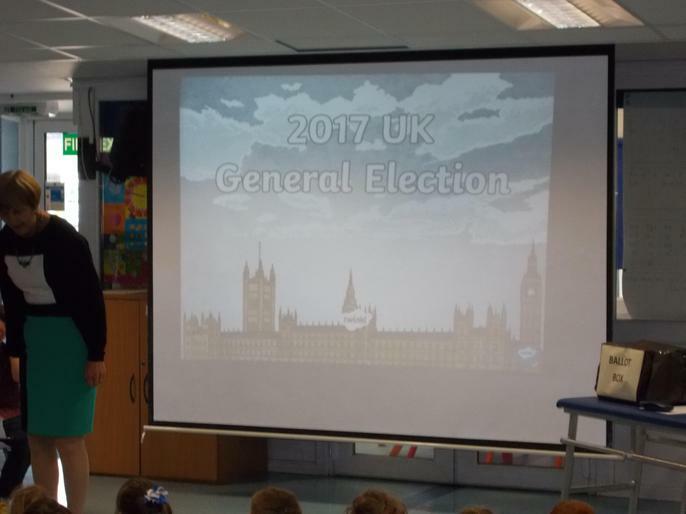 In year 4, we were particularly proud to have 5 of our own children running in the election. 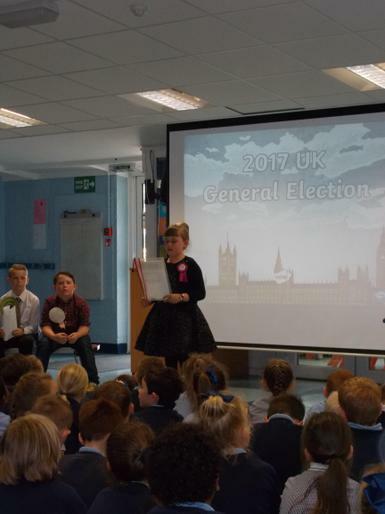 They came in this morning looking so smart in their outfits and rosettes and their speeches about their manifestos in assembly were fantastic! 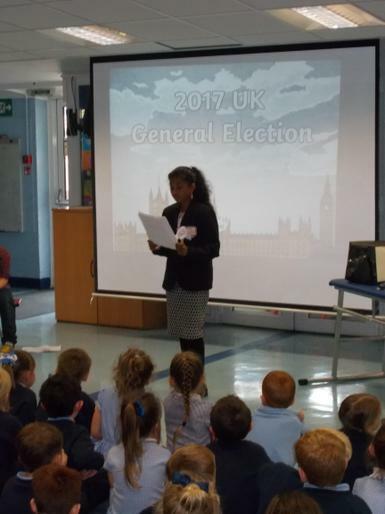 Virtually everyone in the school was saying they didn't know who to vote for, because all the candidates gave such convincing speeches. 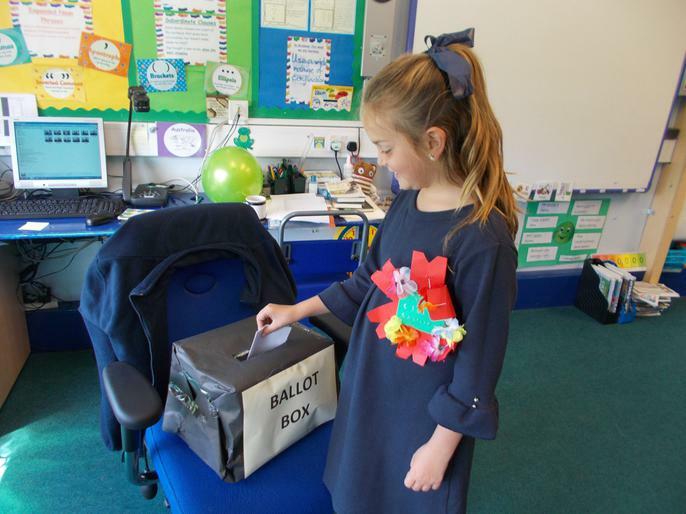 Votes were posted in the ballot box this morning, so now we wait with baited breath for the result to be announced on Friday! 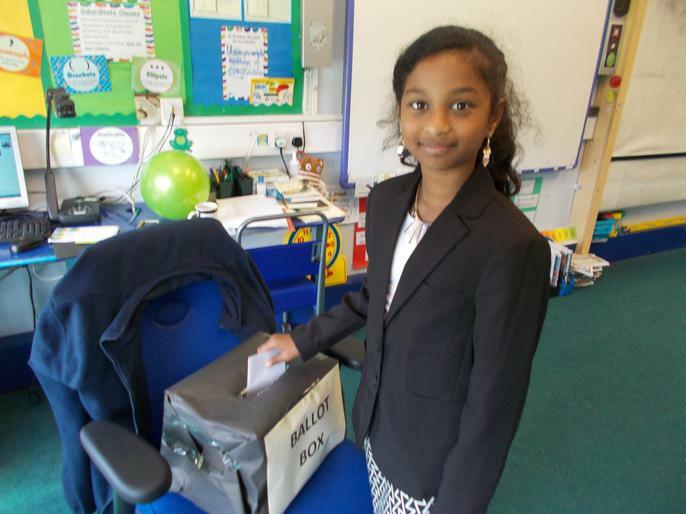 Good luck to all of the candidates! 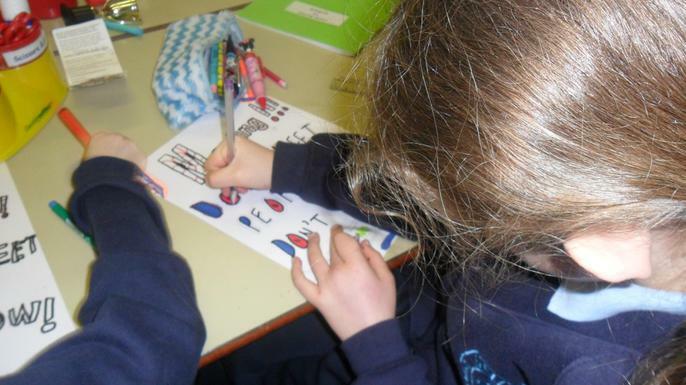 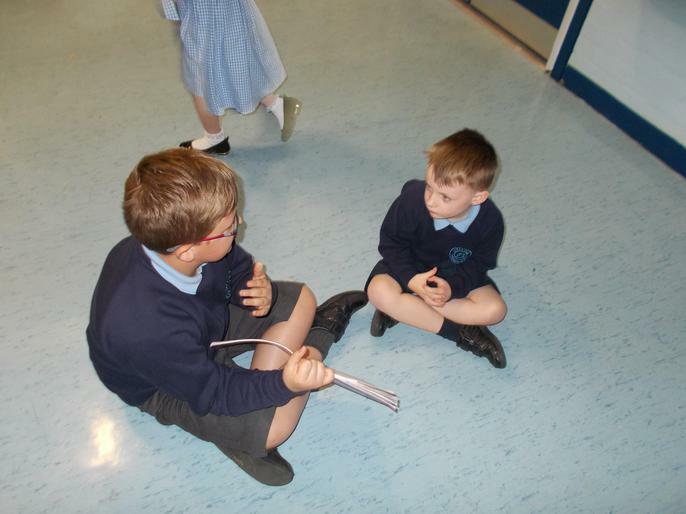 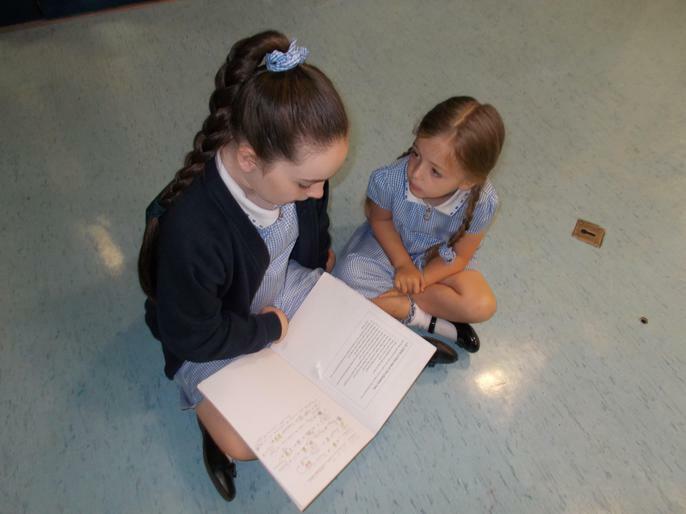 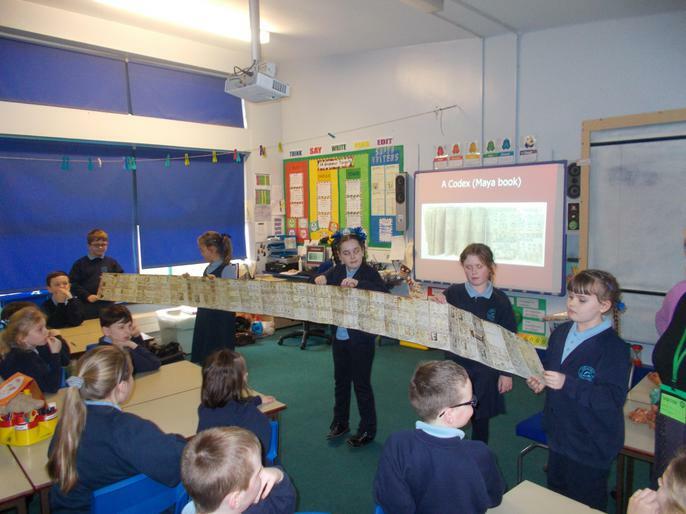 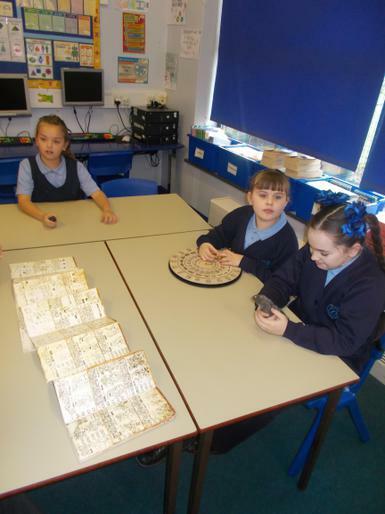 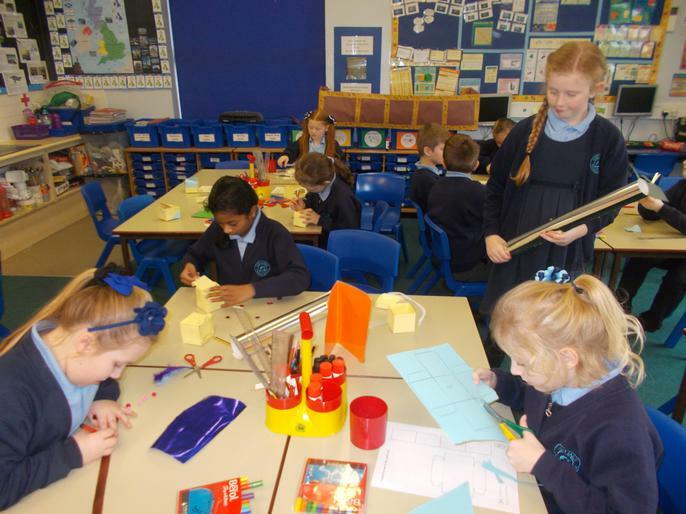 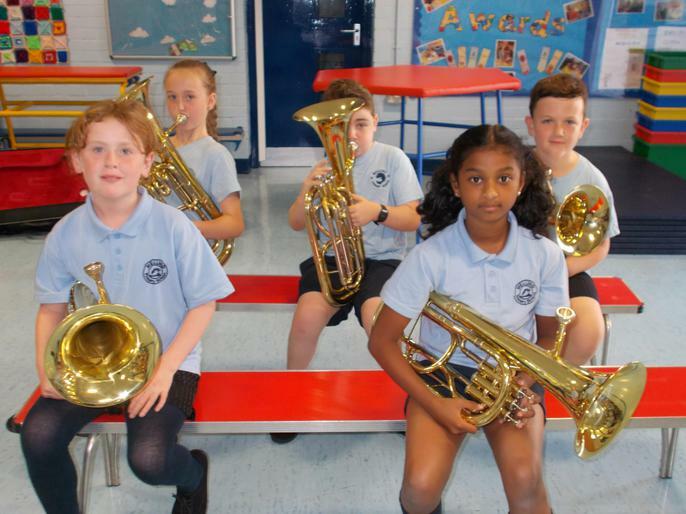 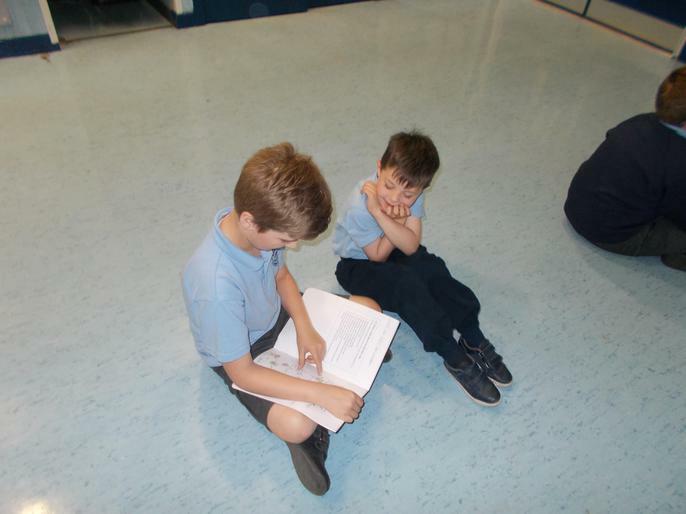 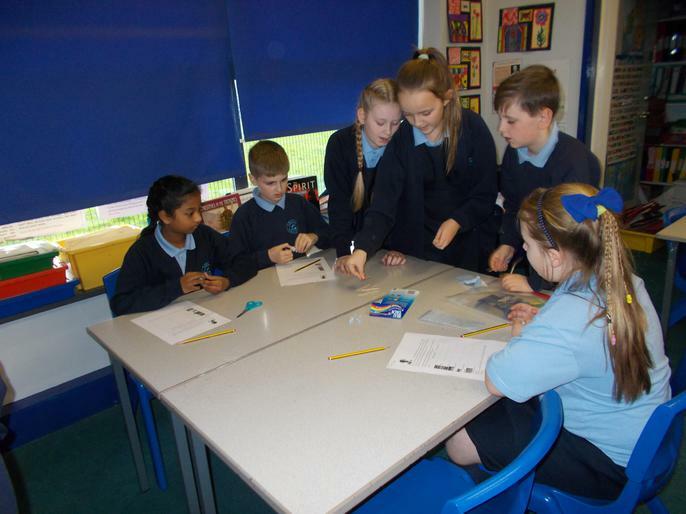 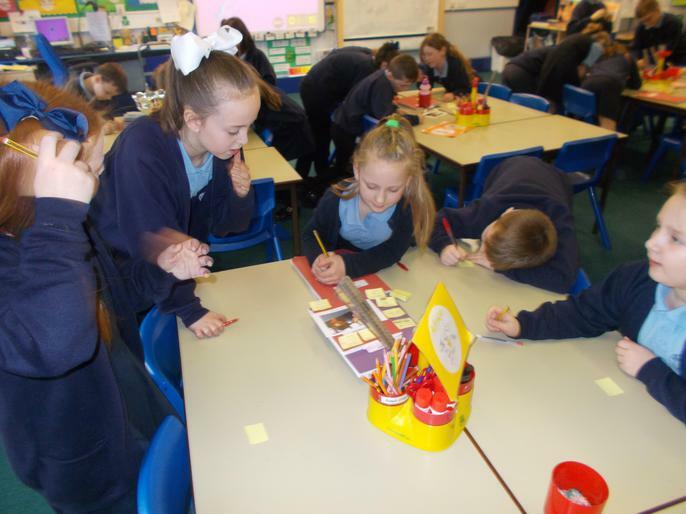 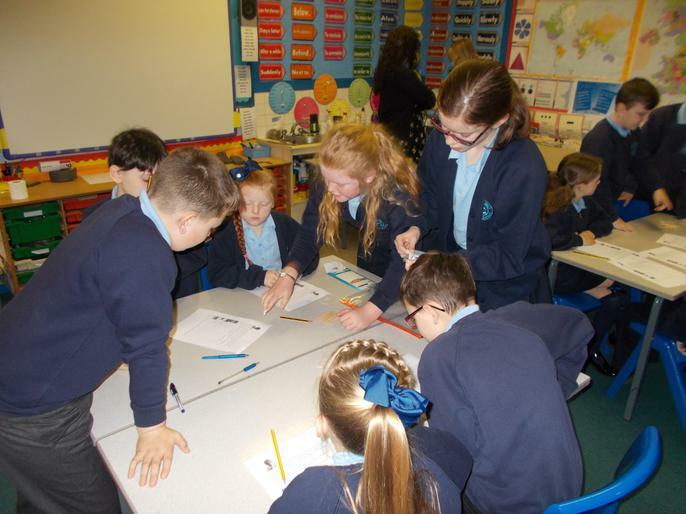 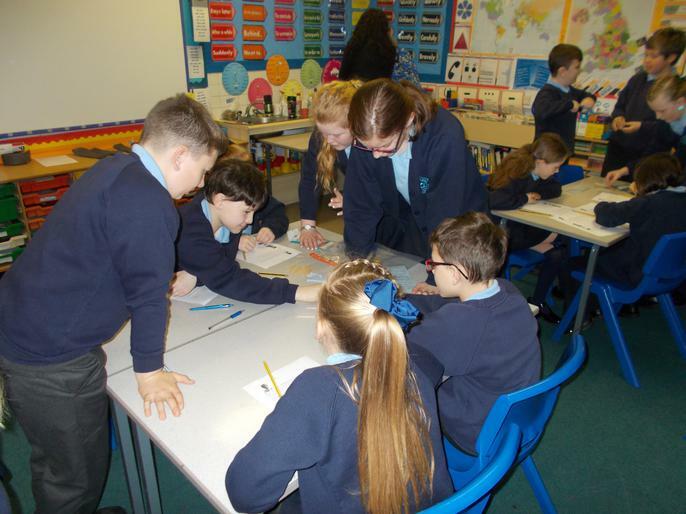 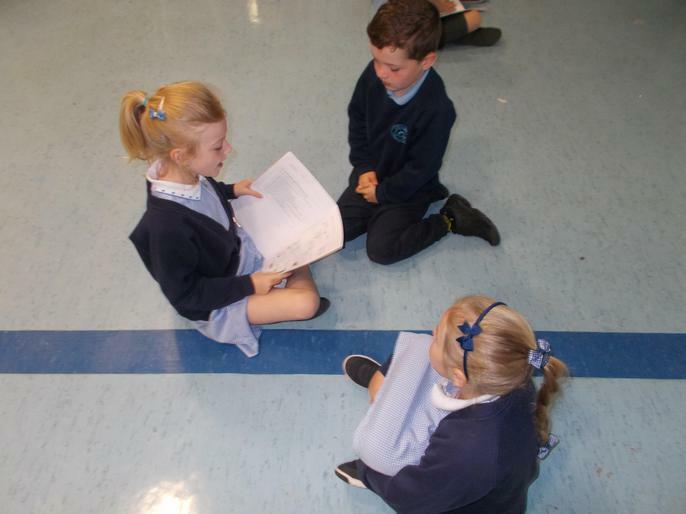 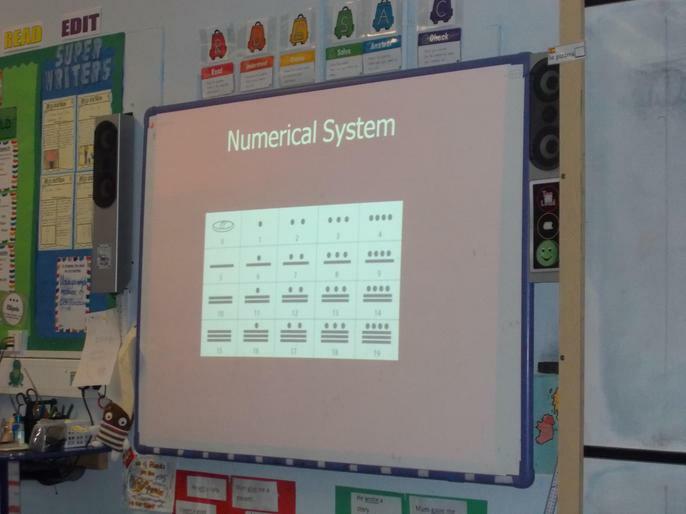 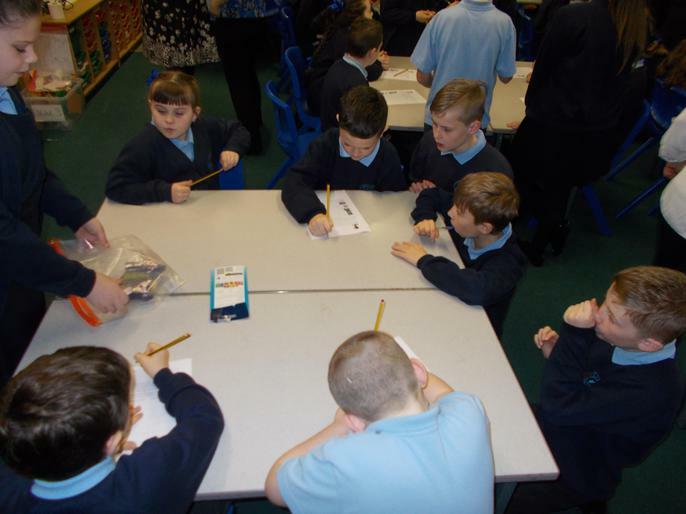 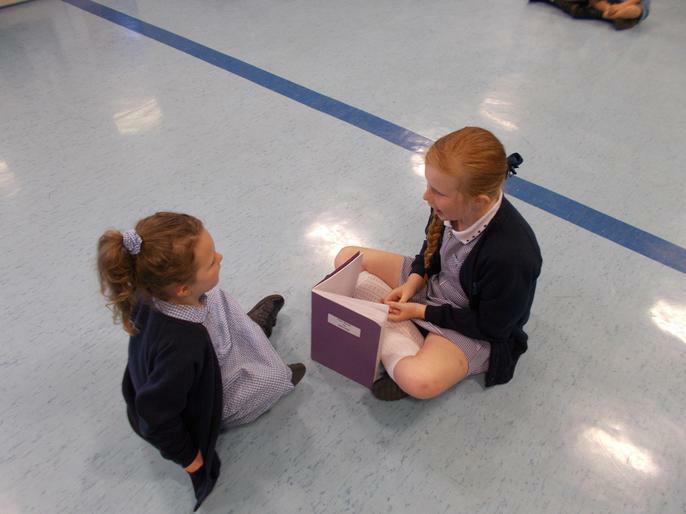 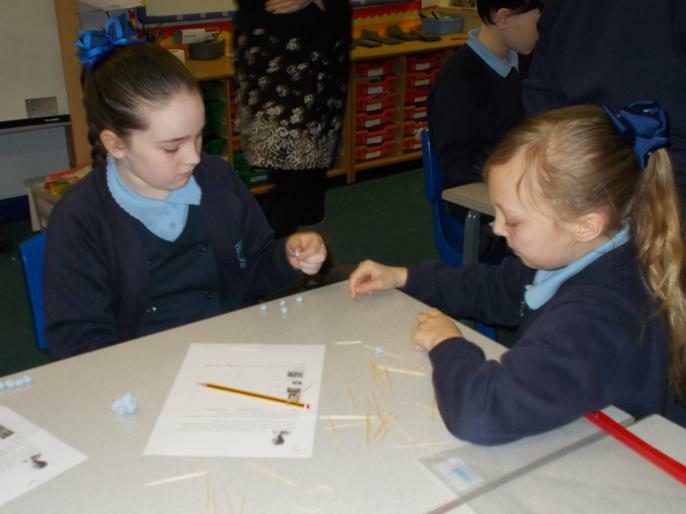 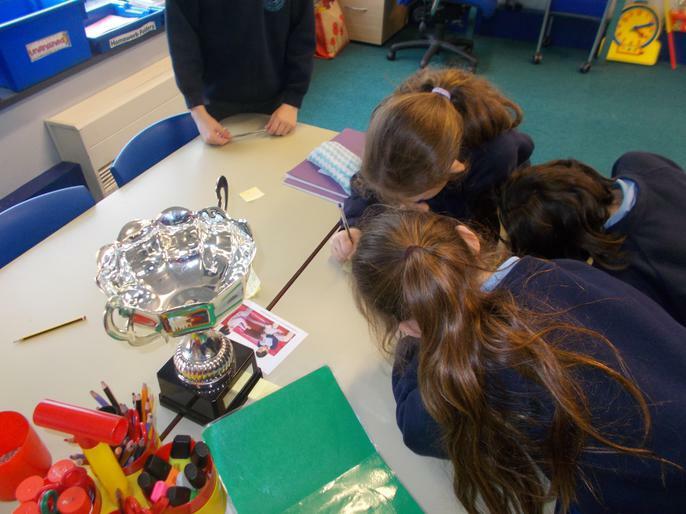 Year 4 have been set a challenge by Miss Hopewell to find Roman numerals out and about in Liverpool, or anywhere in the United Kingdom, during the course of Summer term. 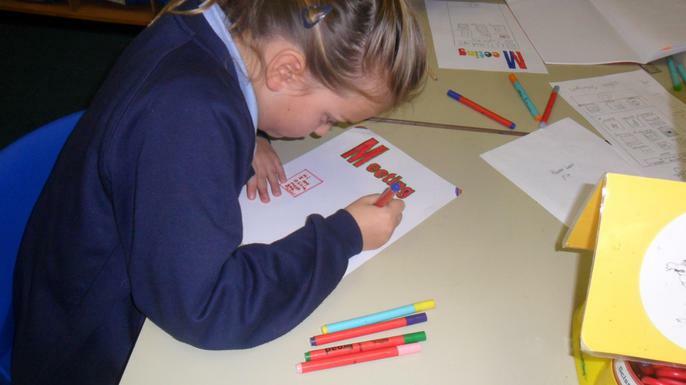 If you spot Roman numerals, take a photograph and bring it into school to earn a team point. 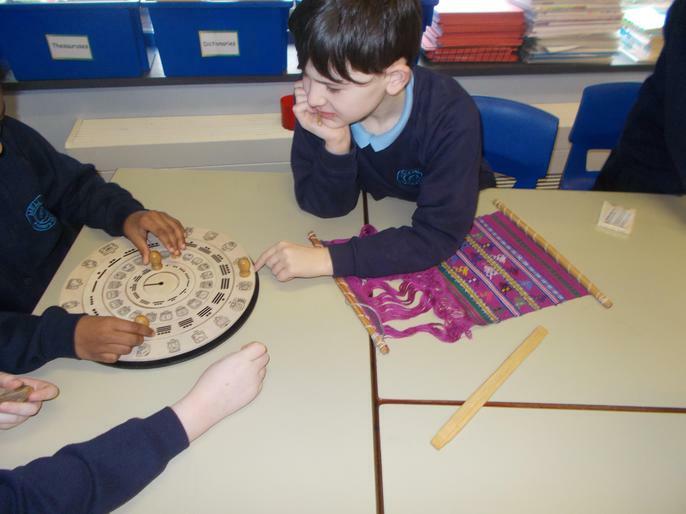 Let's see who can find Roman numerals in the most exciting places! 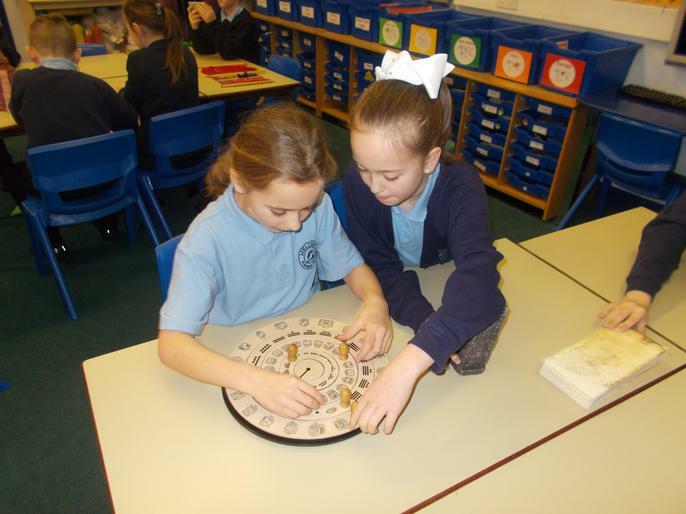 To earn a bigger reward, can you read the Roman numerals you find? 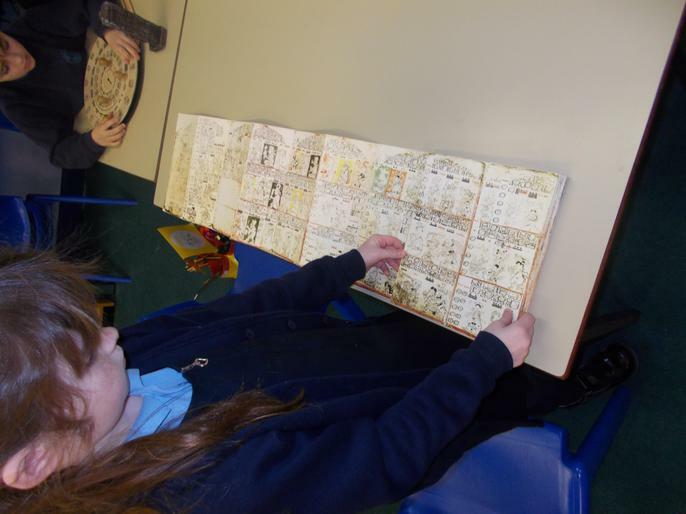 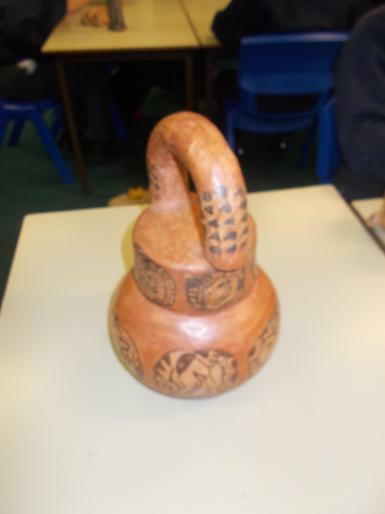 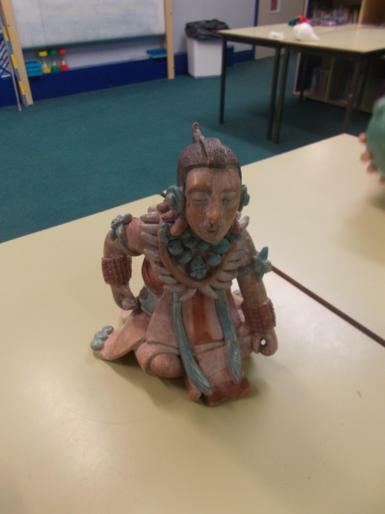 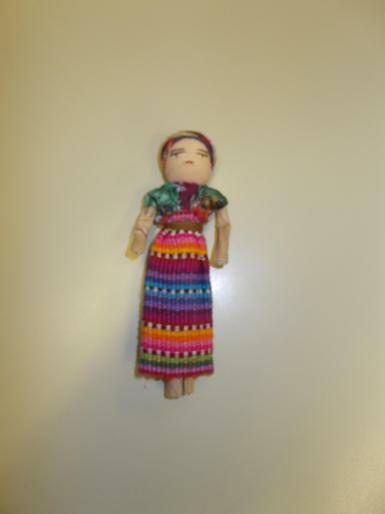 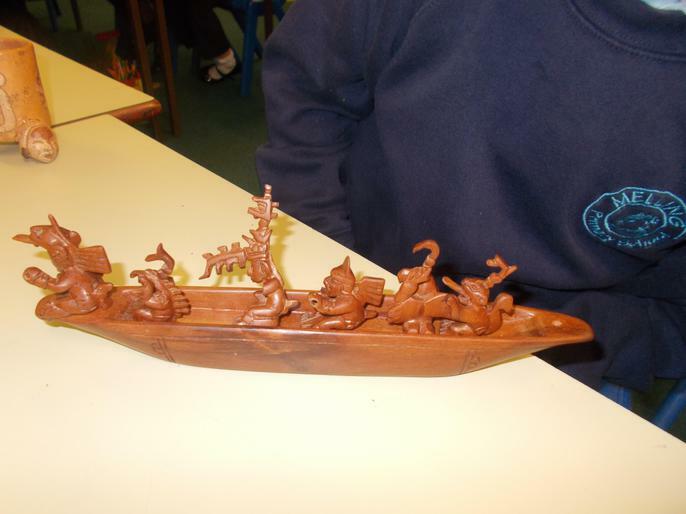 Year 4 have been reading the Maya folktale, The Chocolate Tree. 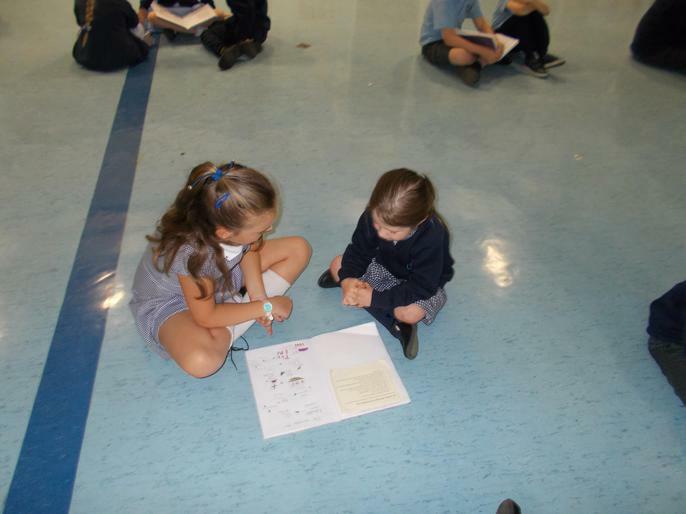 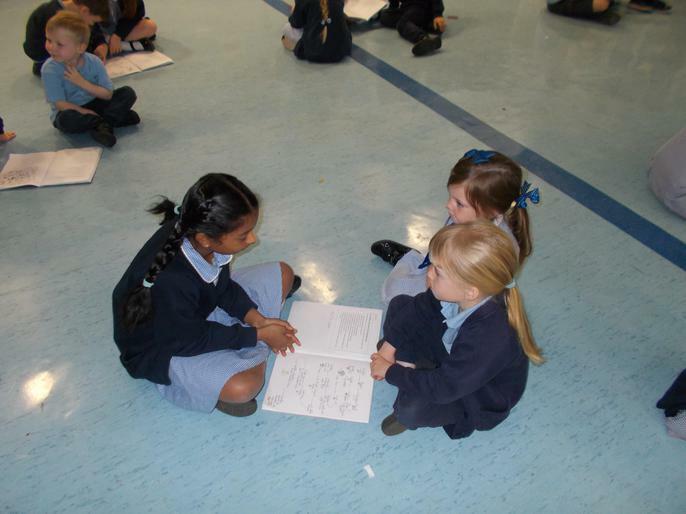 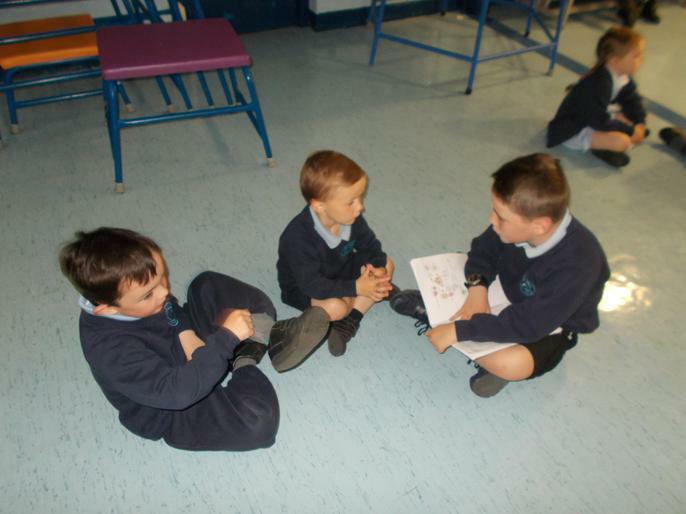 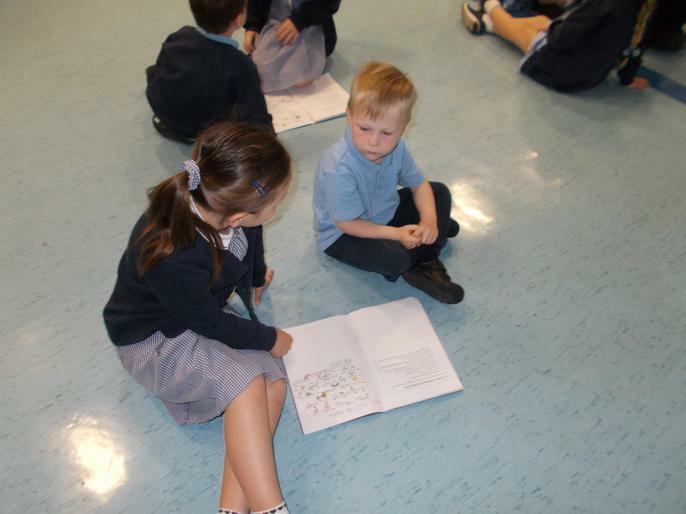 We each made a story map about it and then we sat with YR and told them the story. 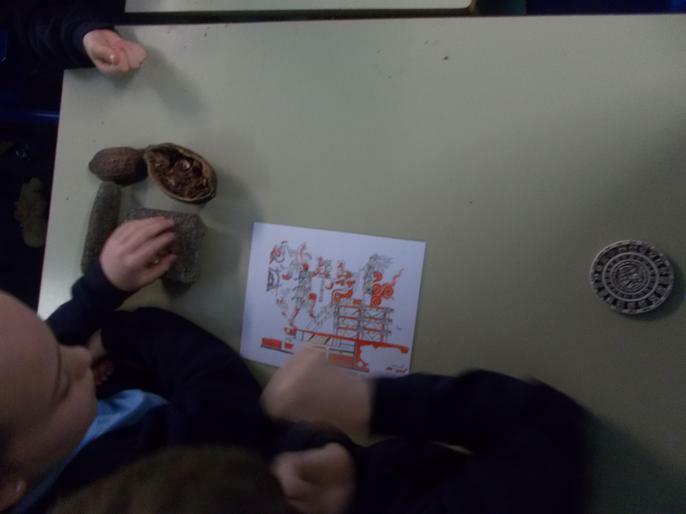 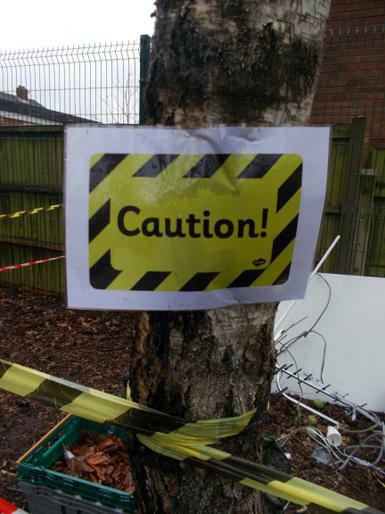 The YR children were all in agreement that they would definitely like to have a chocolate tree in their back garden! 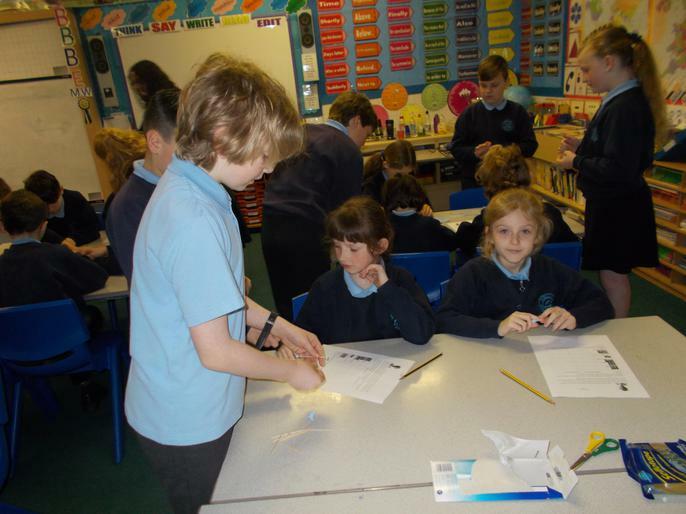 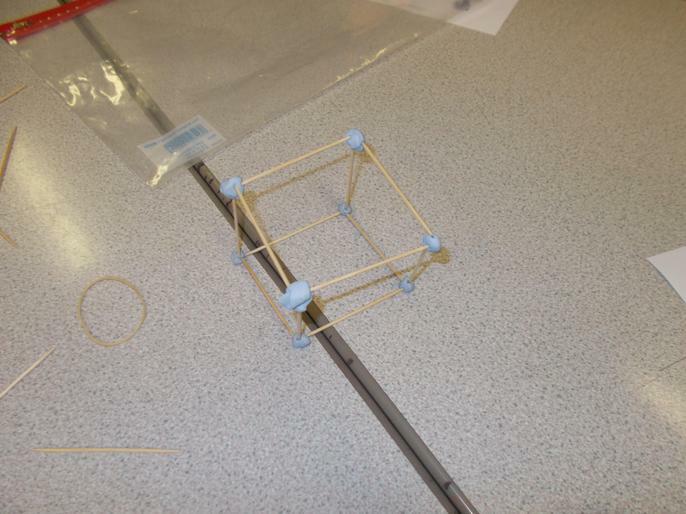 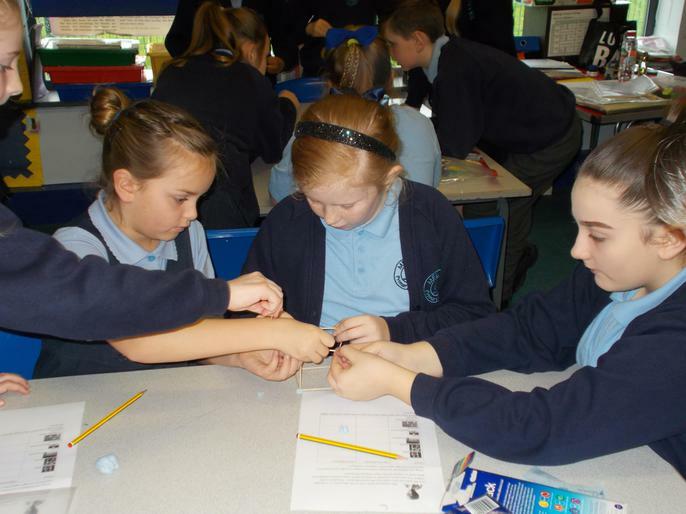 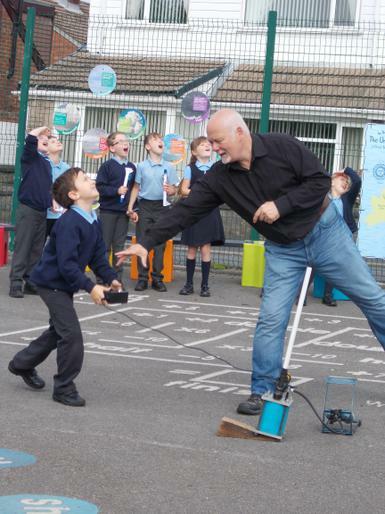 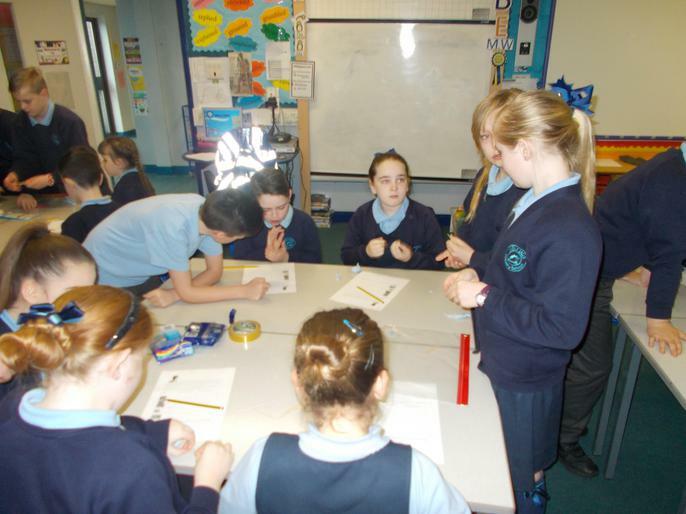 Science Week! 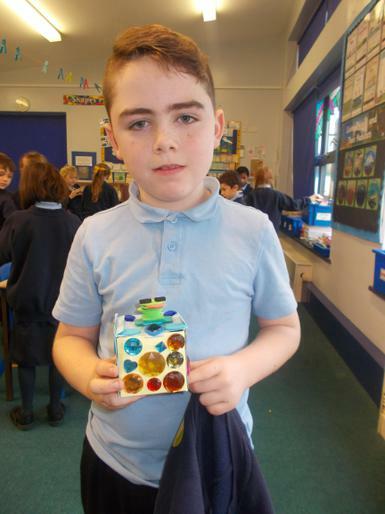 What a great time we had on our alien adventure! 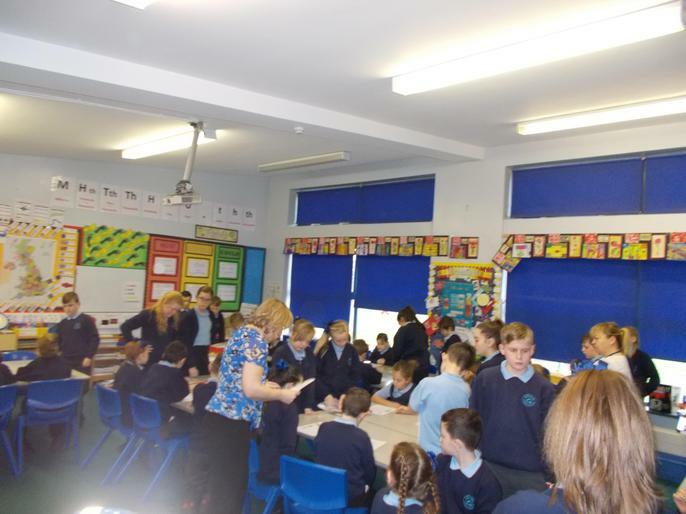 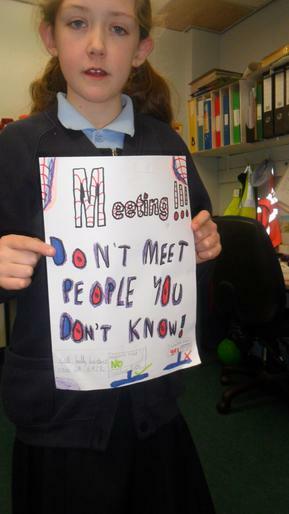 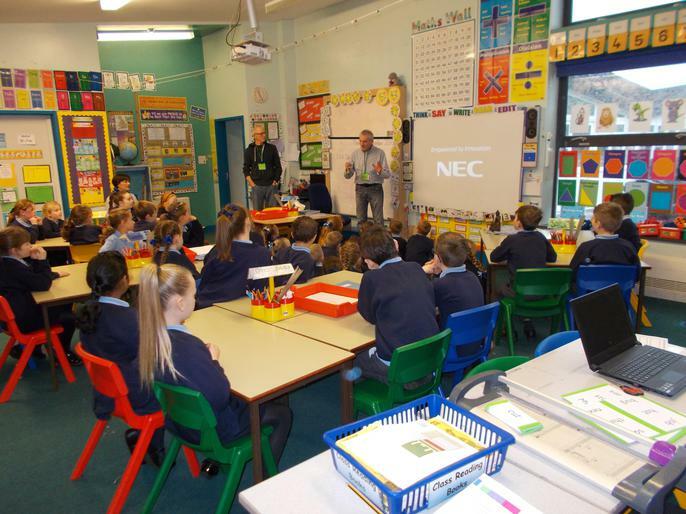 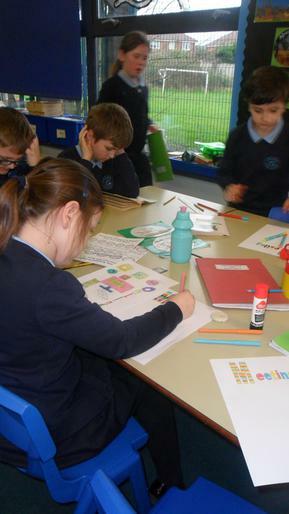 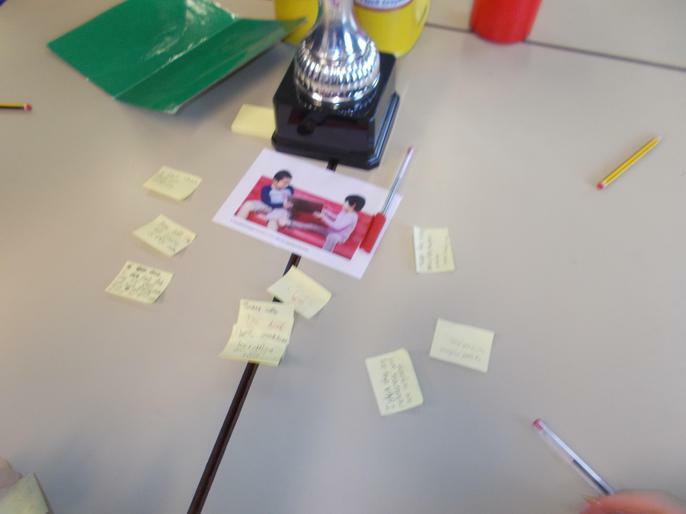 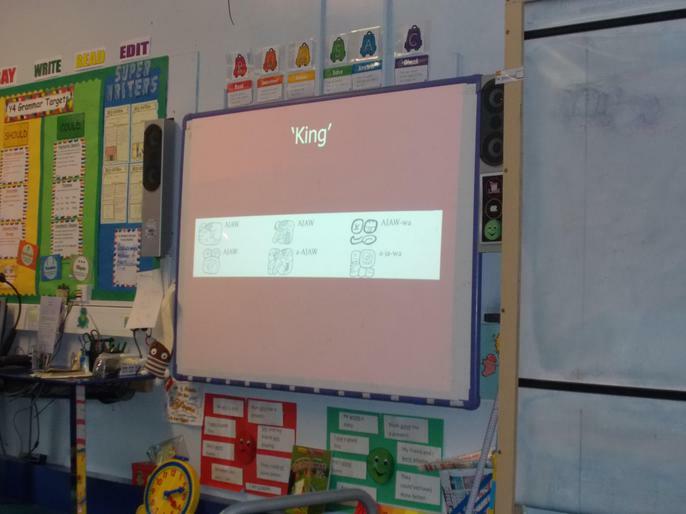 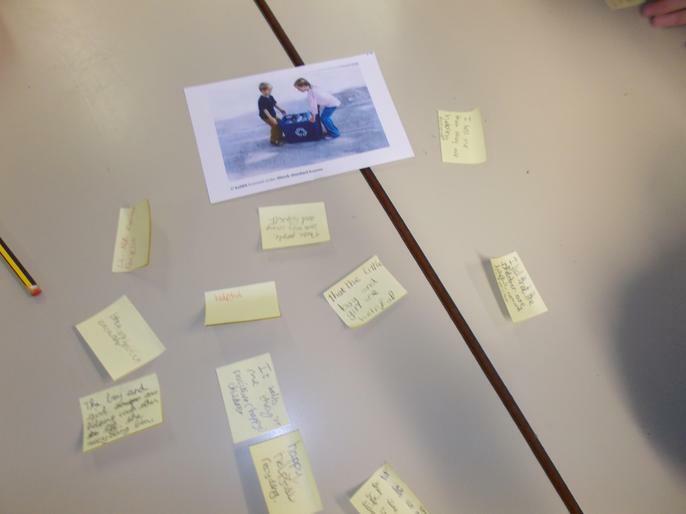 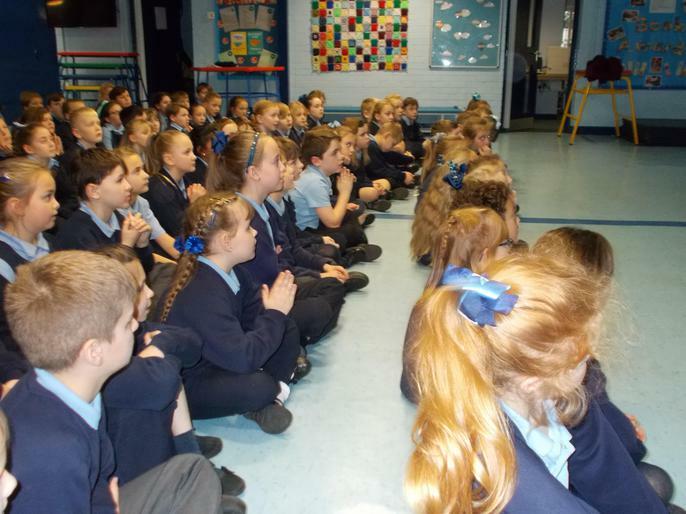 It was E-Safety week this week in Melling and our focus was safety online. 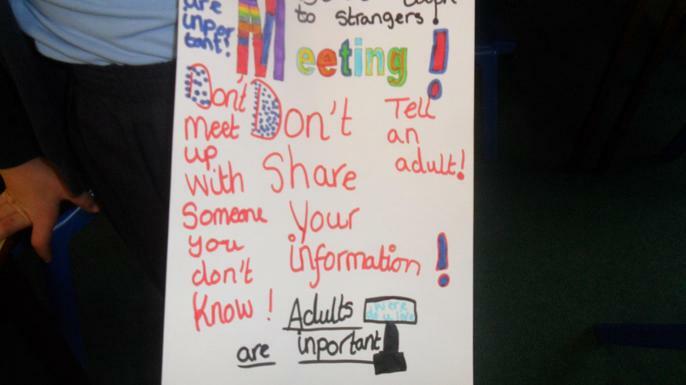 We discussed the dangers of meeting people we have met online and don't know in real life. 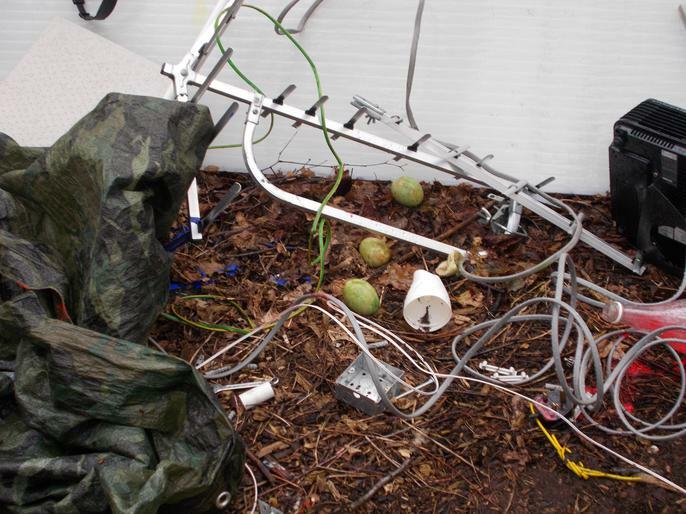 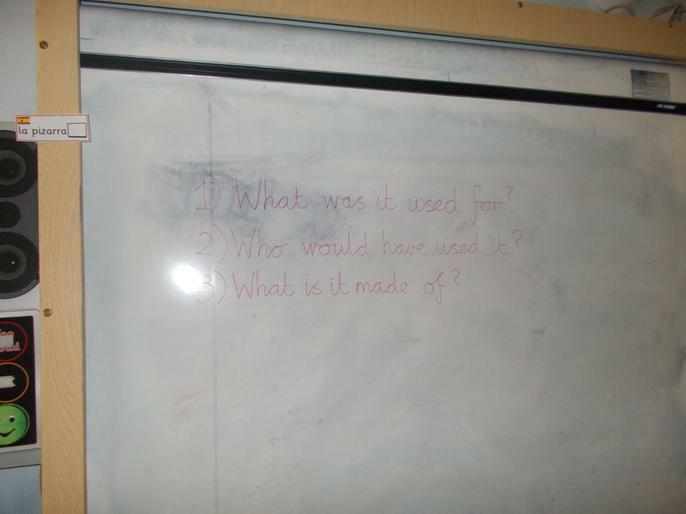 We also looked at images we posted online and how even if we delete them, they stay online forever. 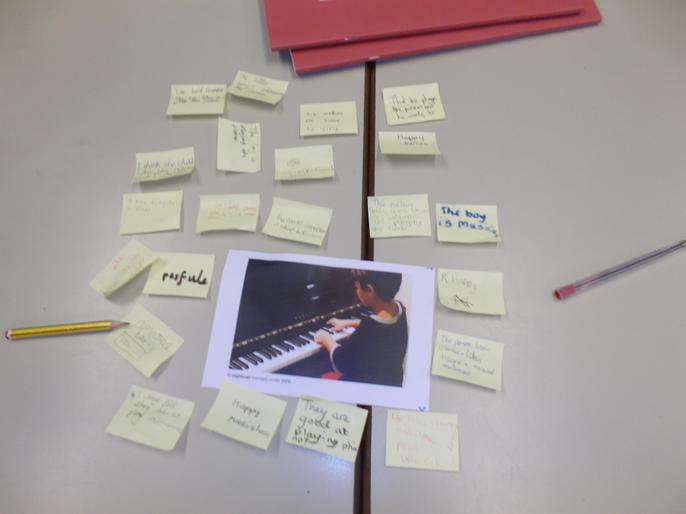 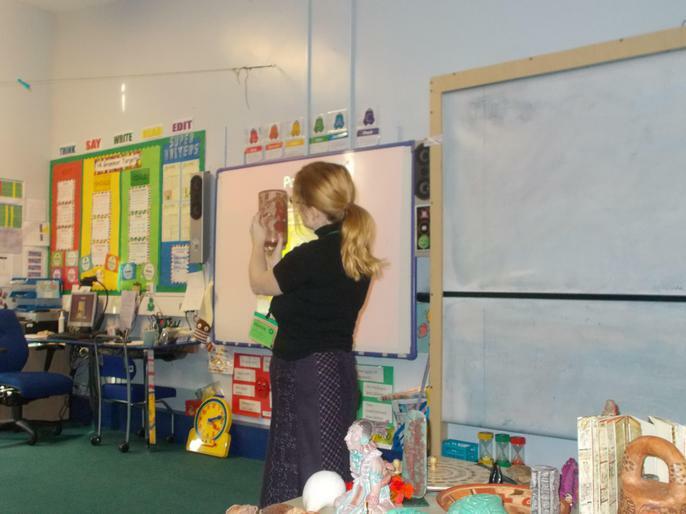 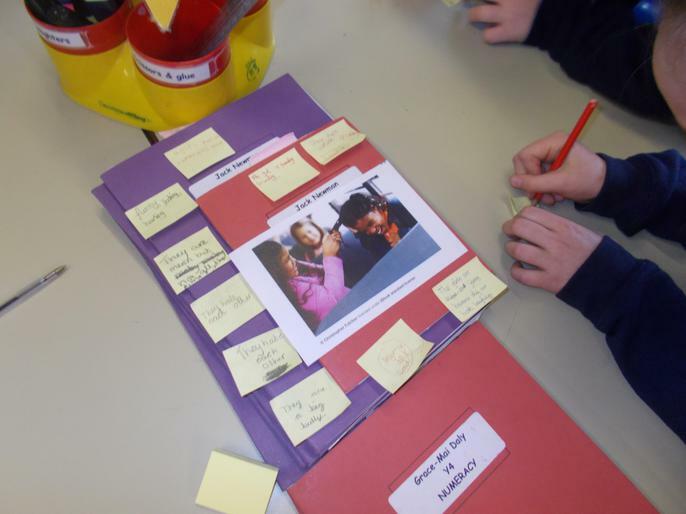 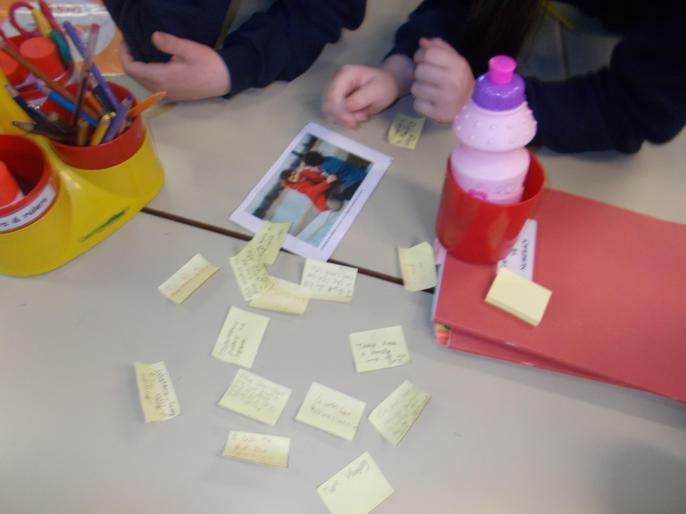 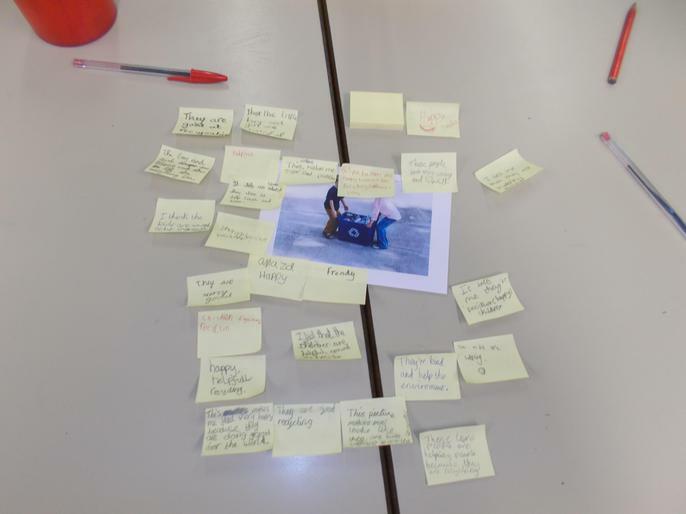 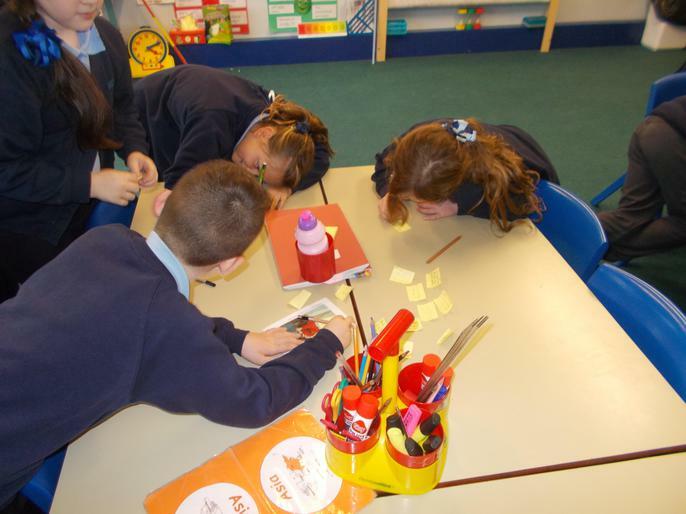 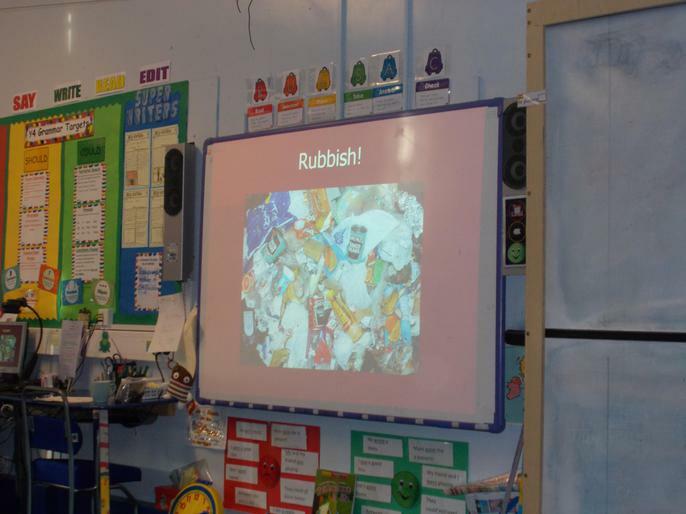 We looked at some images of other children and talked about what that image made us think about the people. 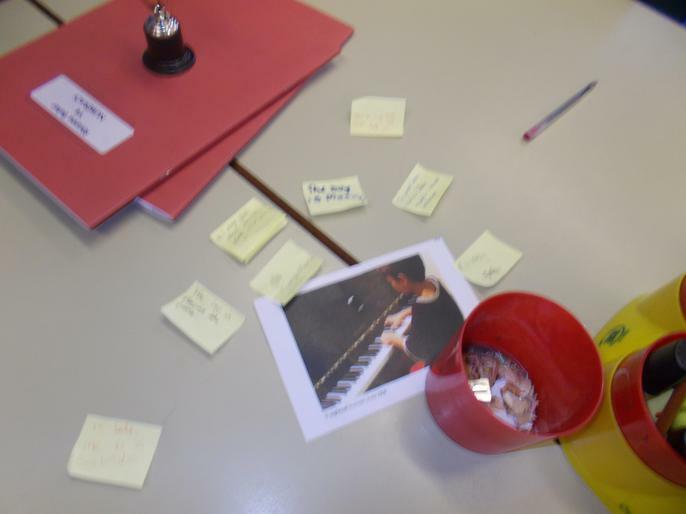 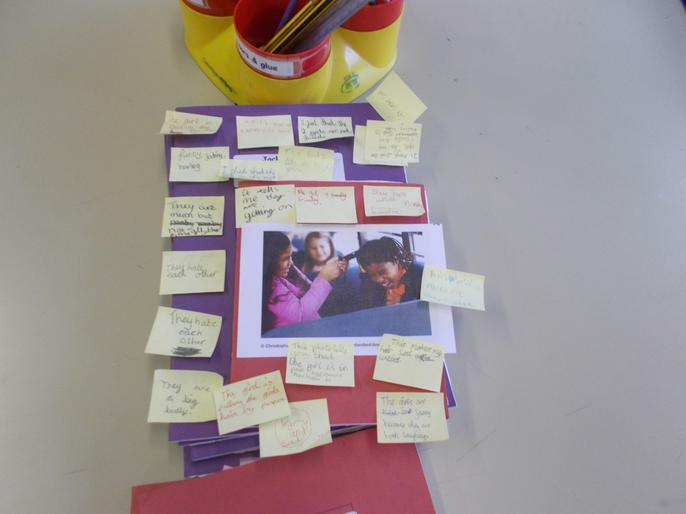 Then we used that to help us write some top tips for posting images online. 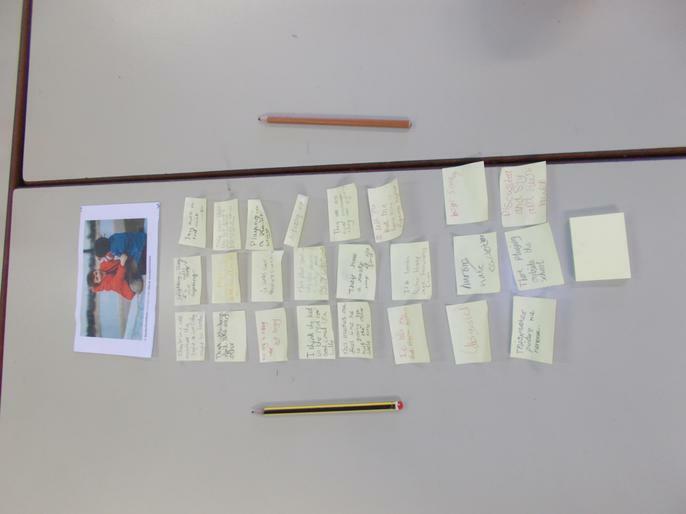 Everyone really enjoyed this topic and gave such sensible ideas and contributions to discussion. 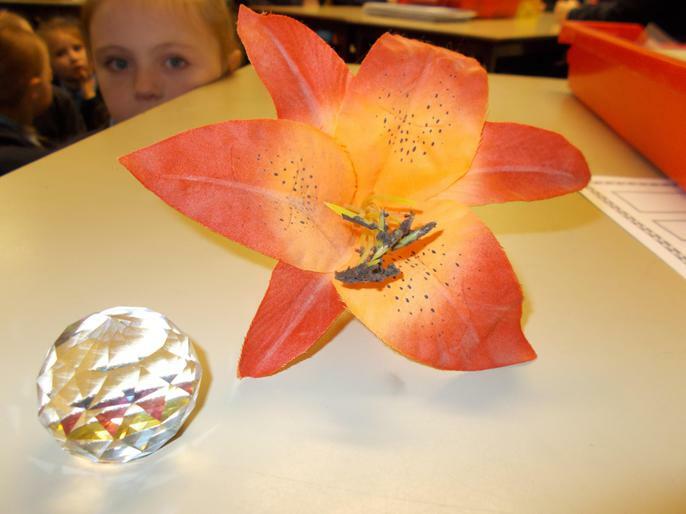 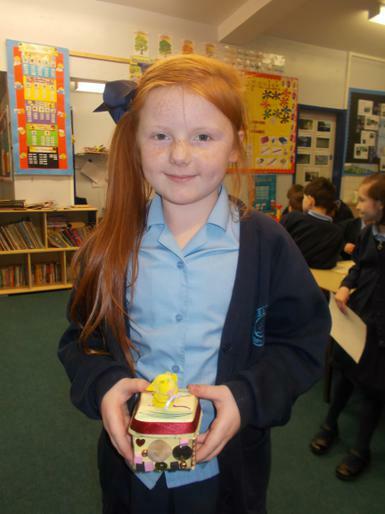 We are currently learning about living things and their habitats in Science. 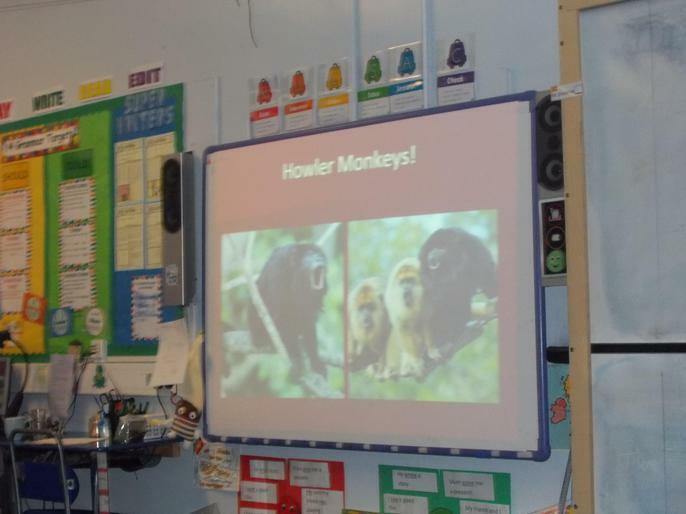 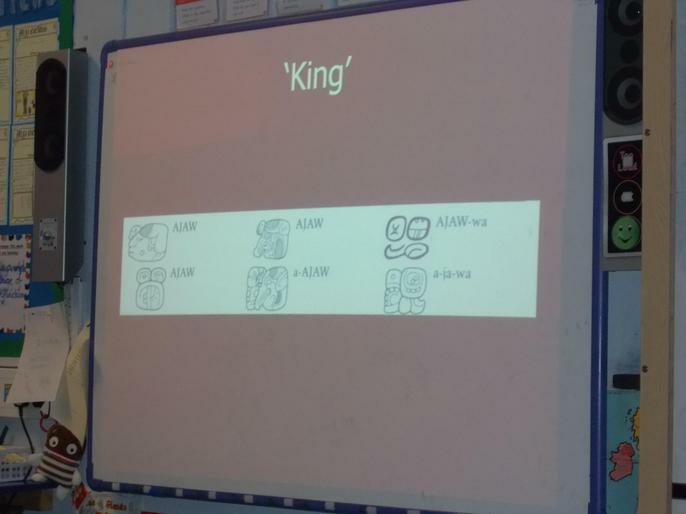 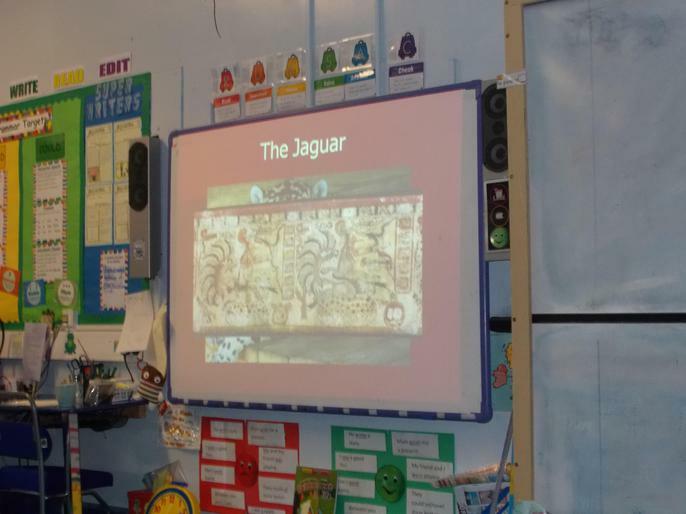 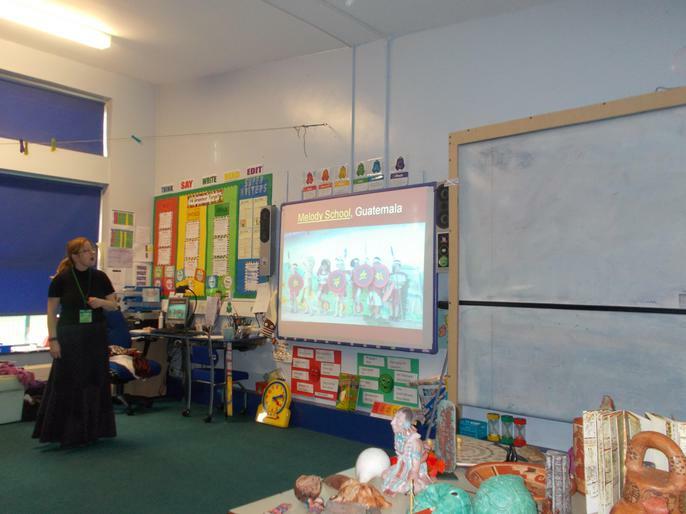 As we are also learning about the Maya civilisation, who lived in the rainforests in Central America, we are going to explore the creatures and habitats which exist in those locations. 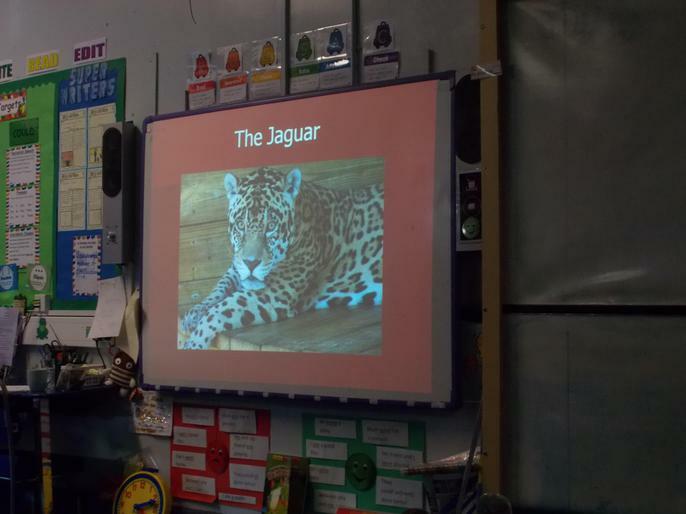 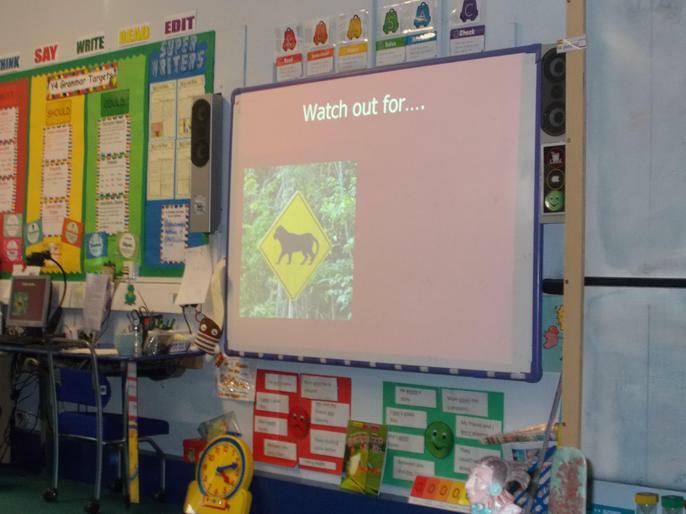 Therefore, we are going to Chester Zoo on the 27th of April to do a rainforest workshop. 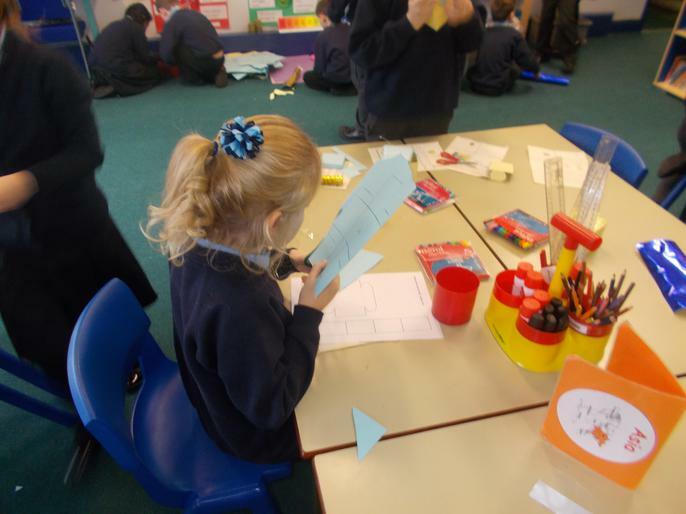 A letter will be sent out shortly. 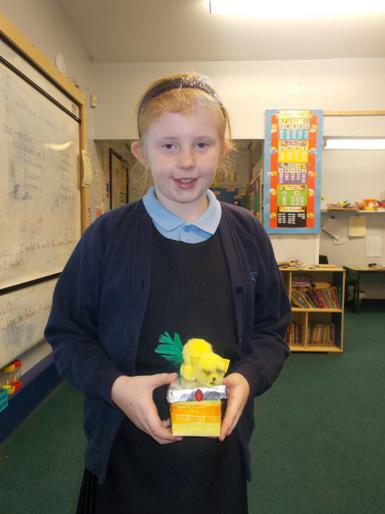 We had another fantastic book review today from one of our Reading Champions. 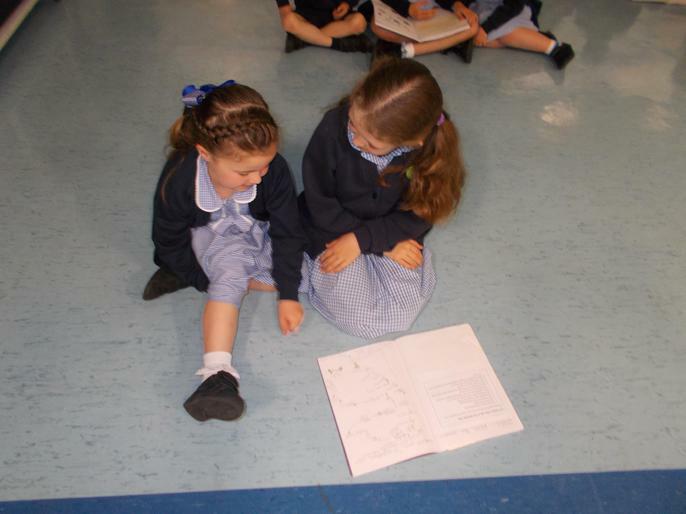 The whole class are now very keen to borrow the book! 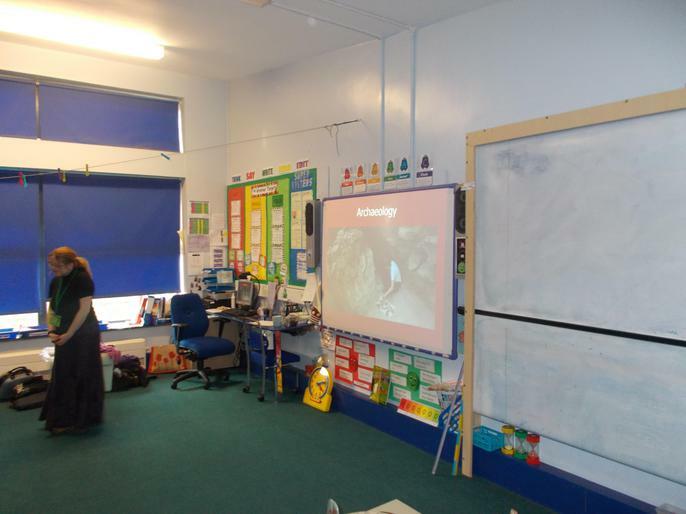 Today we were extremely lucky to have a visit from a real life archaeologist. 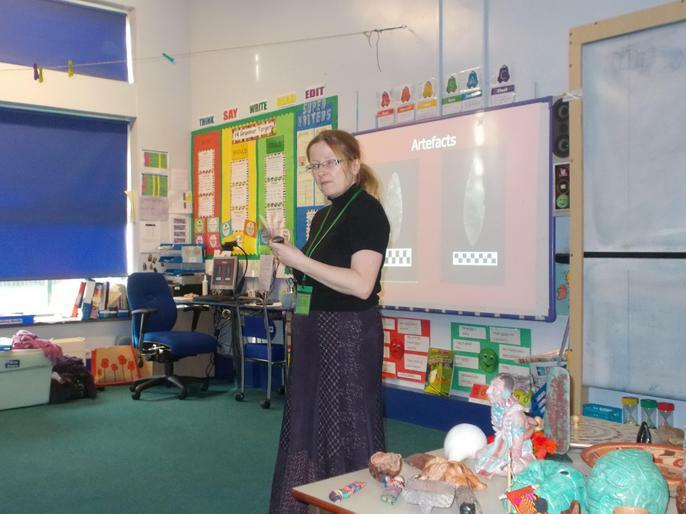 Dr Diane Davies is the only archaeologist in Britain who specialises in the Maya civilisation. 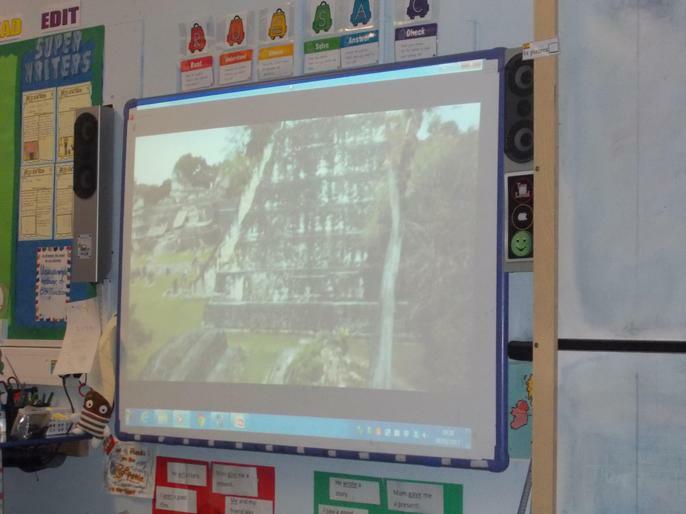 She spends three months of every year living in the rainforest in Guatemala, excavating Maya sites. 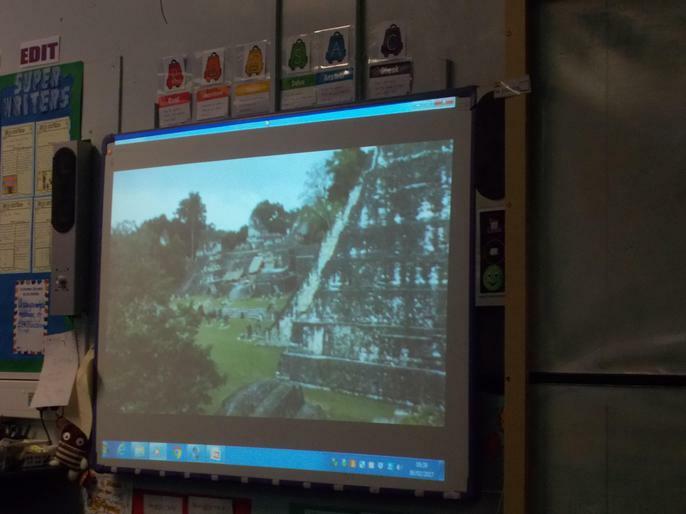 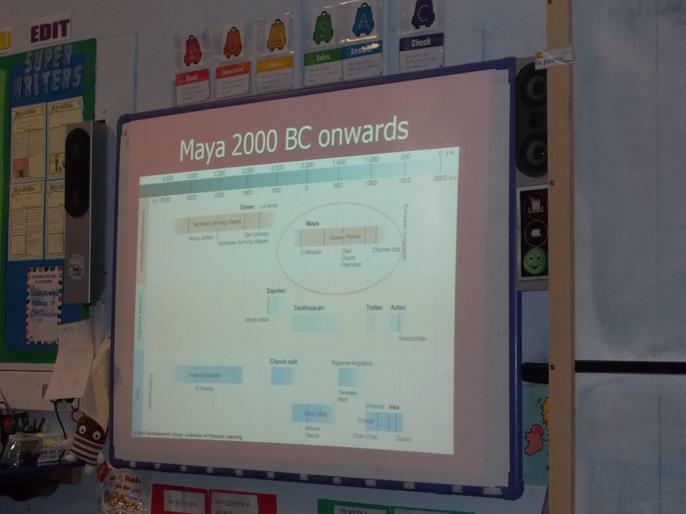 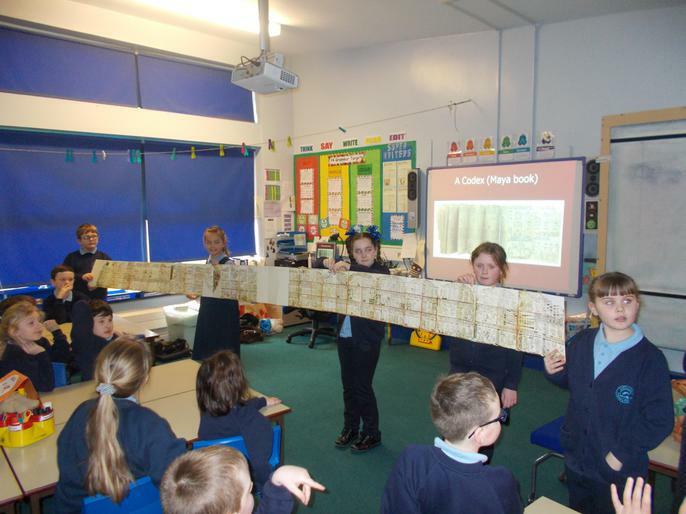 We learnt all about what it's like to live in the rainforest and about what a fantastic civilisation the Maya were. 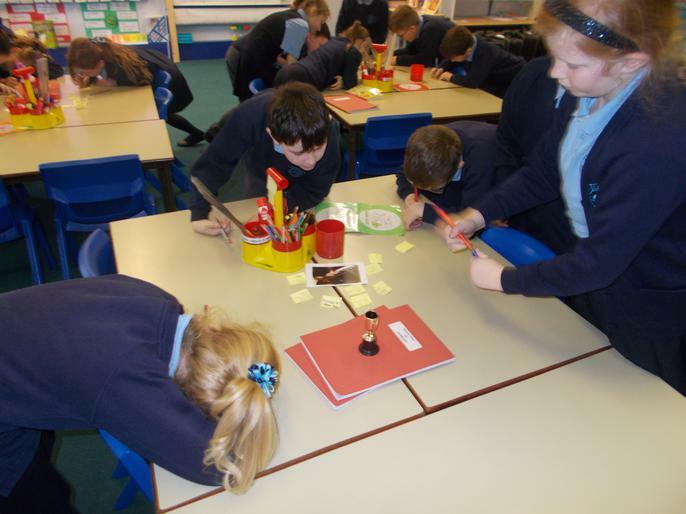 They were amazing inventors and we now know that we have them to thank for inventing chocolate! 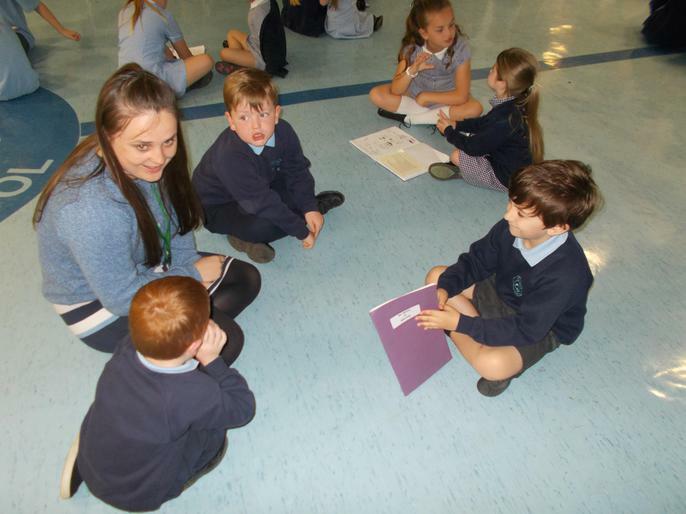 What a fantastic morning we had! 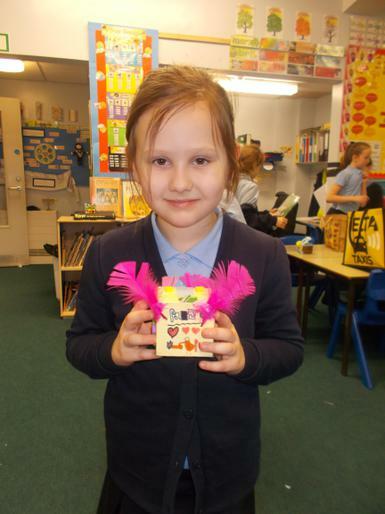 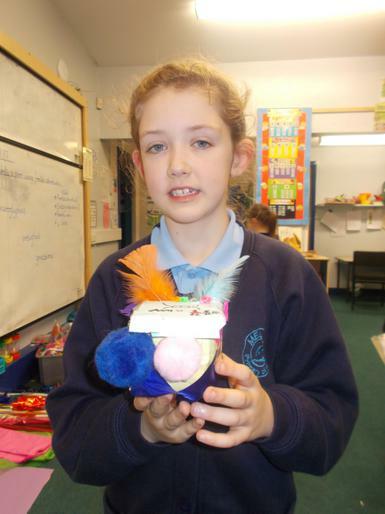 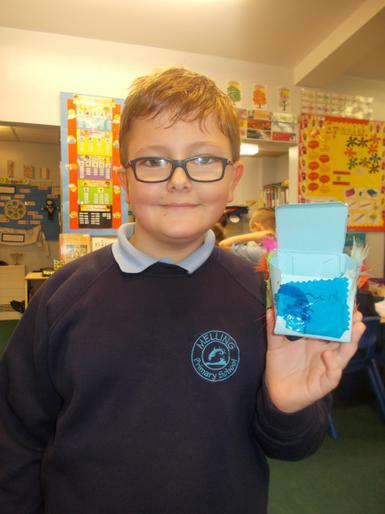 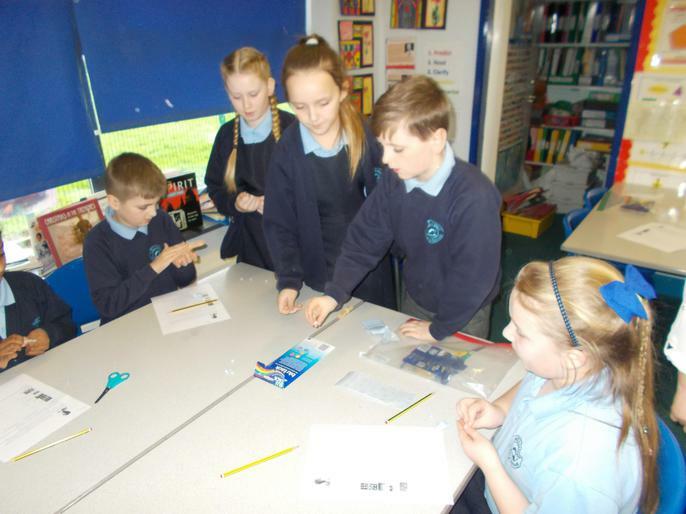 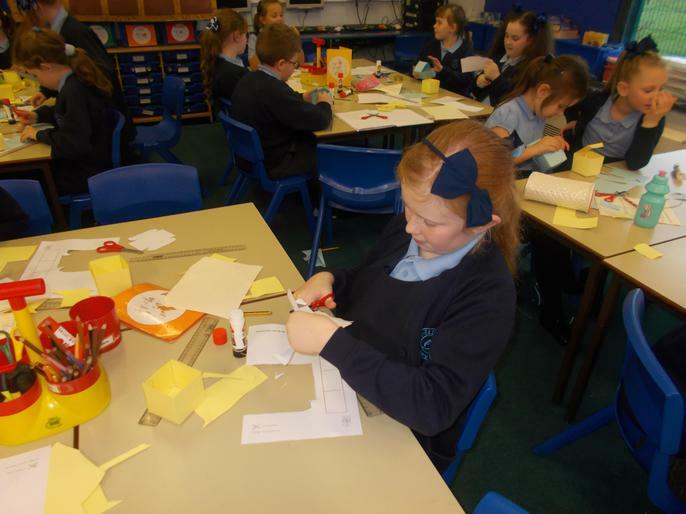 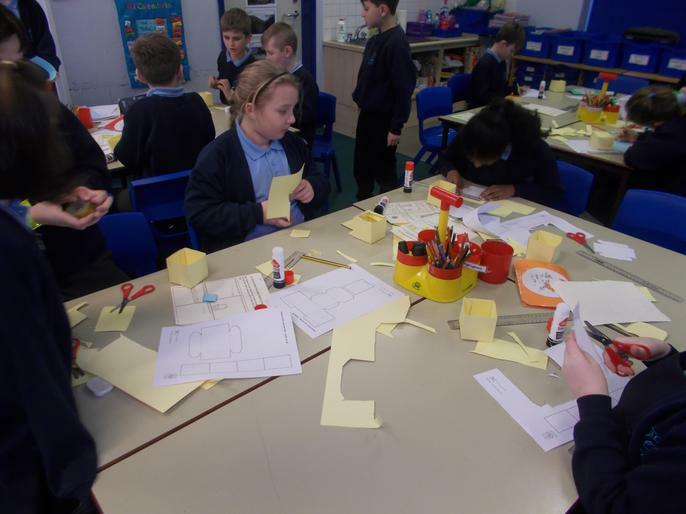 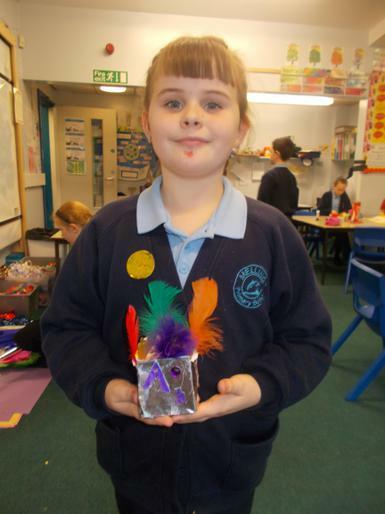 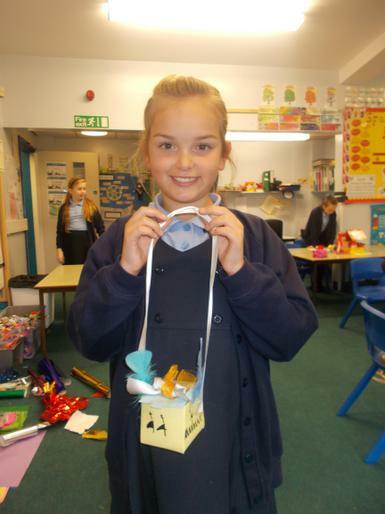 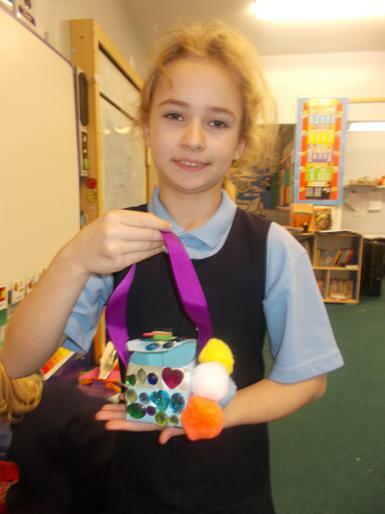 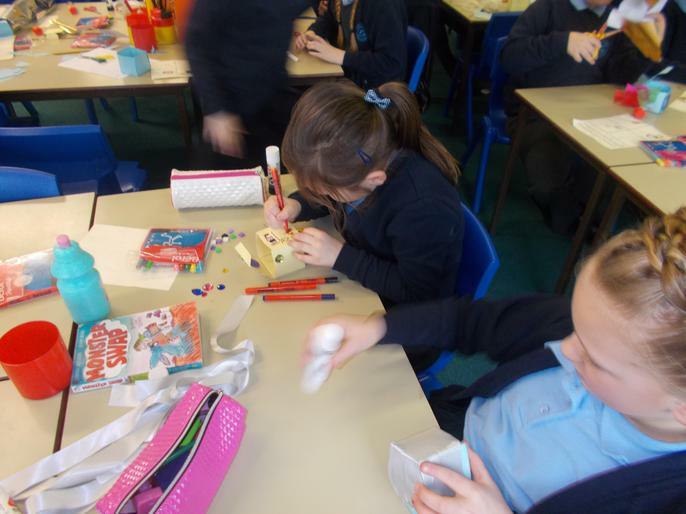 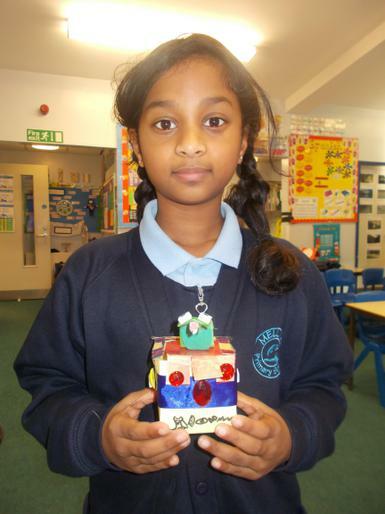 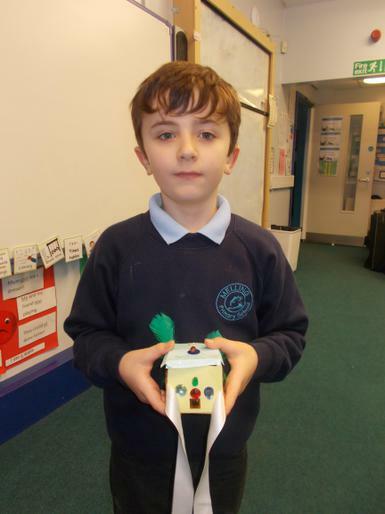 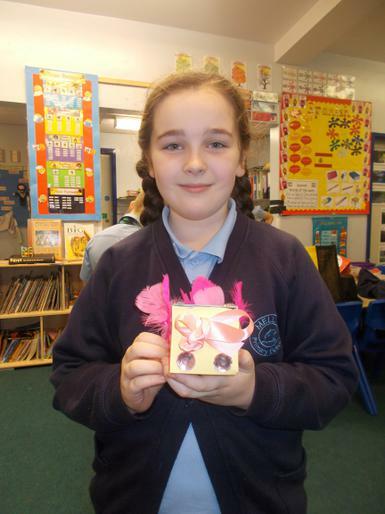 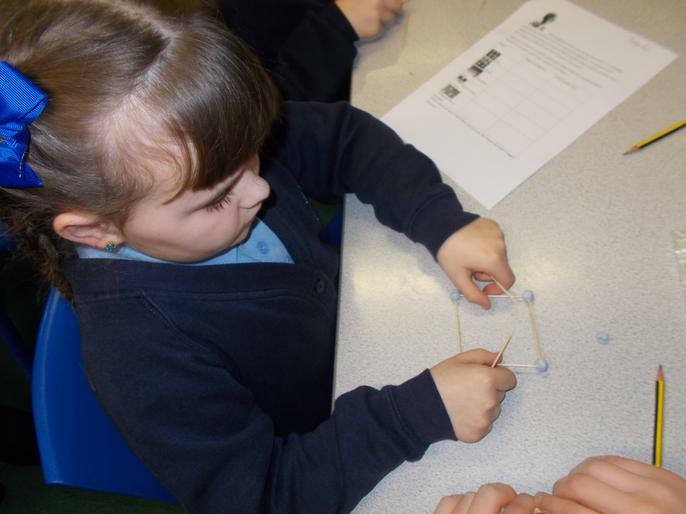 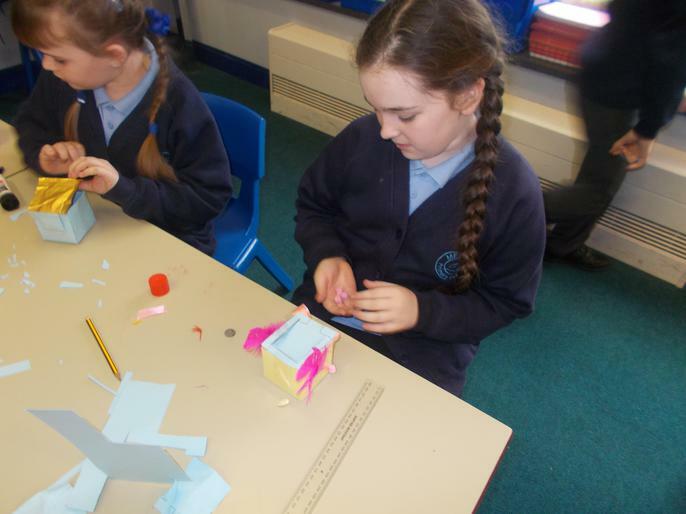 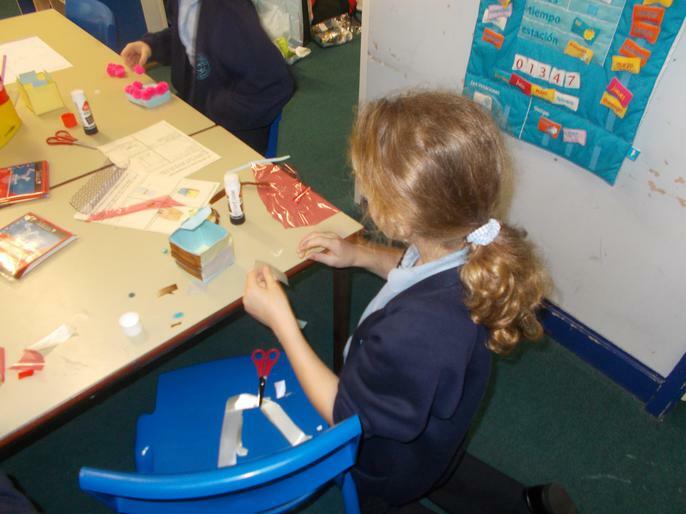 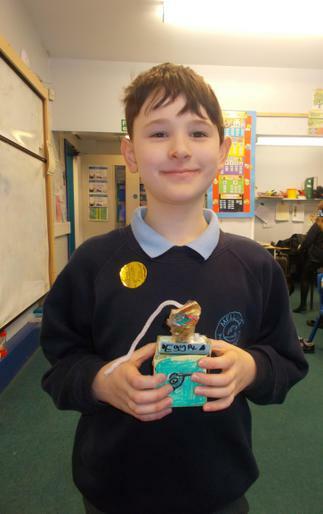 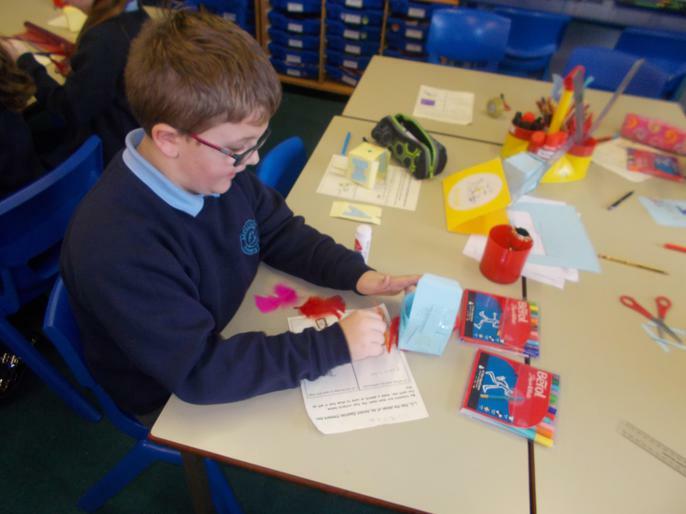 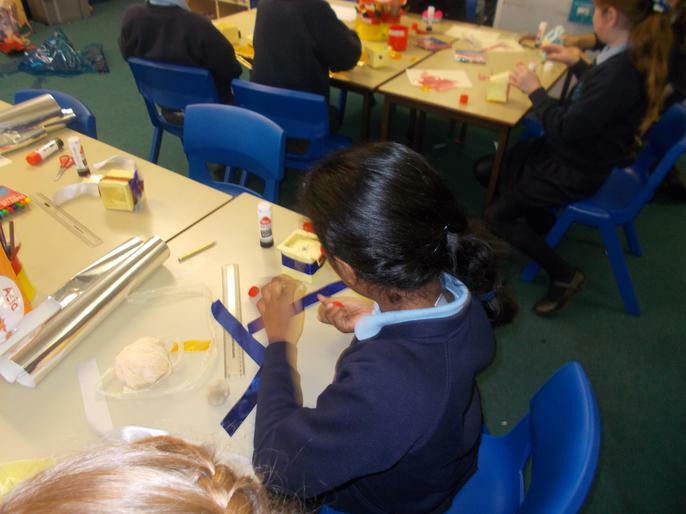 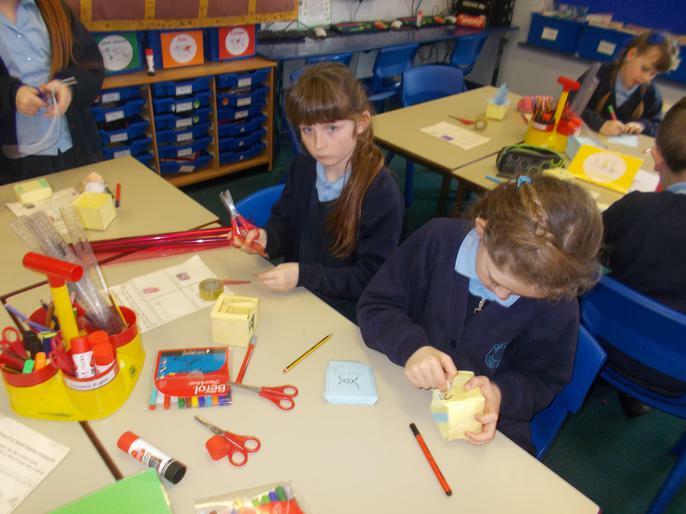 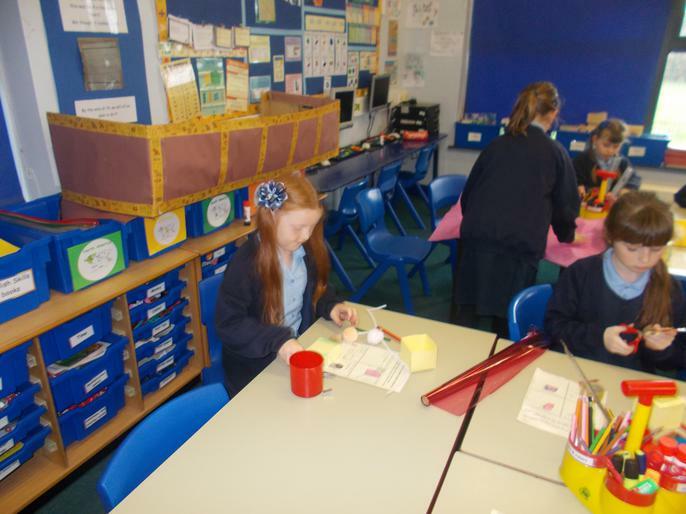 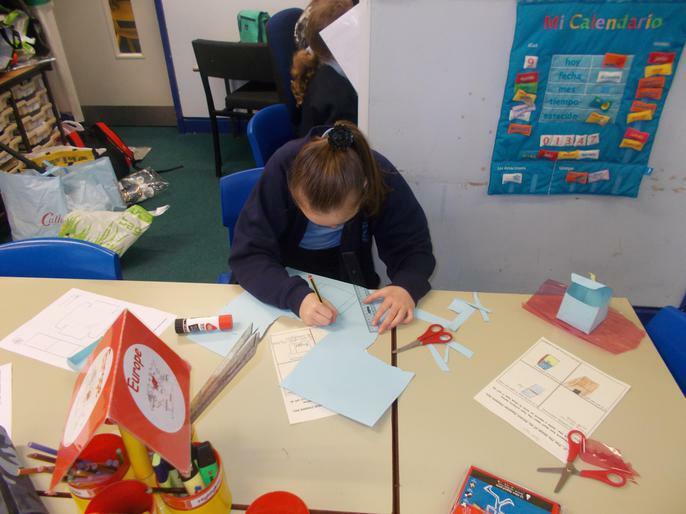 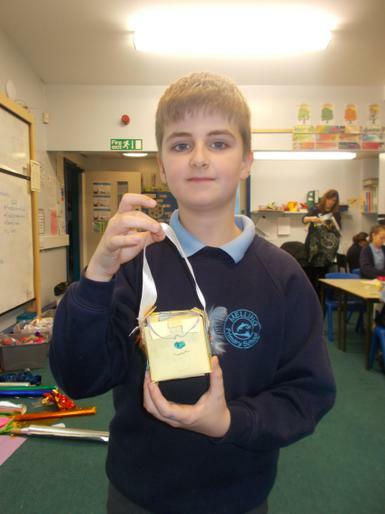 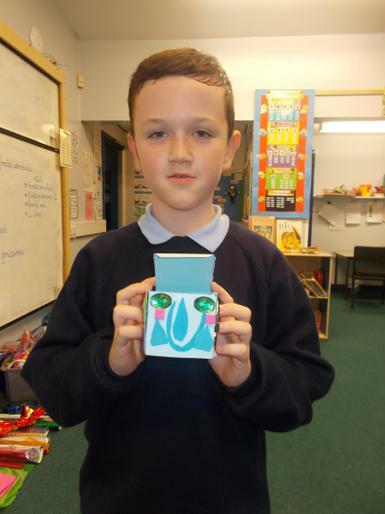 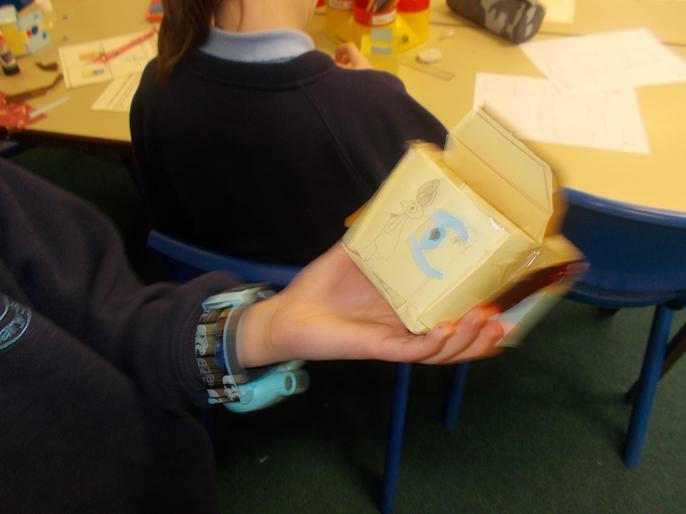 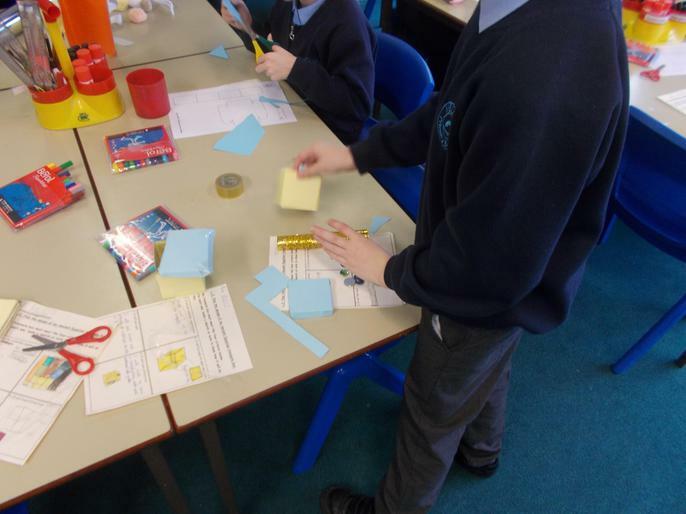 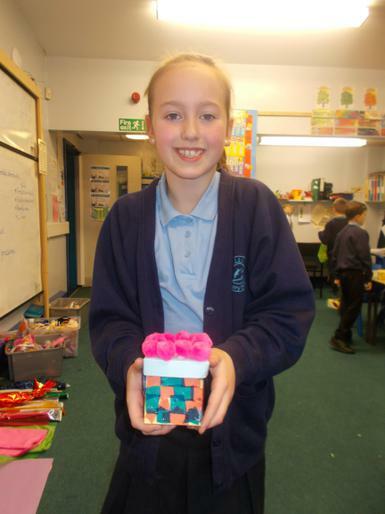 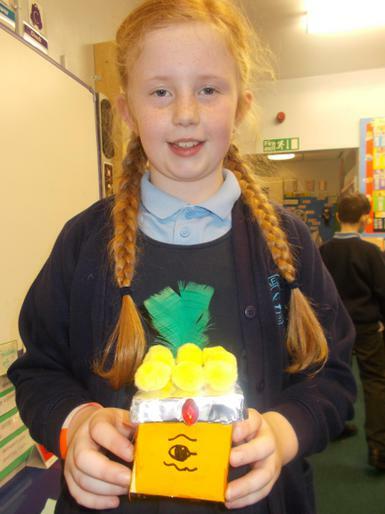 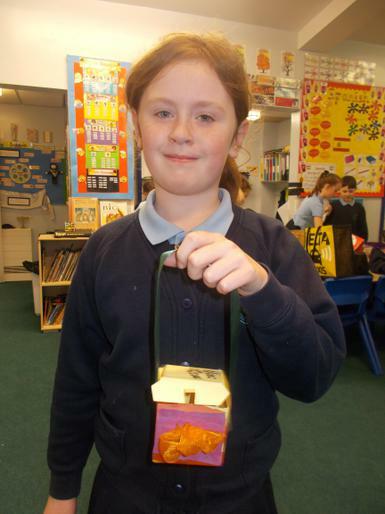 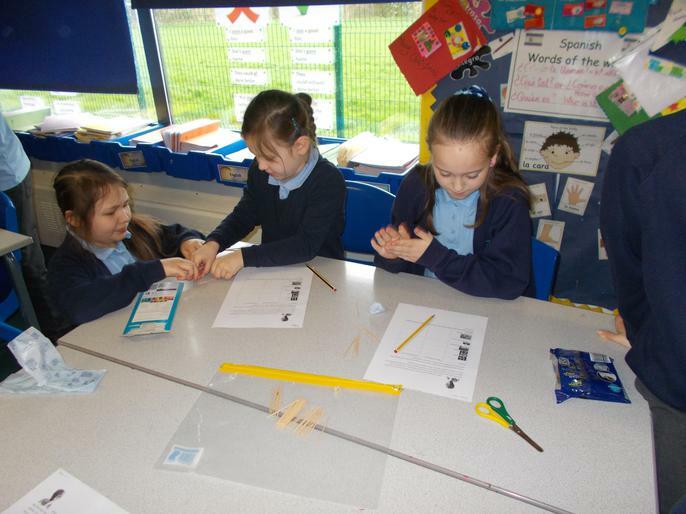 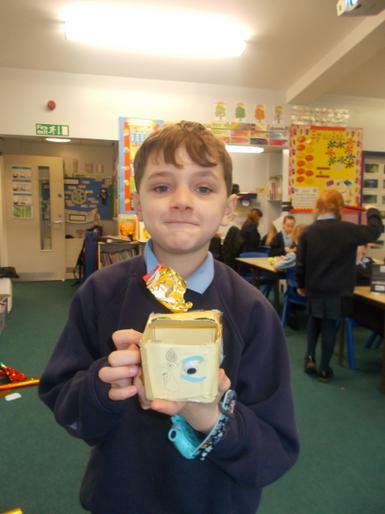 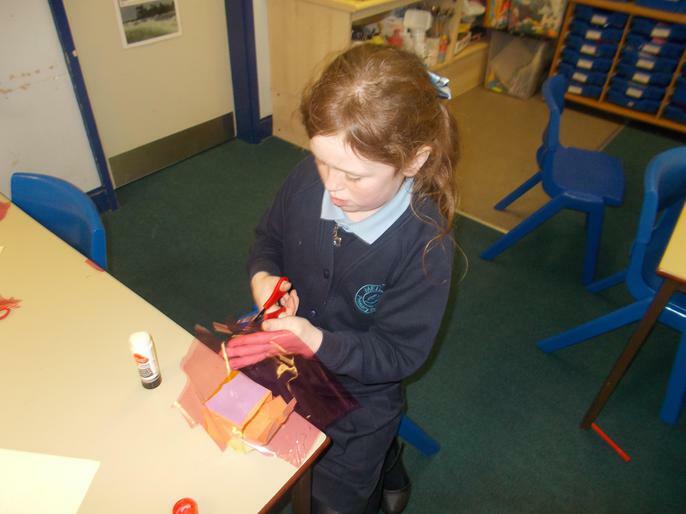 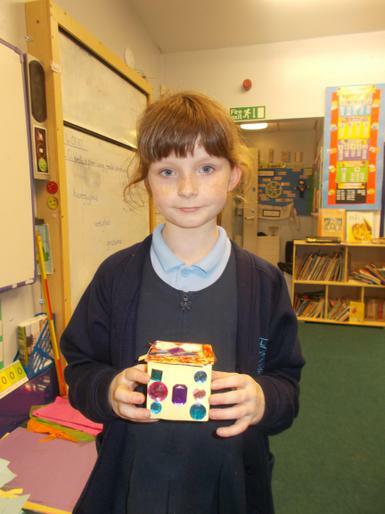 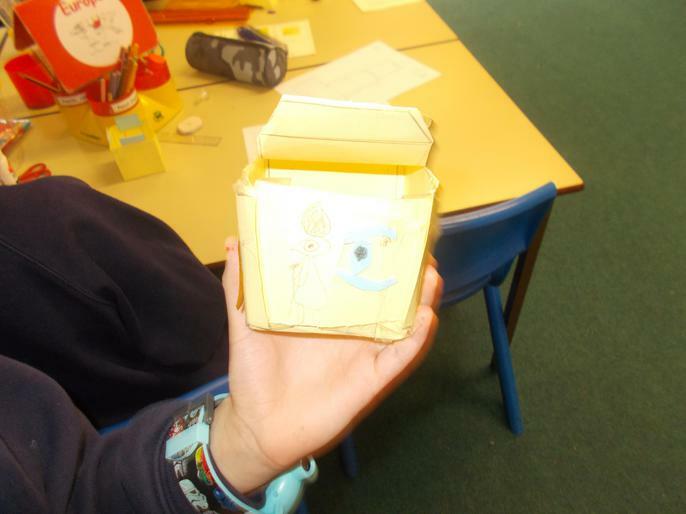 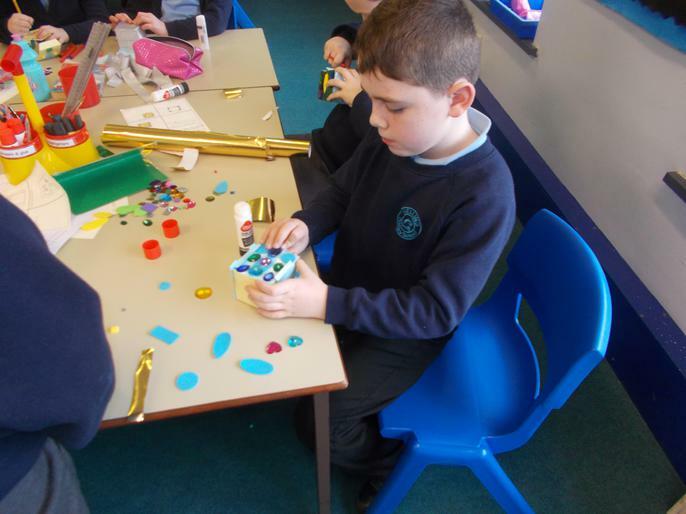 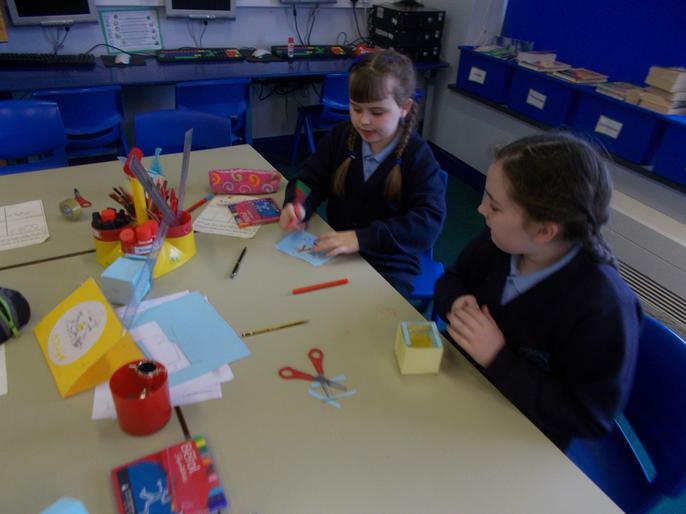 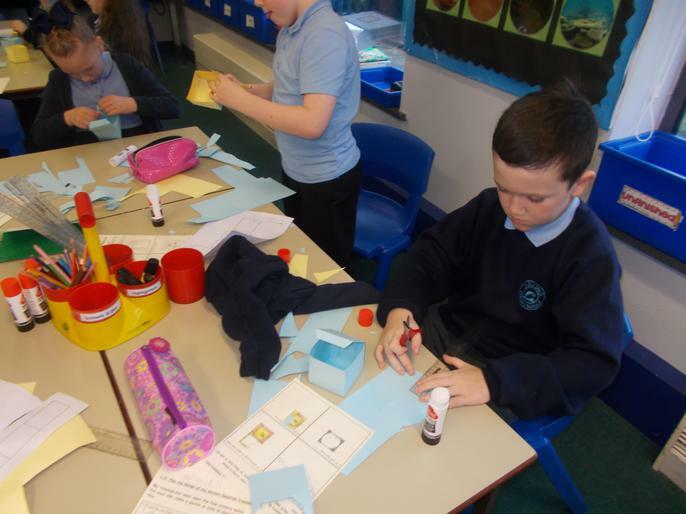 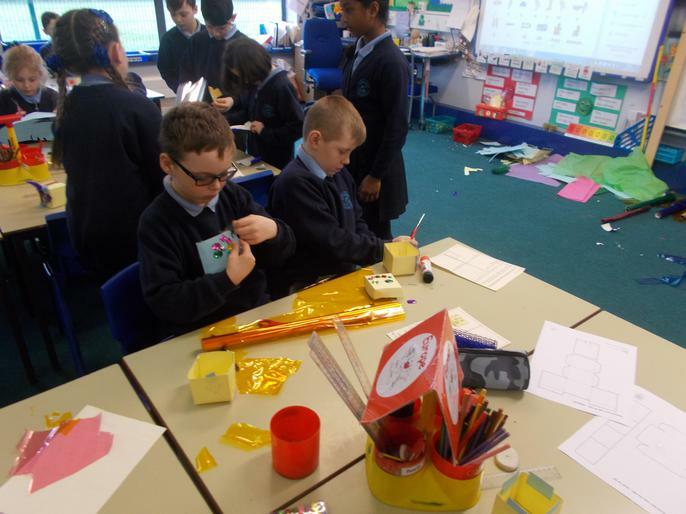 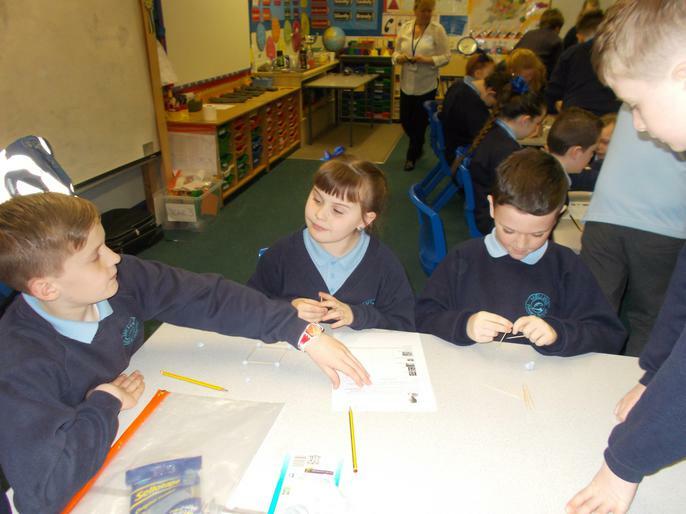 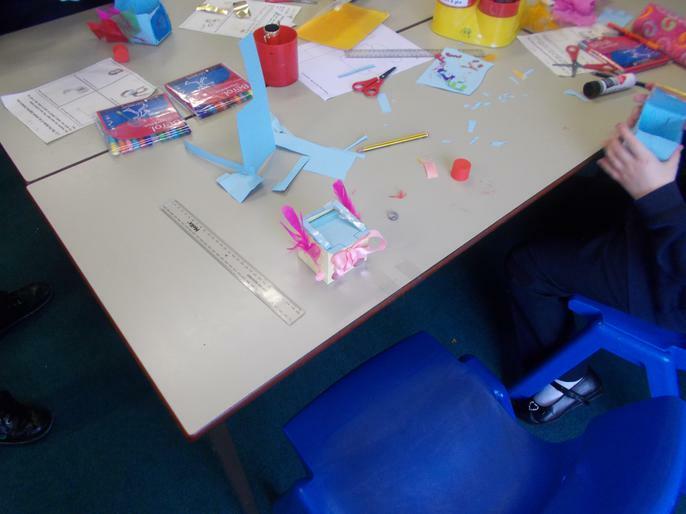 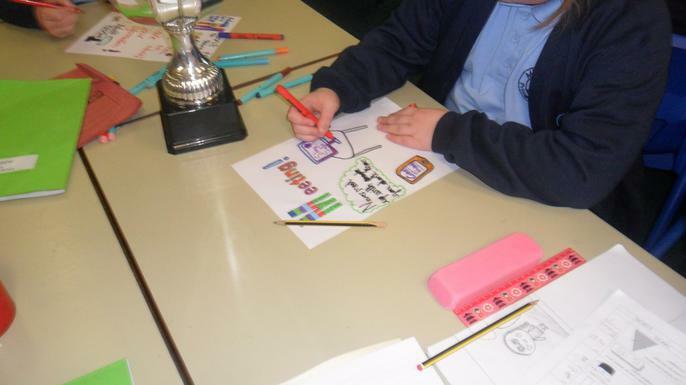 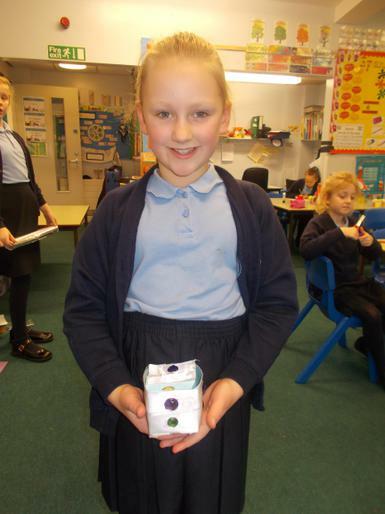 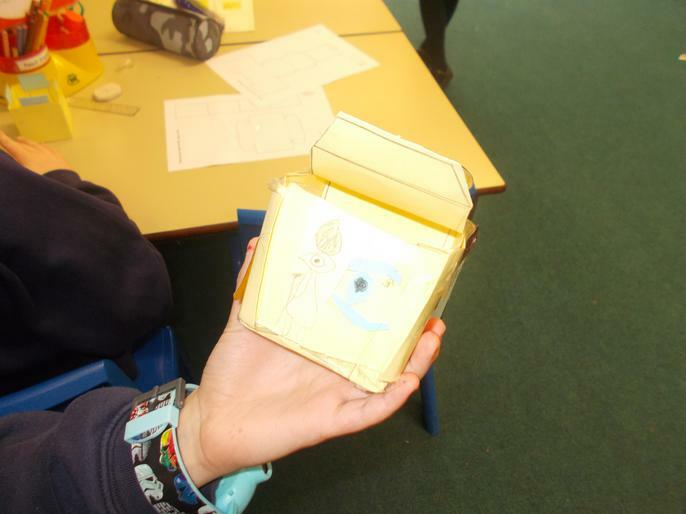 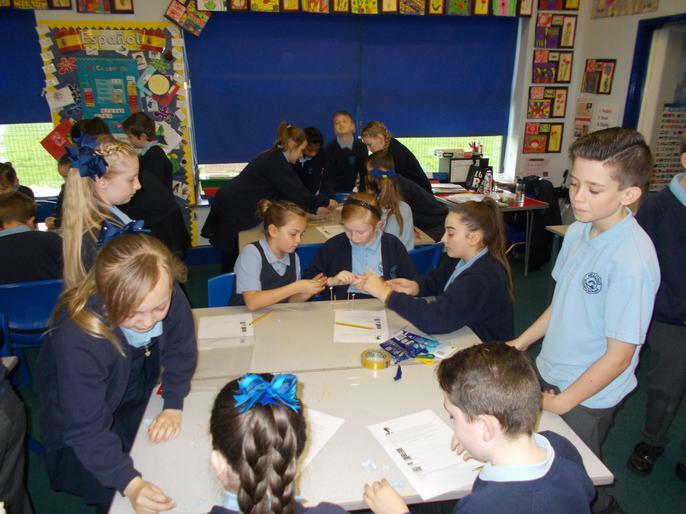 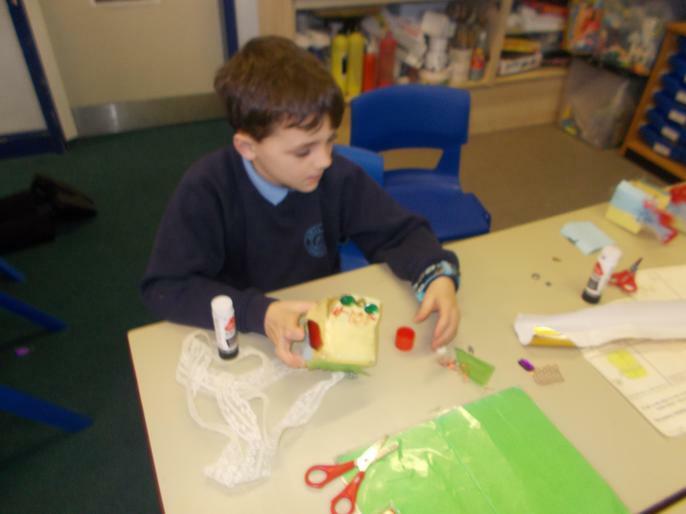 We had lots of fun designing and creating Egyptian treasure boxes! 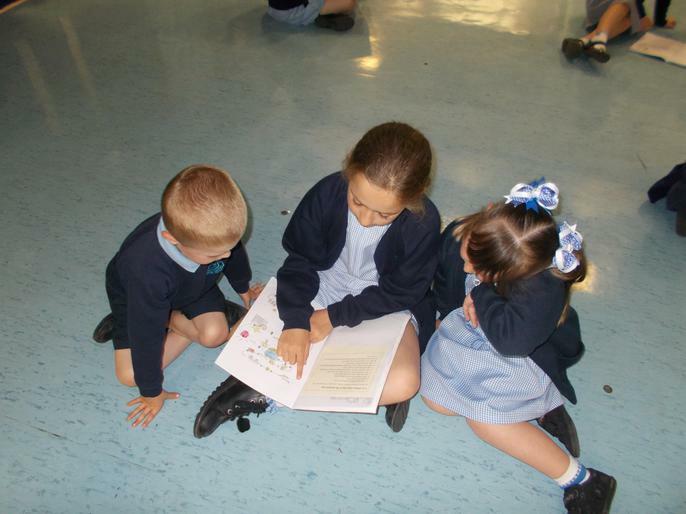 Reading Champions! 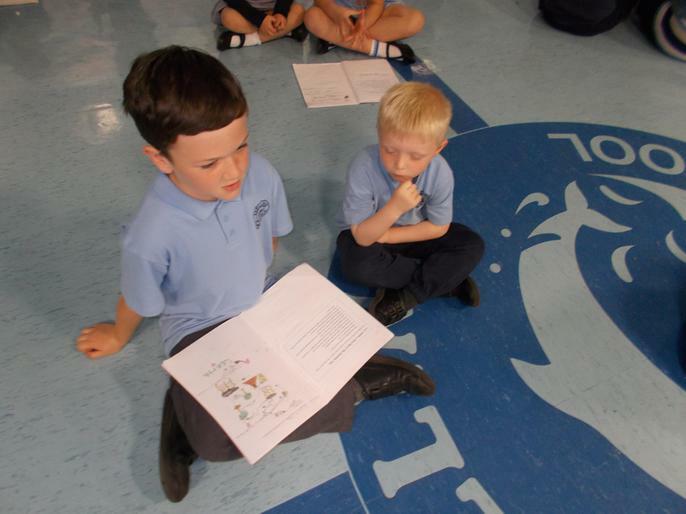 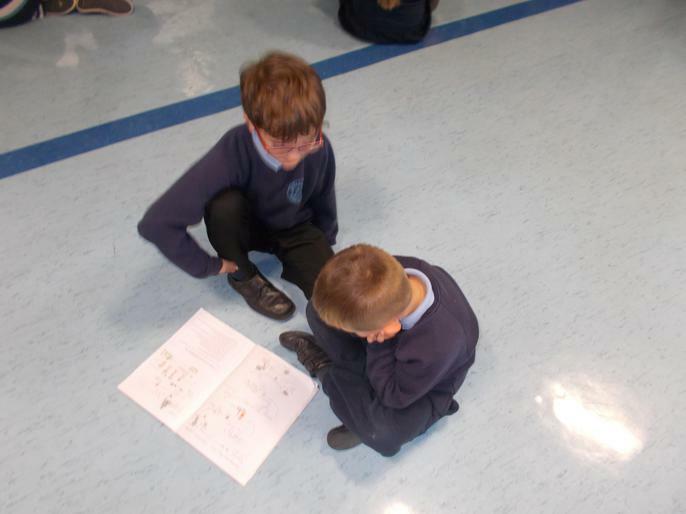 Year 4's reading champions (Josh, Jack and Taylor) have all read their first book and completed a book review to recommend the book to the rest of the class. 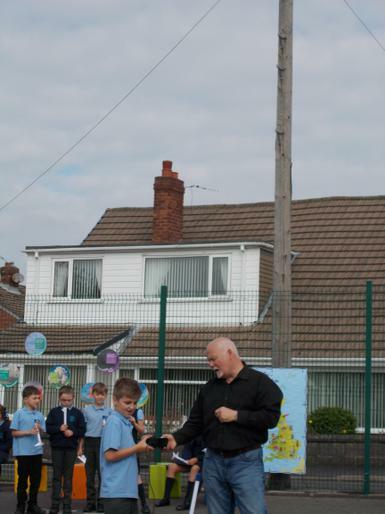 Well done boys! 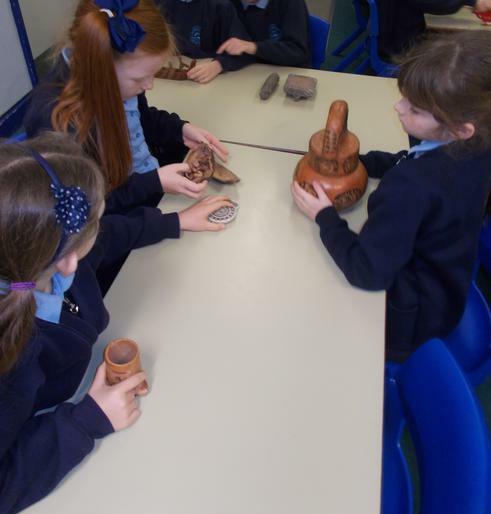 We had a fantastic day at the museum. 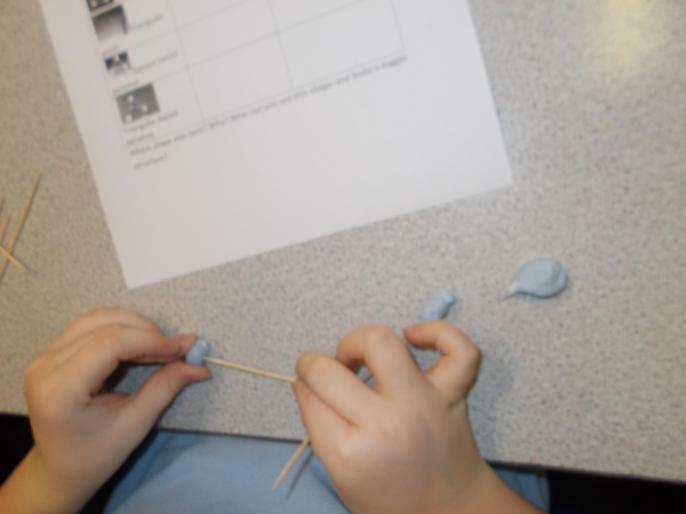 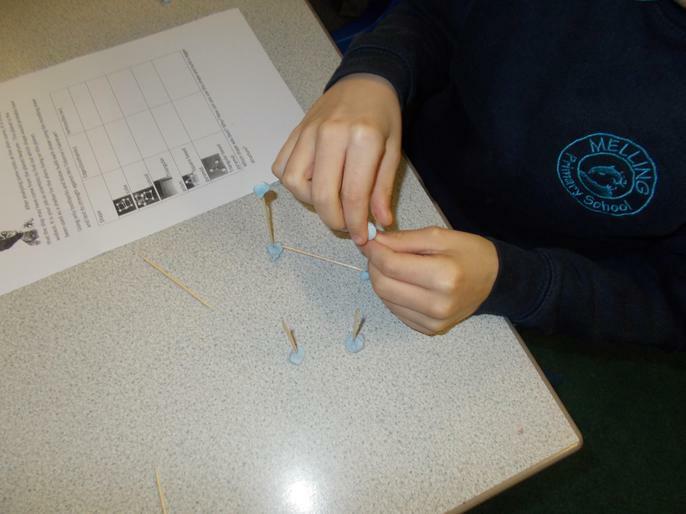 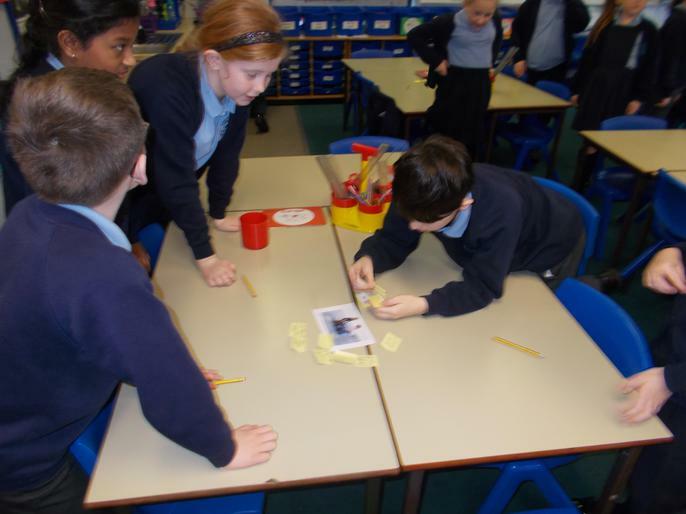 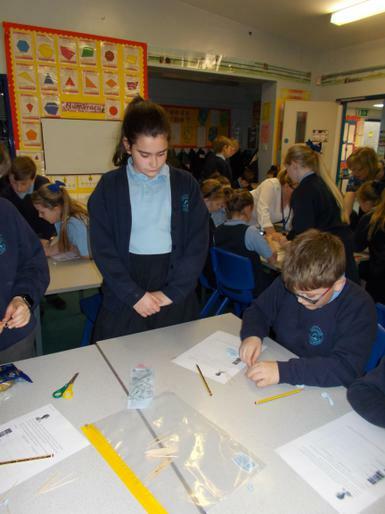 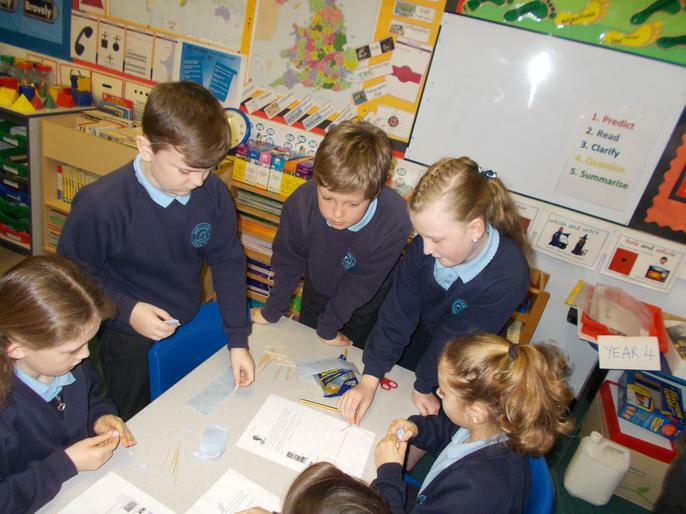 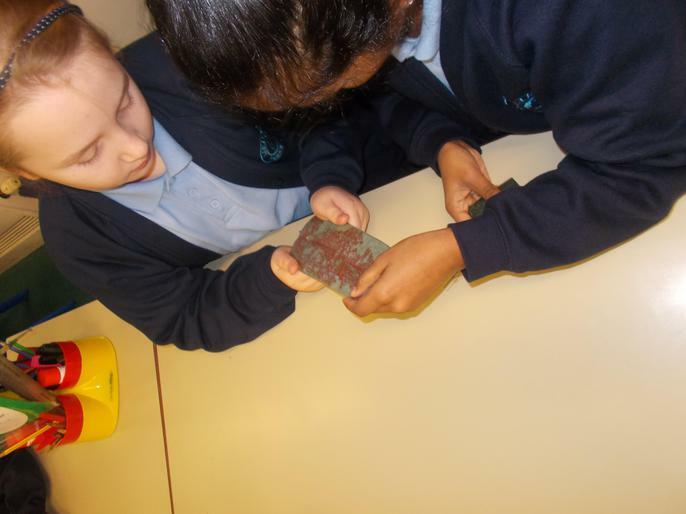 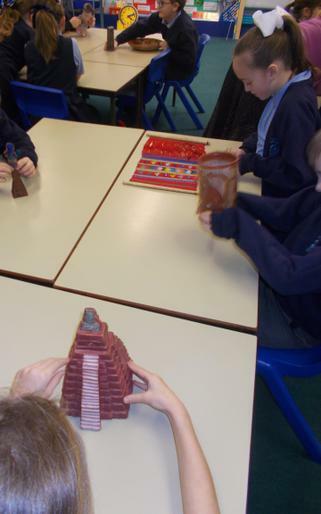 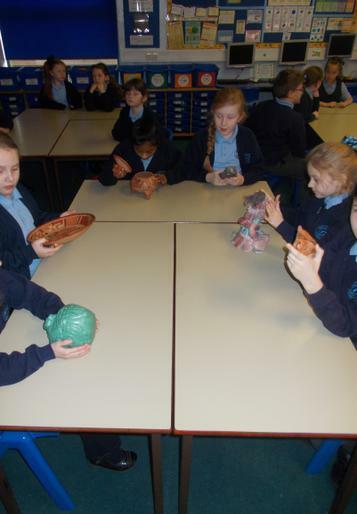 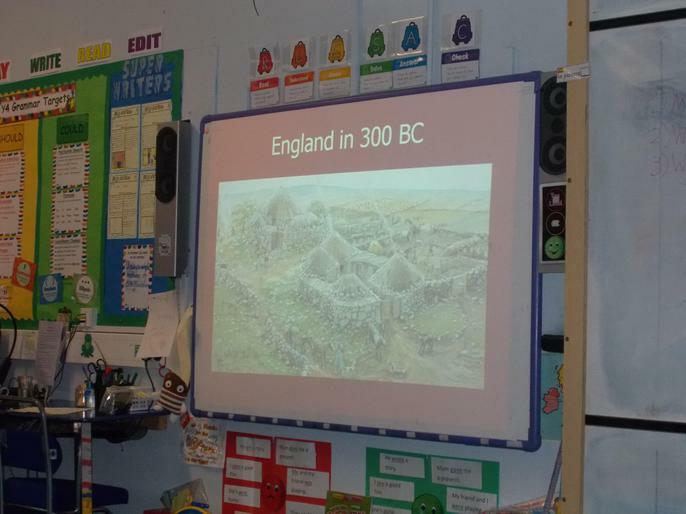 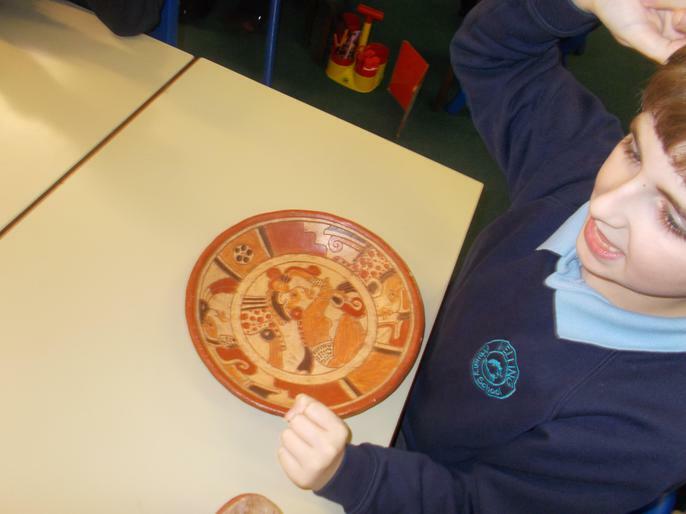 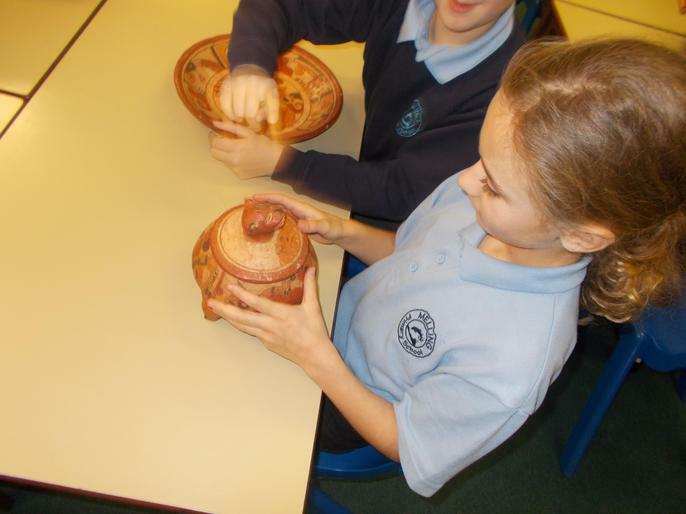 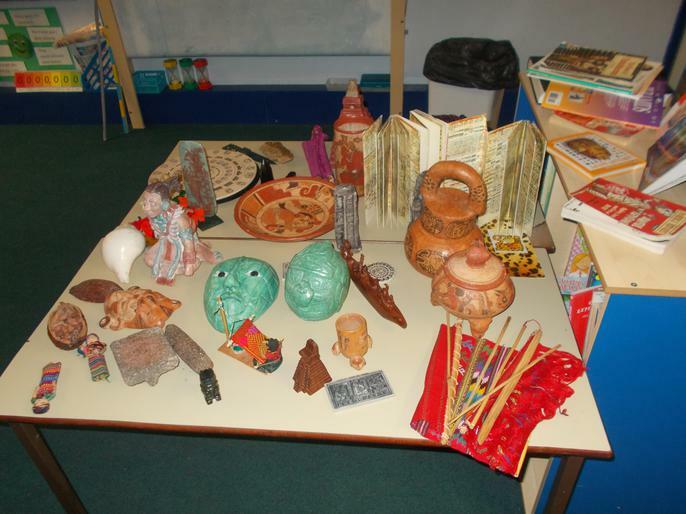 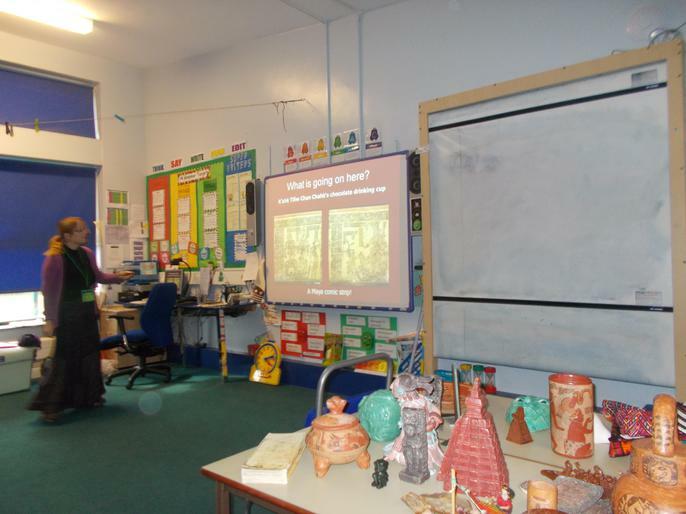 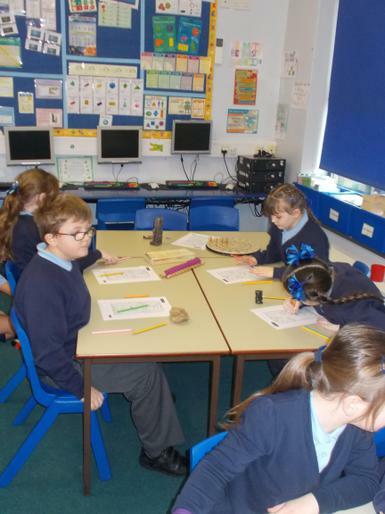 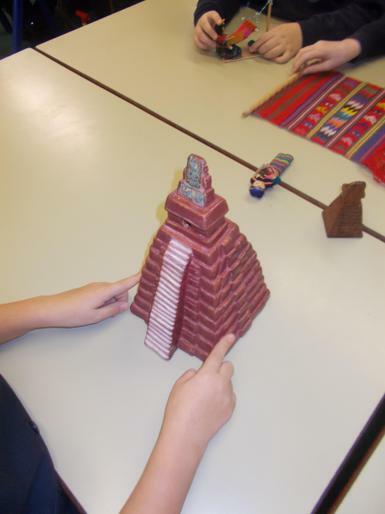 We learned more about Ancient Egypt and became junior archaeologists and looked at ancient artifacts. 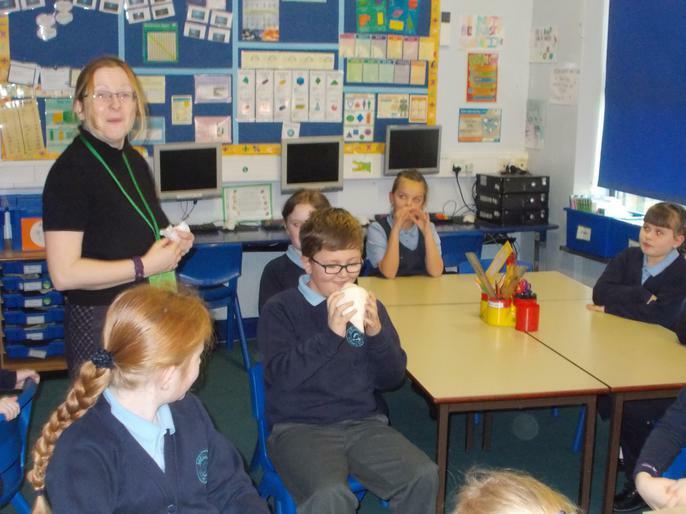 Thank you Mrs Clark. 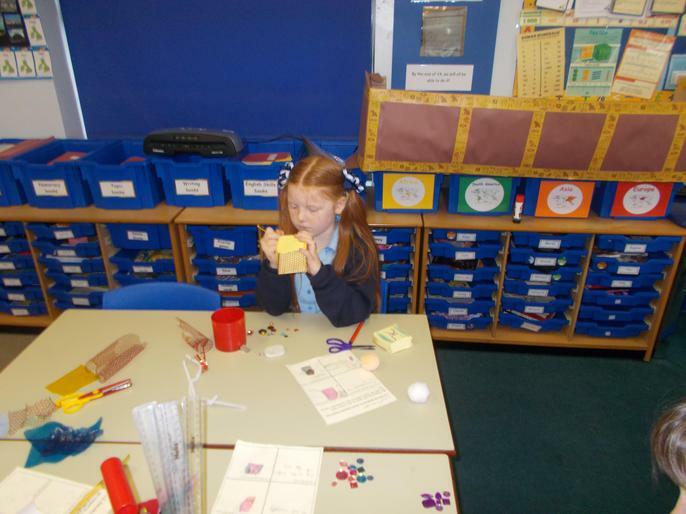 Miss Quinn and Miss Bridges for coming along to help us. 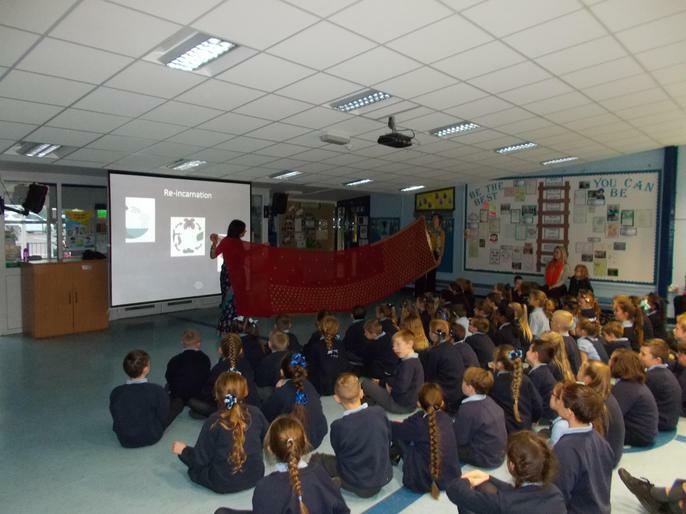 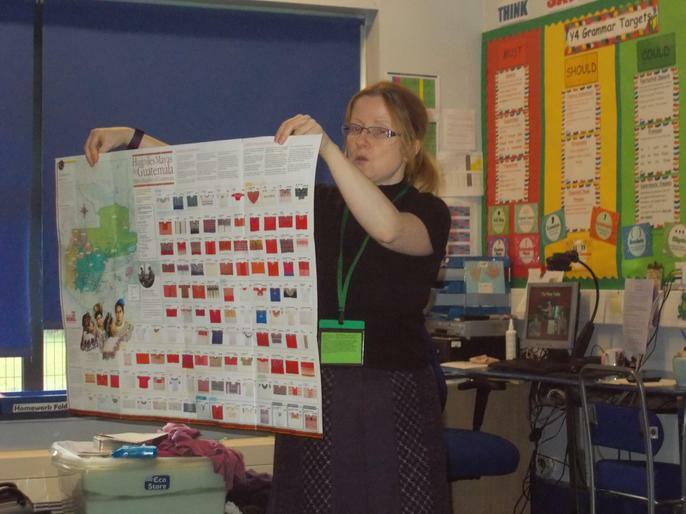 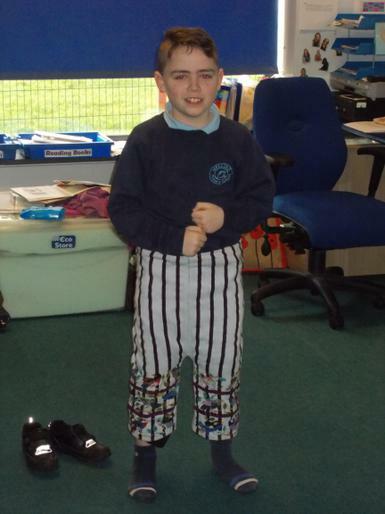 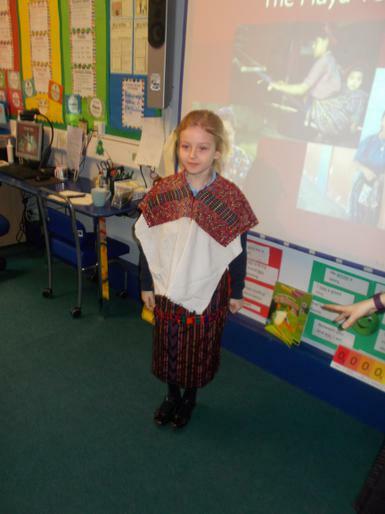 Last week in Melling Primary we celebrated Diversity Week. 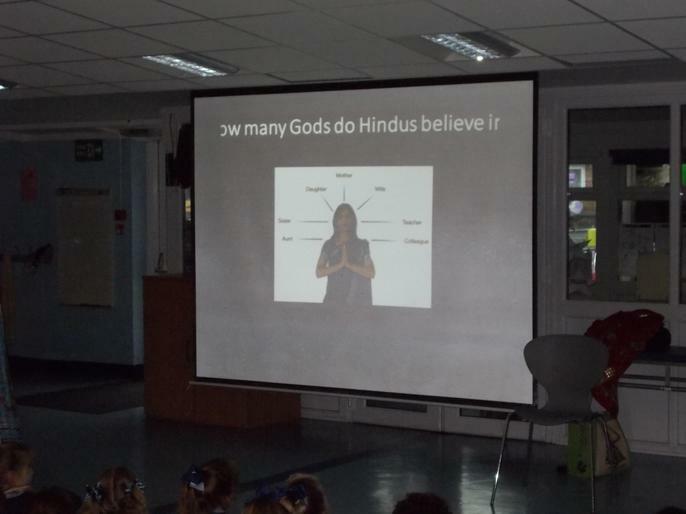 We talked about how everyone is different and have different beliefs and we had visitors from different religions throughout the week. 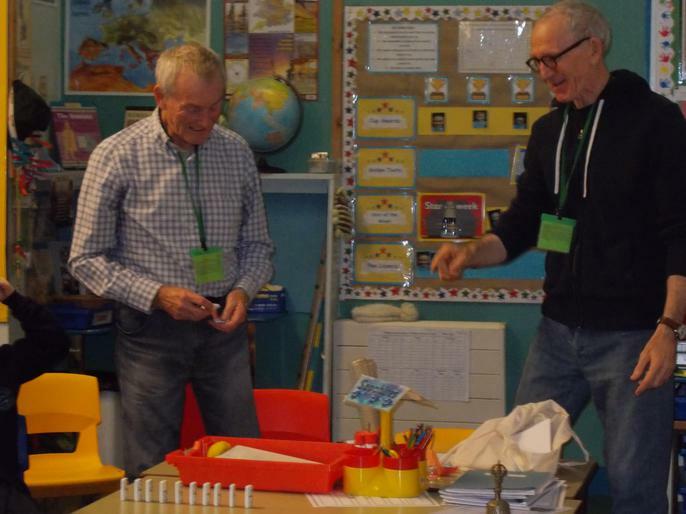 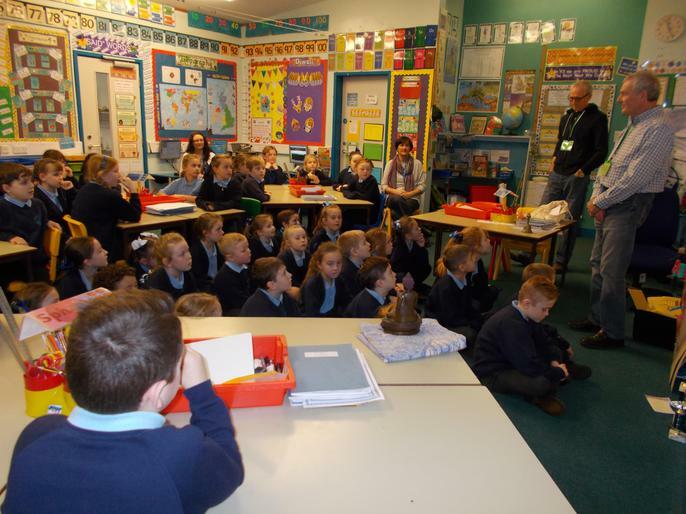 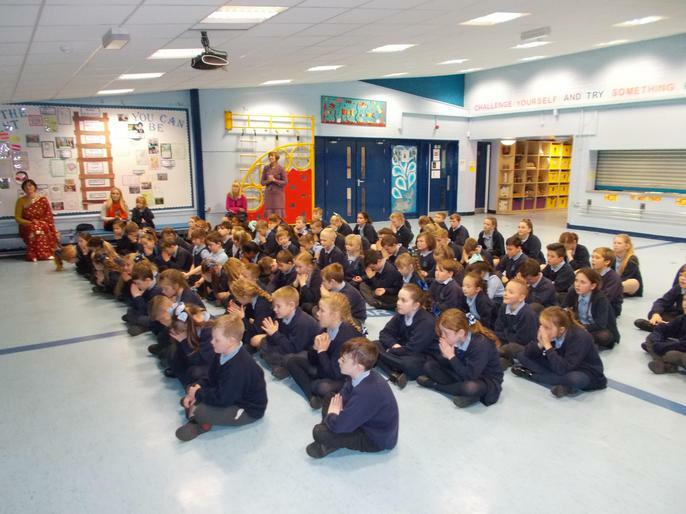 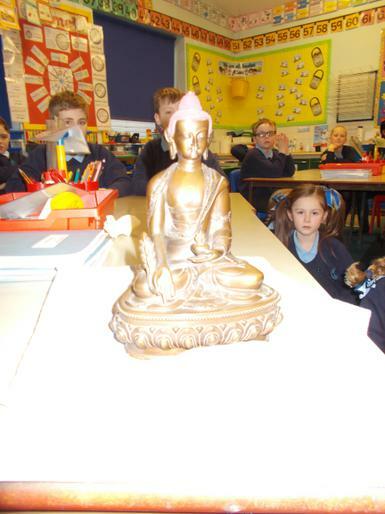 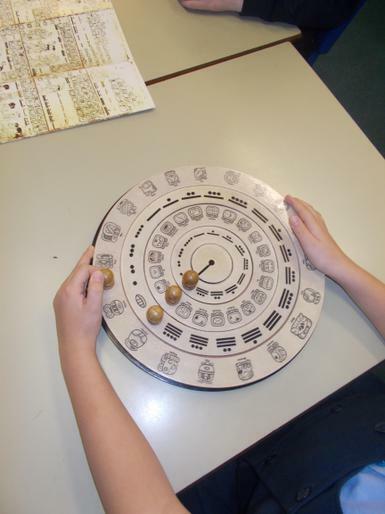 On Monday in Year 3 and 4, Steve and Dave visited us to talk about Buddhism. 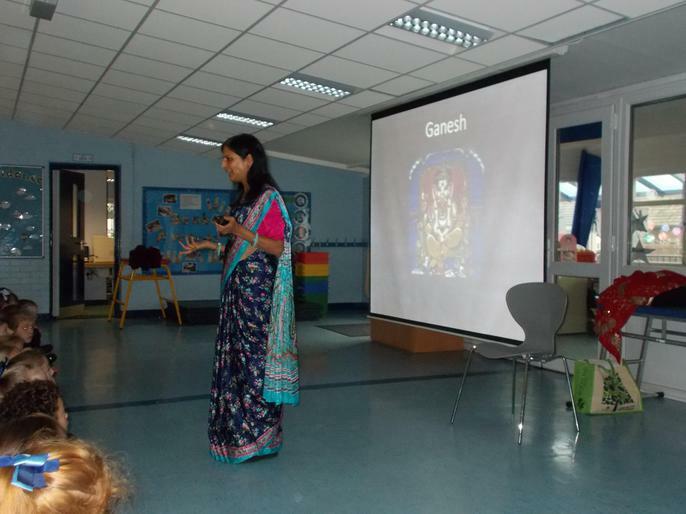 We learnt how to meditate and what Om actually means. 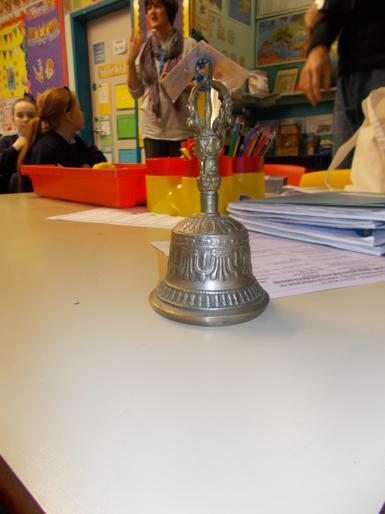 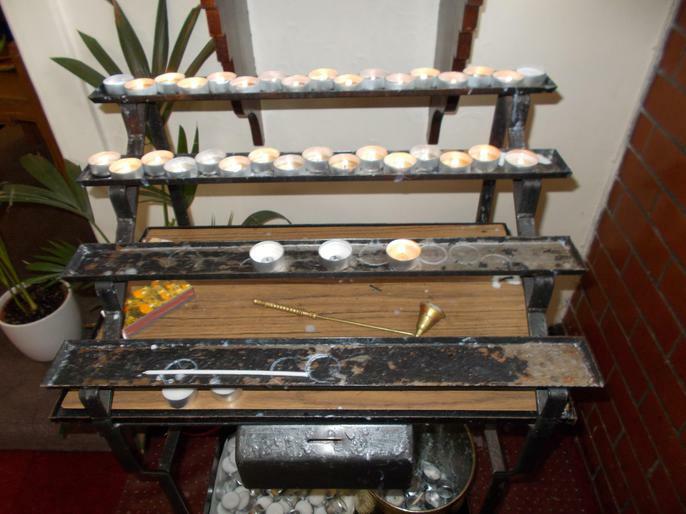 We learnt a fantastic chant which is designed to calm you when you're feeling angry or sad: 'Om mani peme hung.' 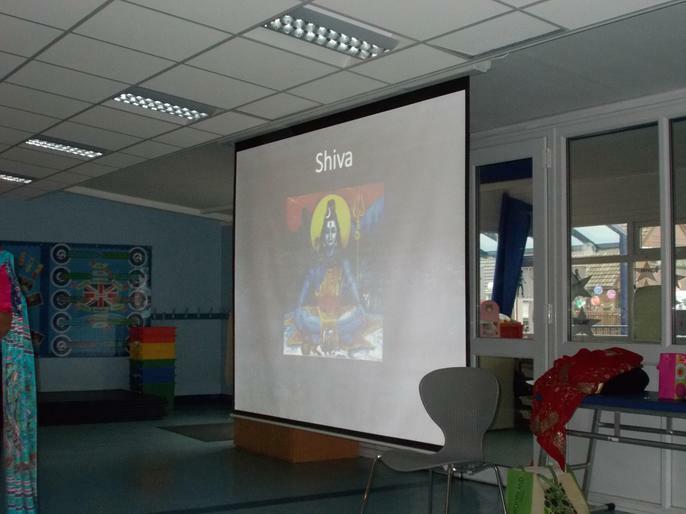 Om is the universe, mani is a jewel, peme is a lotus flower and hung is heart. 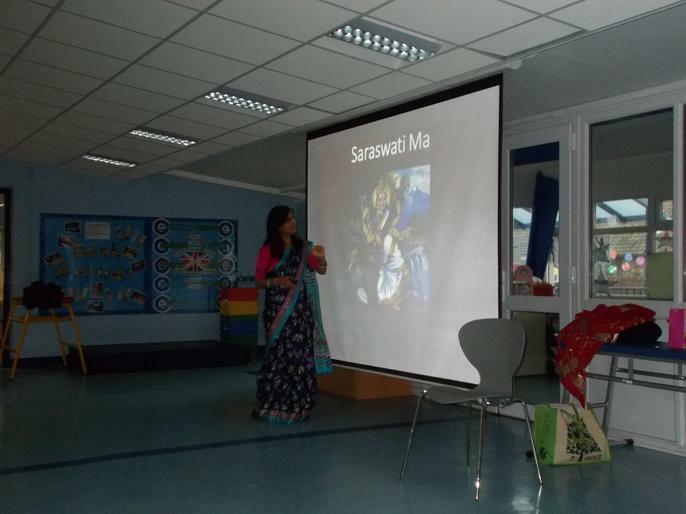 So 'Om mani peme hung' means the universe is the jewel inside the lotus flower in my heart. 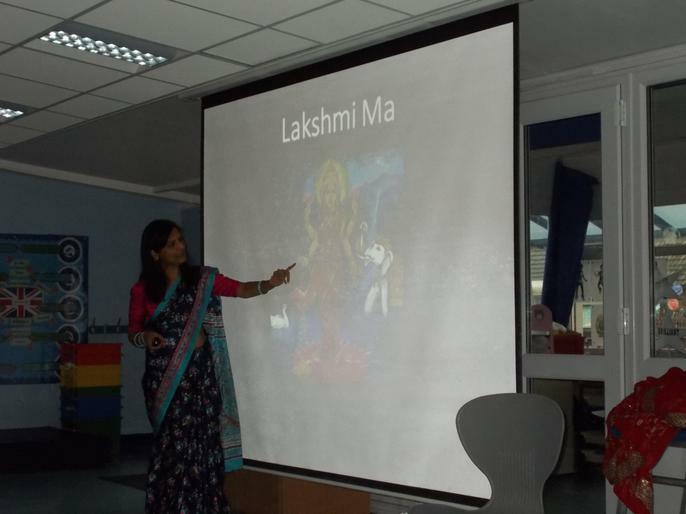 There is a wall in Kathmandu where this saying is written one million times! 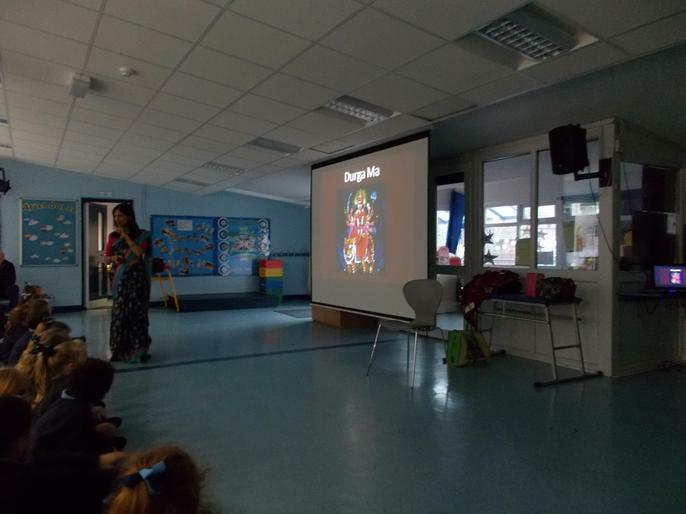 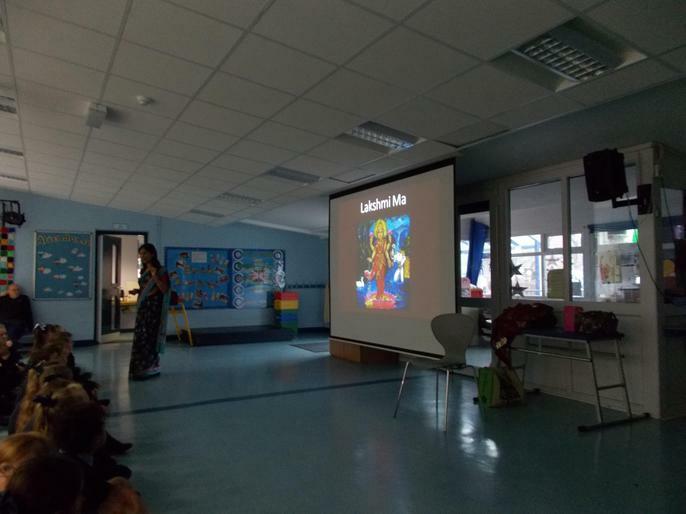 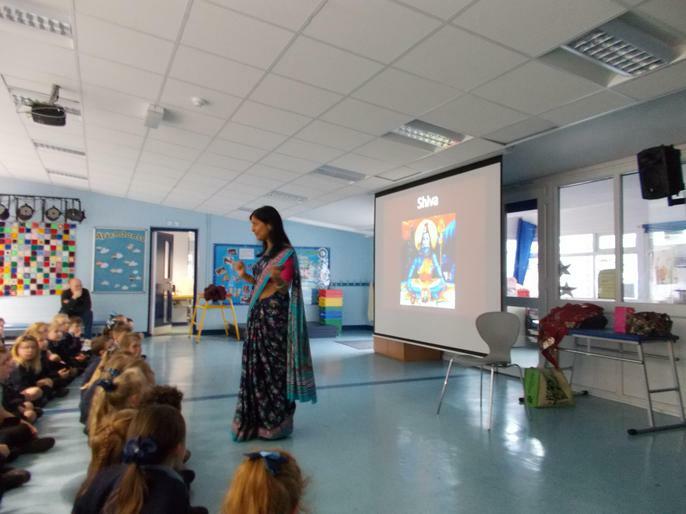 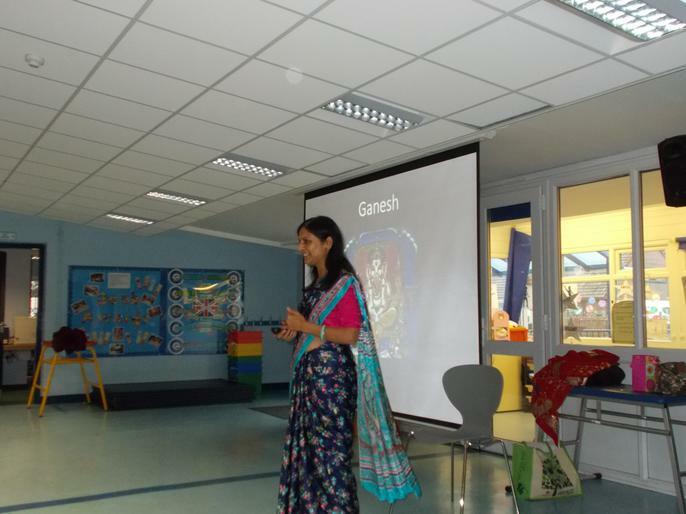 We also had a visit from Prithi who talked to us about Hinduism and some of the most important Hindu gods and what they represent. 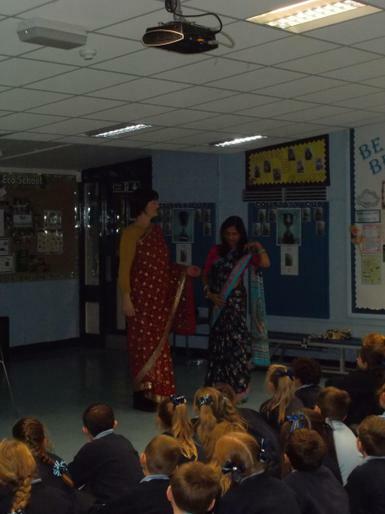 She also showed us a sari and got Mrs Summers to model it! 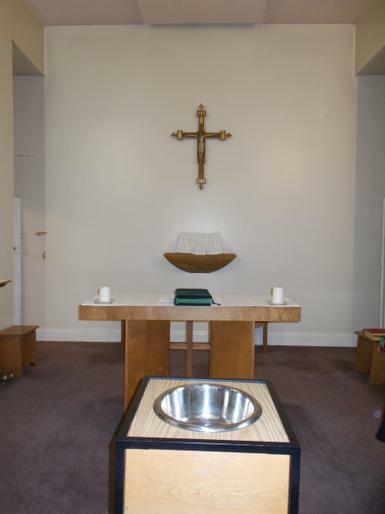 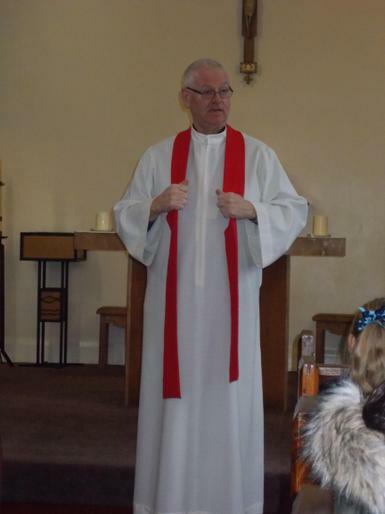 Super Pop talked to us about the baptism ceremony in the Baptist religion, Reverend Jane talked about the Church of England and Ivor came in to talk about Judaism. 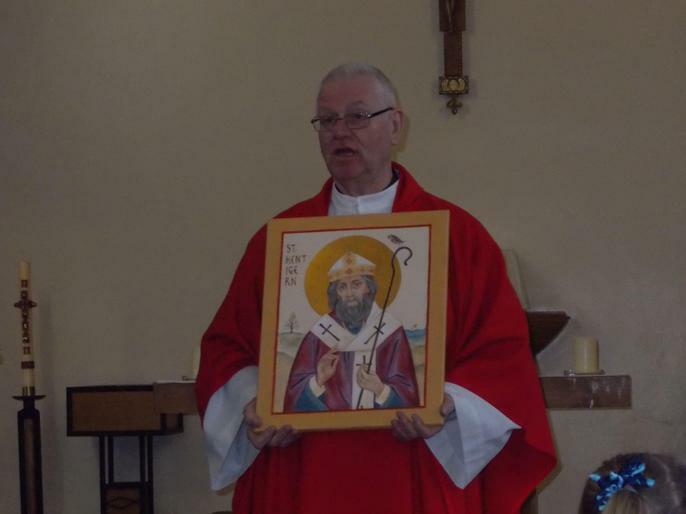 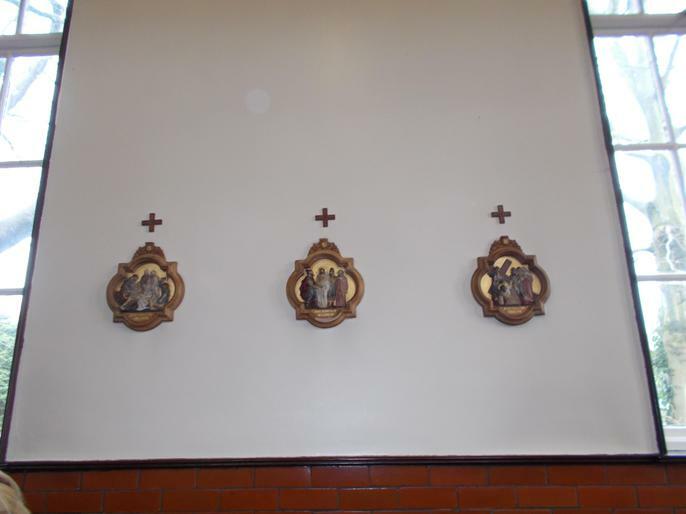 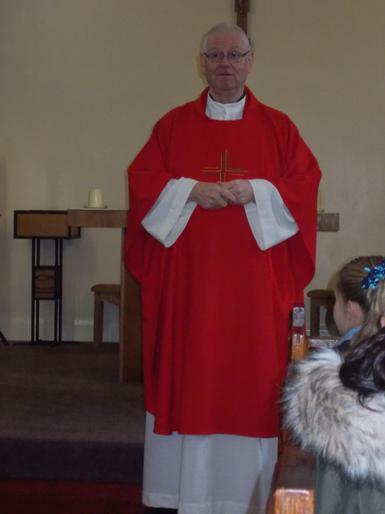 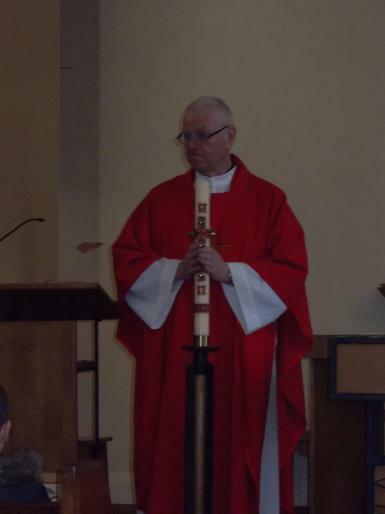 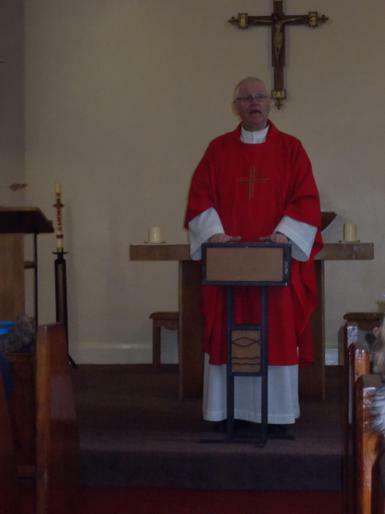 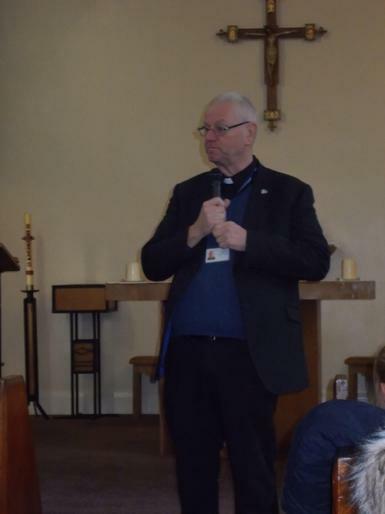 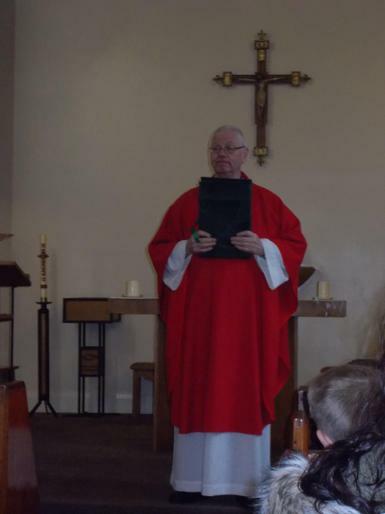 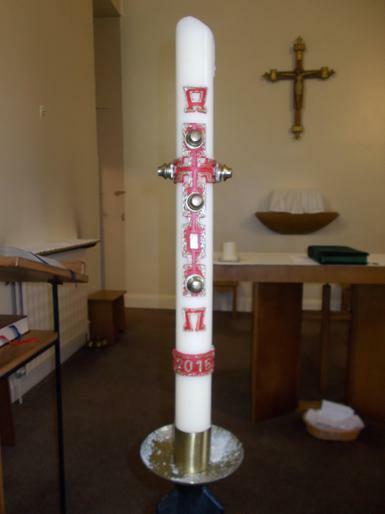 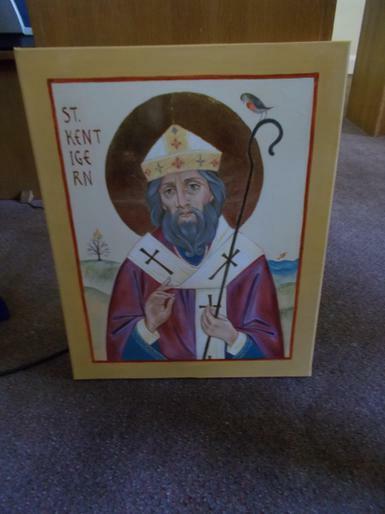 As part of Diversity Week we also visited St. Kentigern's Church and had a talk from Father Des who talked to us about some of the aspects of the Catholic religion. 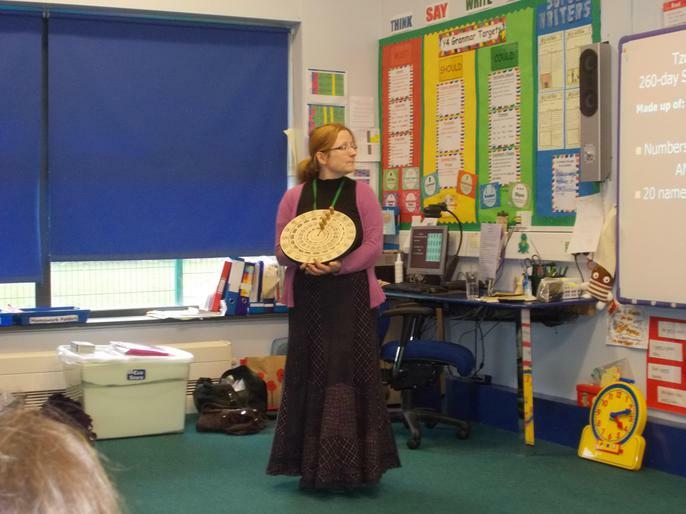 It was a fascinating week! 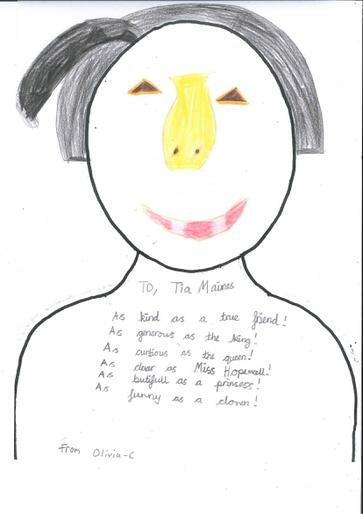 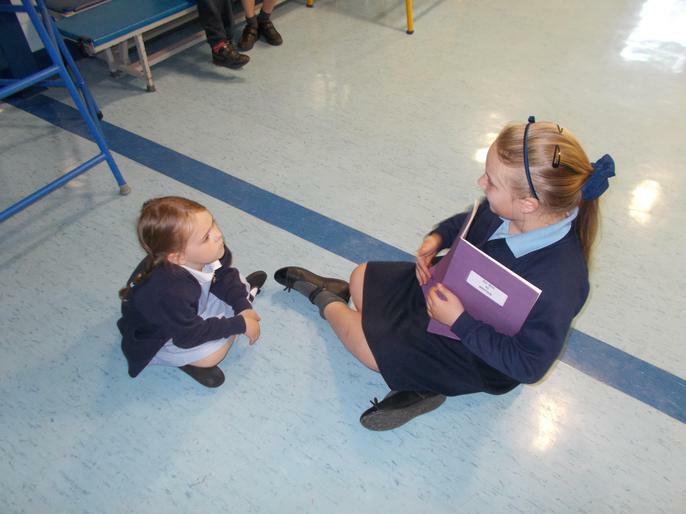 This week in Melling Primary it has been Friendship Week. 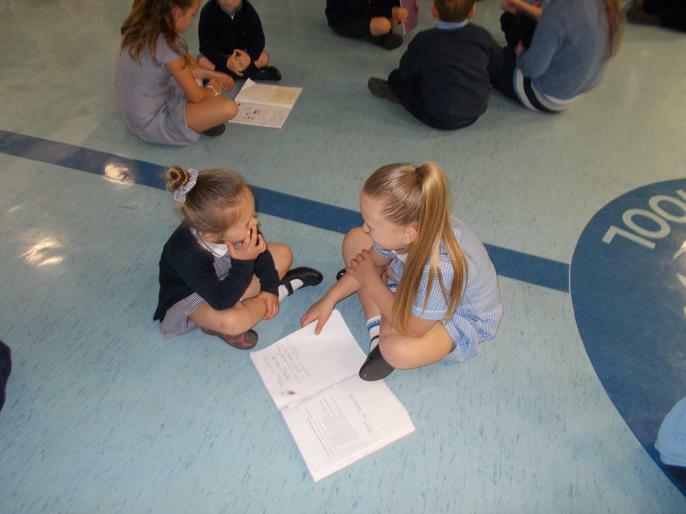 In Year 4 our focus has been to celebrate each others' achievements and focus on the positive things everyone is doing, rather than the negative. 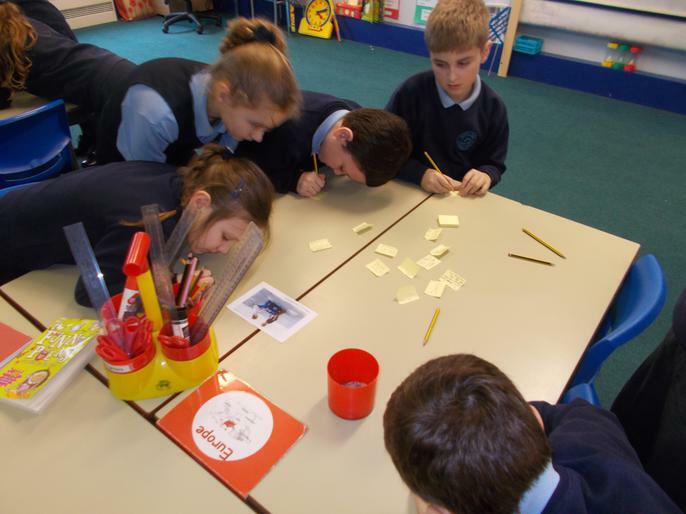 We played games where we had to say something positive about someone in our class. 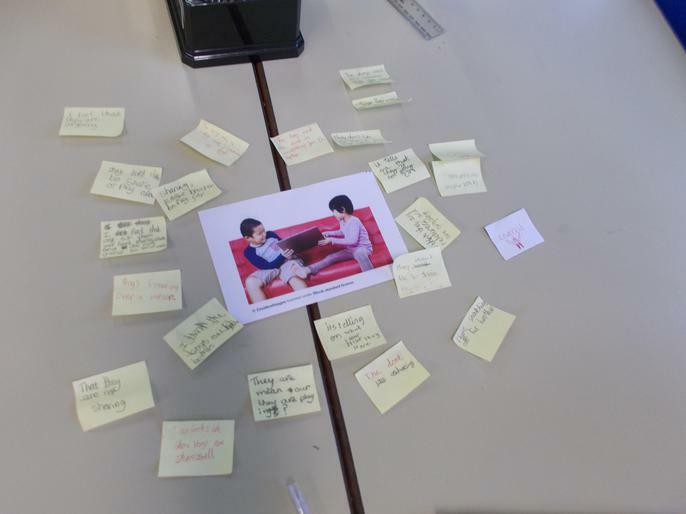 We also read a story about a girl who's cat had gone missing and her friends, although trying to be helpful, were making her feel worse. 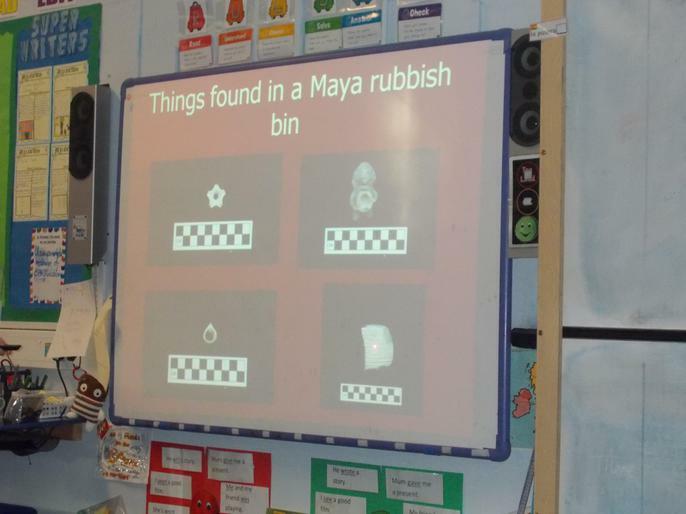 We did lots of discussion around this story. 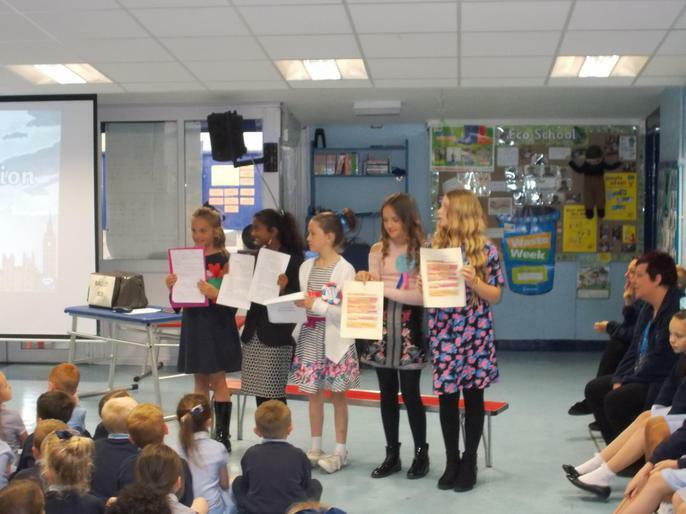 We nominated children in our class to receive certificates for being a good friend, working well with others and showing they were pleased for someone. 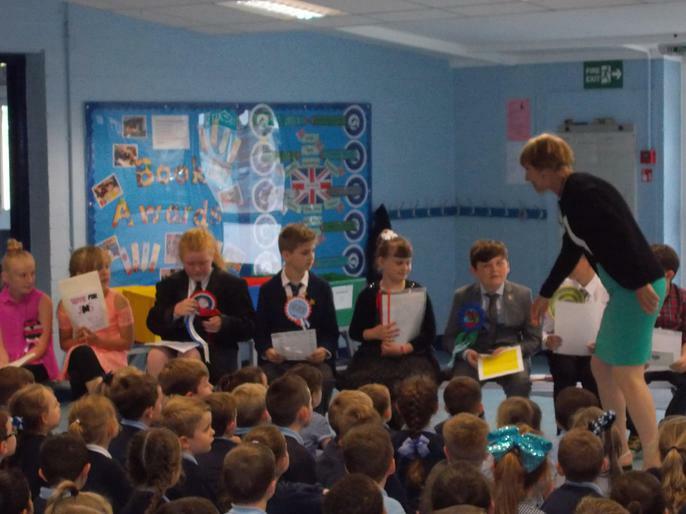 Miss Hopewell only gave the certificate though if we had given a really good reason for the nomination! 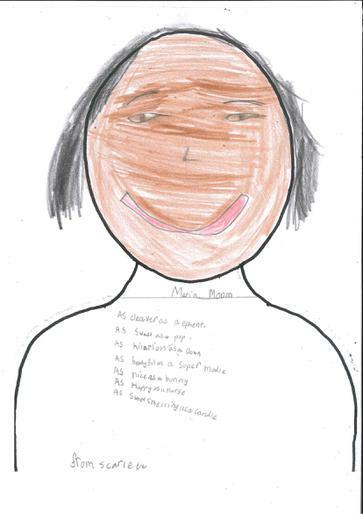 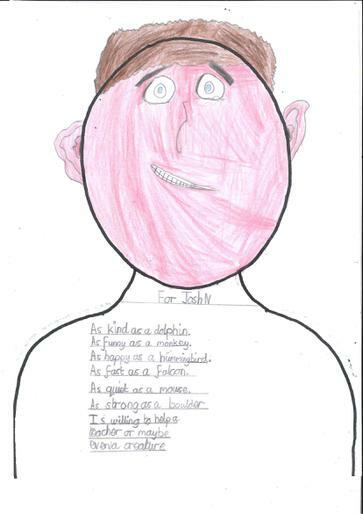 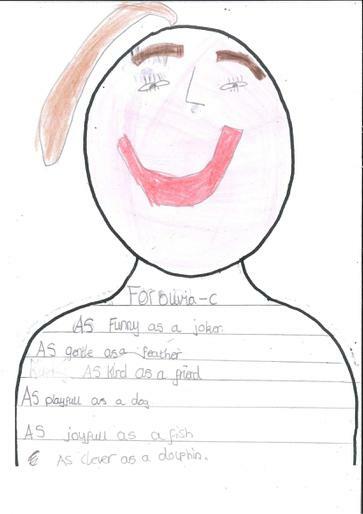 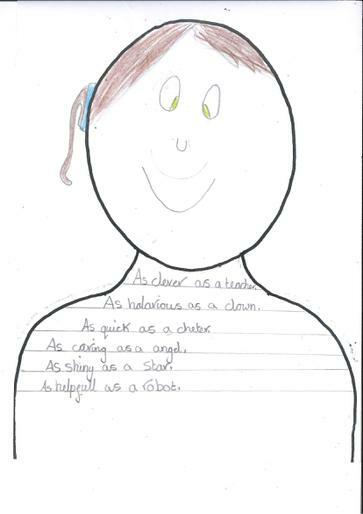 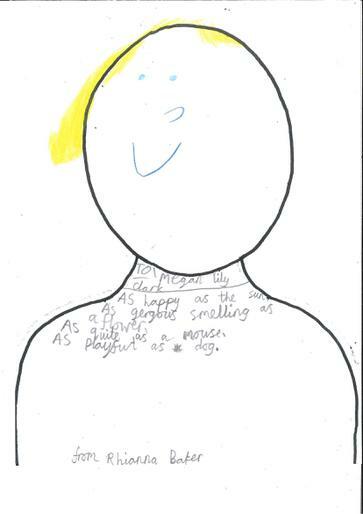 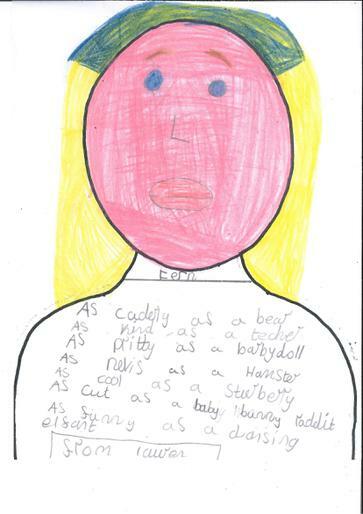 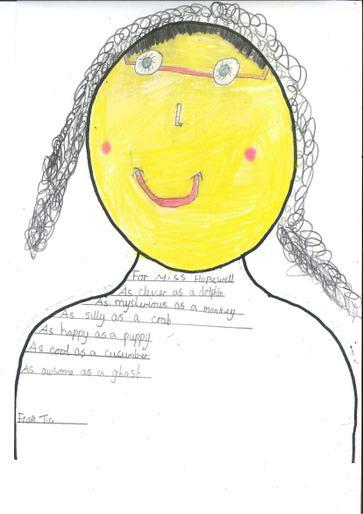 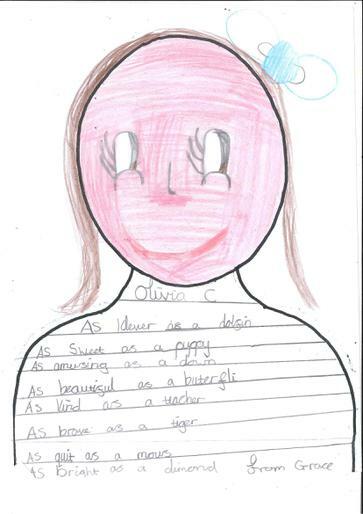 Finally, we wrote a poem about someone in our class using similes. 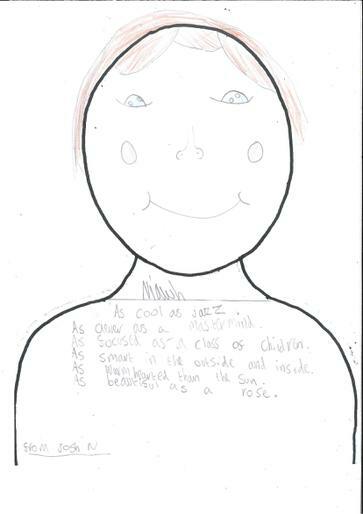 We were not allowed to pick our best friend and were only allowed to write positive things about the person we chose. 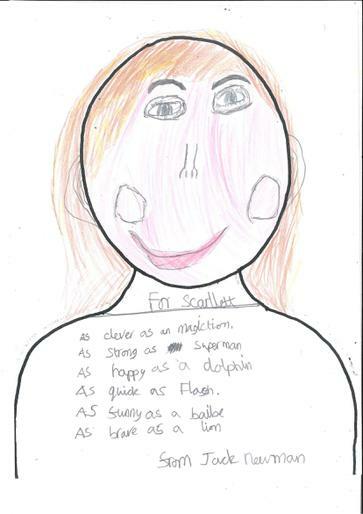 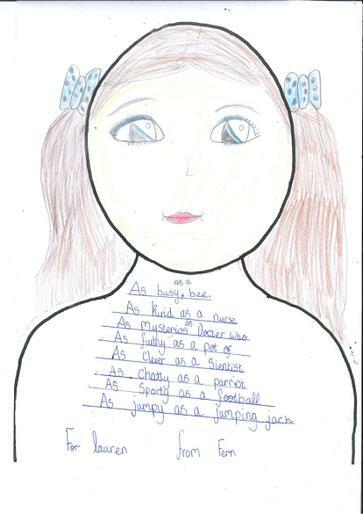 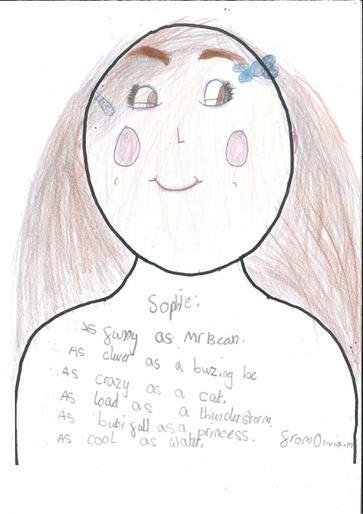 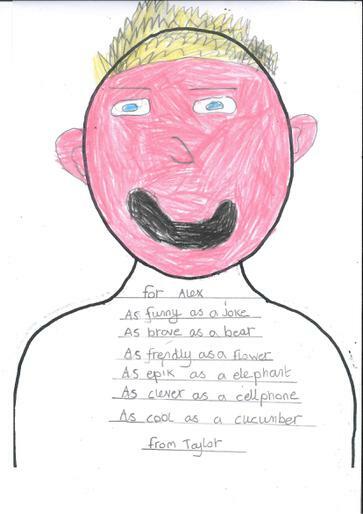 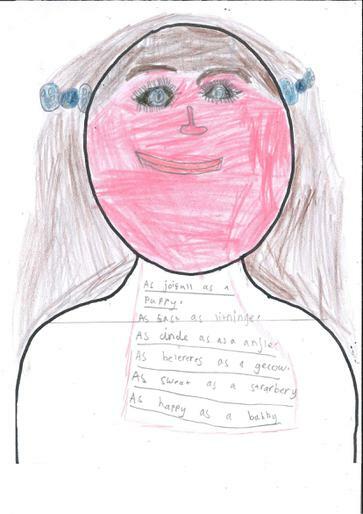 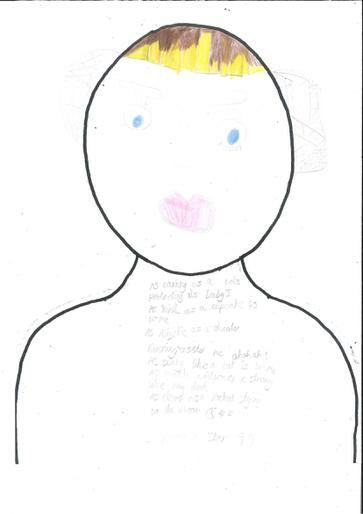 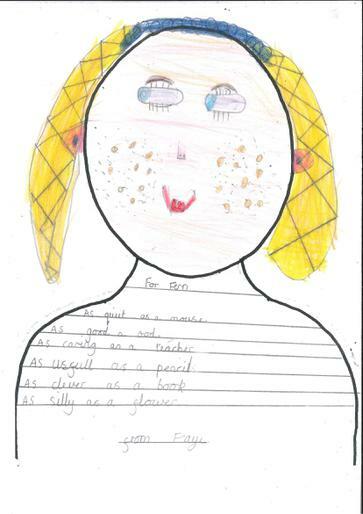 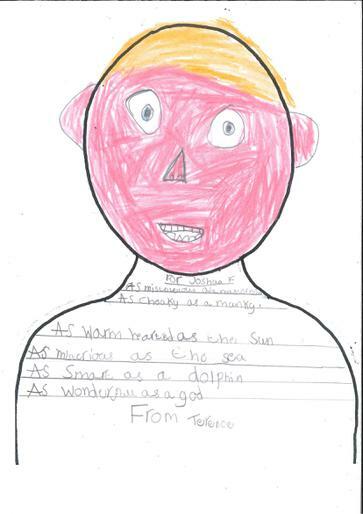 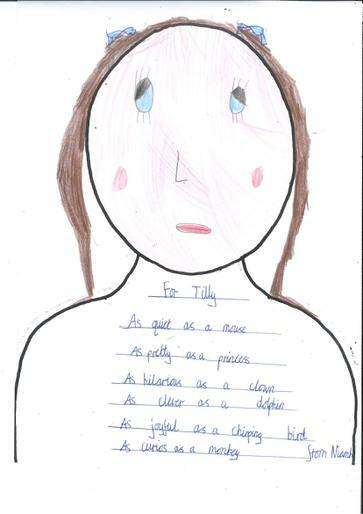 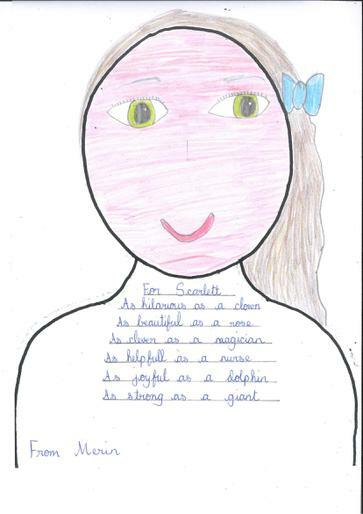 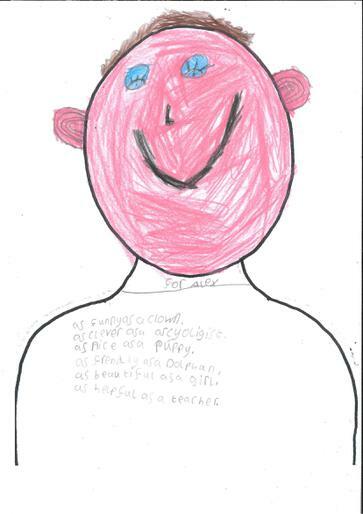 Look at the pictures below to see our wonderful poems! 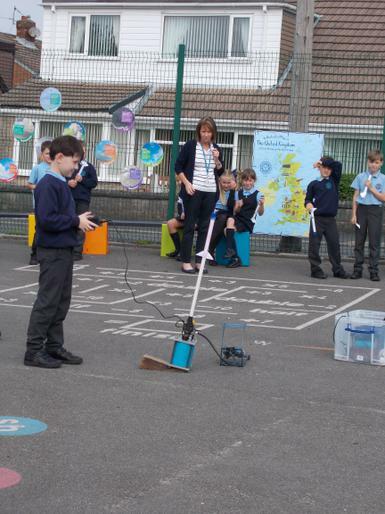 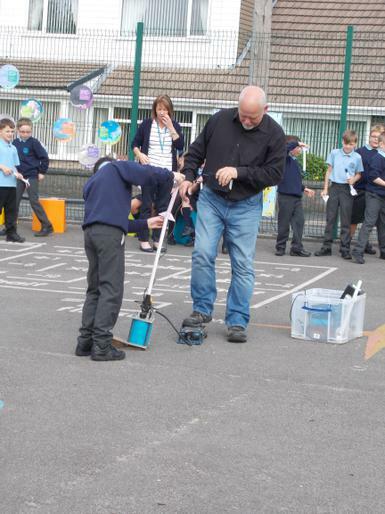 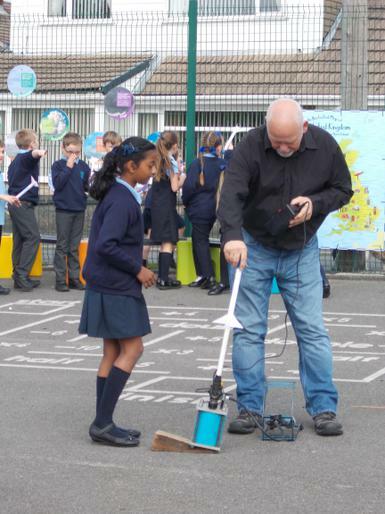 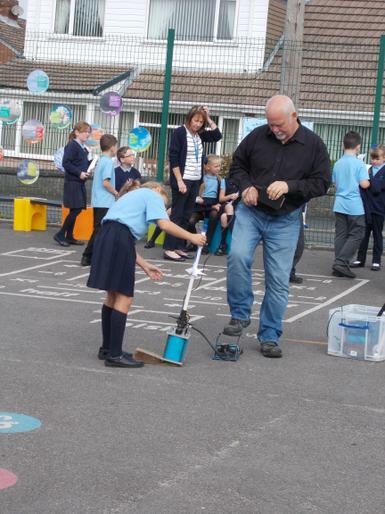 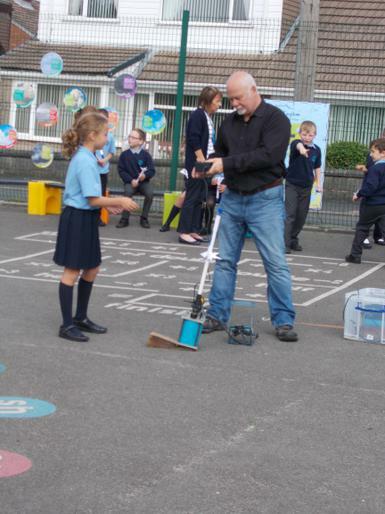 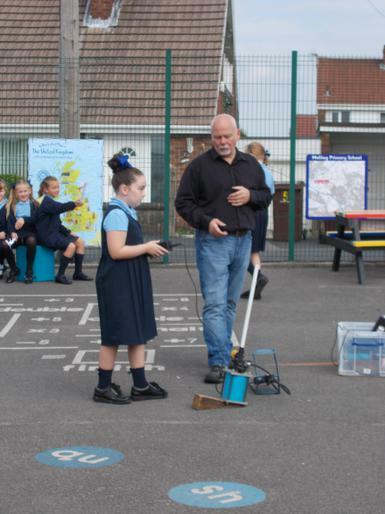 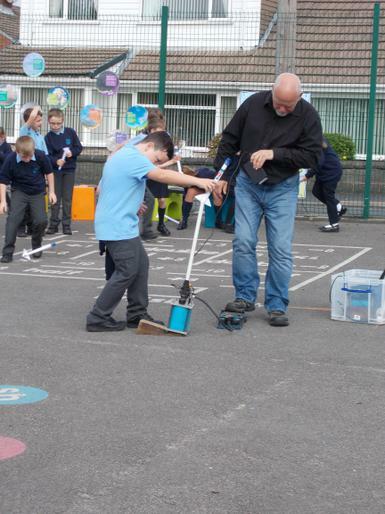 Year 4 were chosen to take part in a "Canal Clean-Up" with children from others schools in the area. 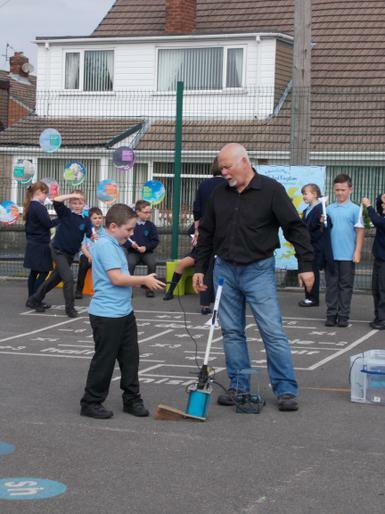 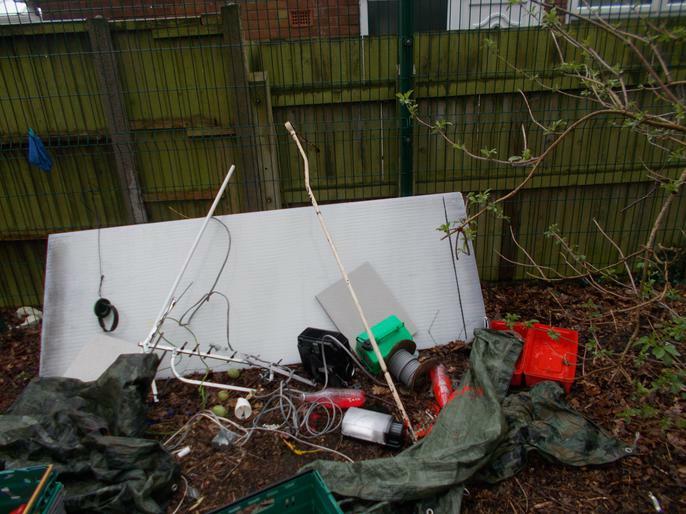 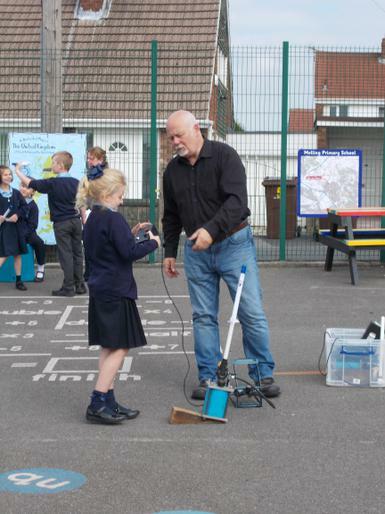 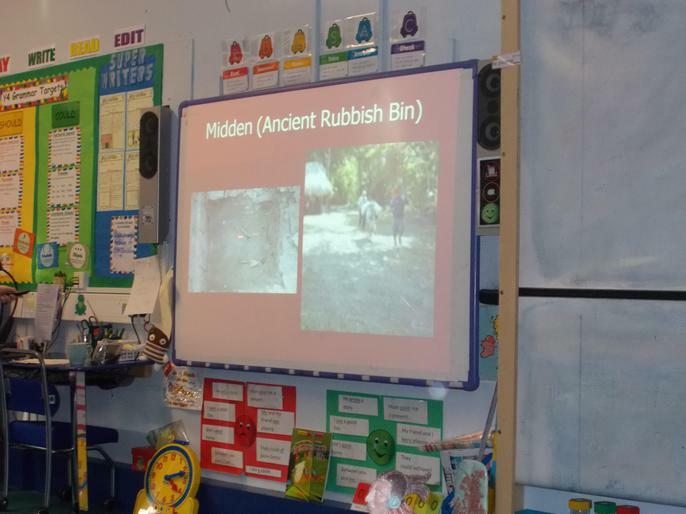 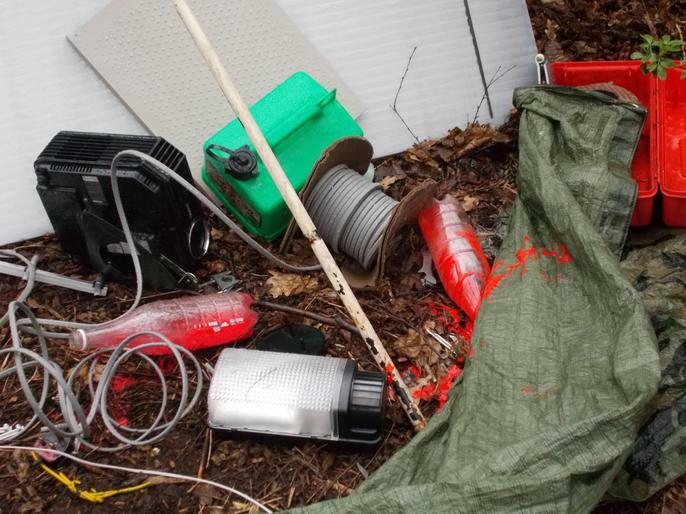 The aim was to teach children about canal safety and responsibility to the environment as well as clearing litter from the canal pathway. 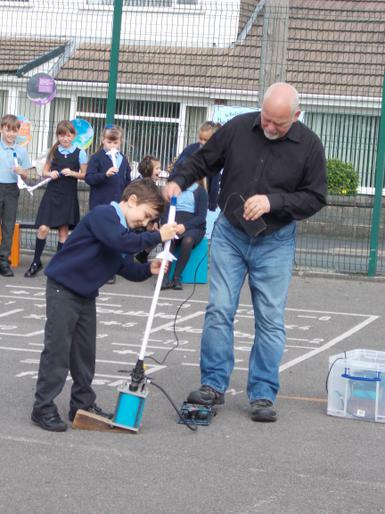 The children worked with volunteers from the Canal and River Trust and were treated to a ride along the canal on the Pride of Sefton. 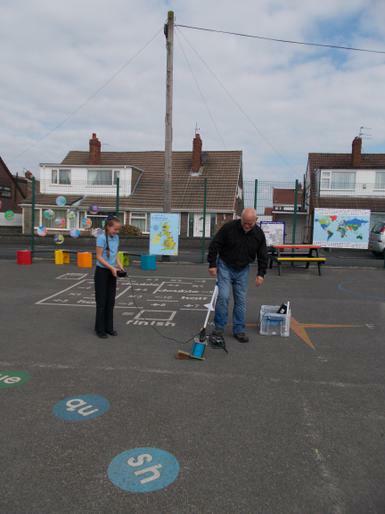 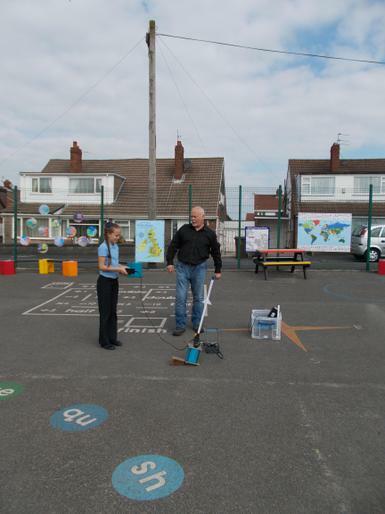 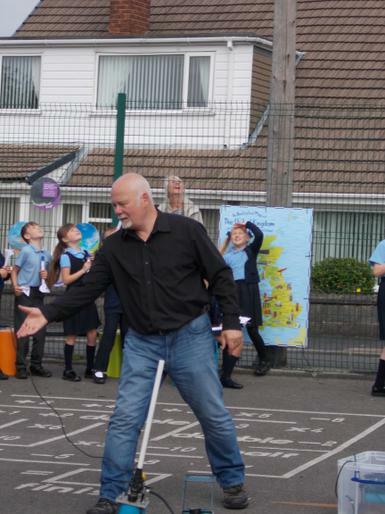 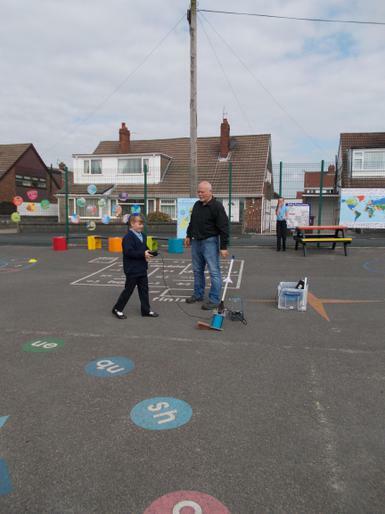 A big thank you to everyone involved and to Mrs Fisher and Mr Maloney for your help. 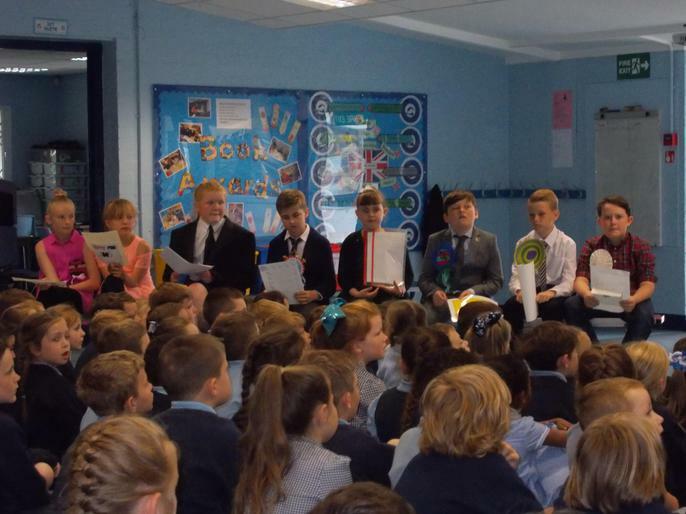 Well done children, you were fantastic! 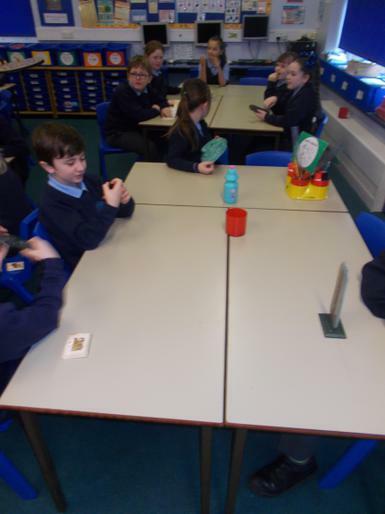 We have started our lessons with Mr Taylor. 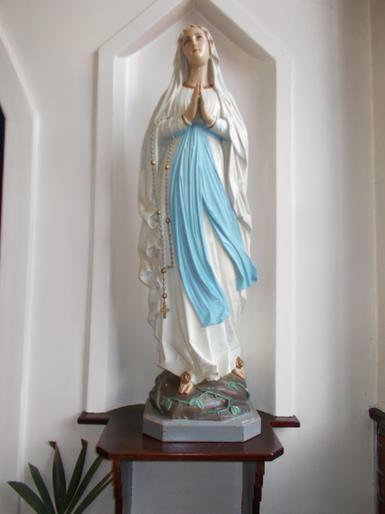 At the end of the day. 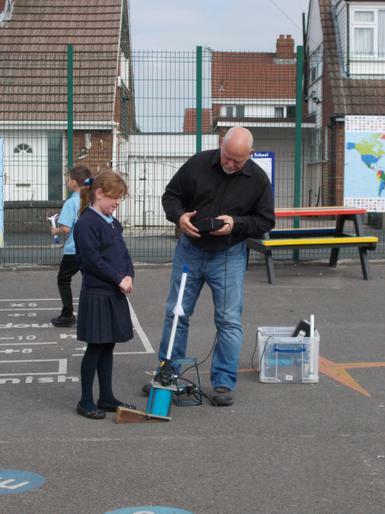 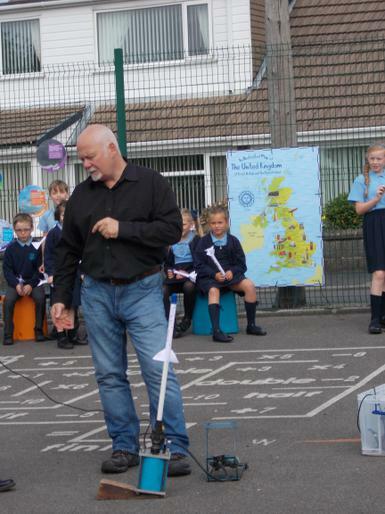 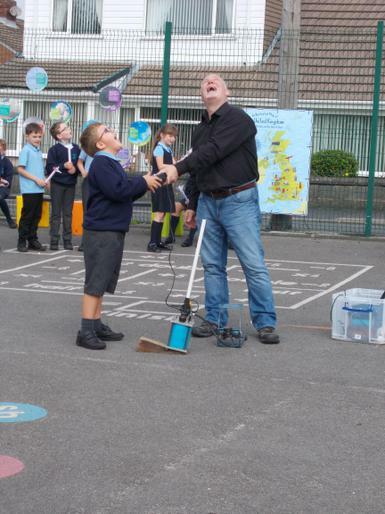 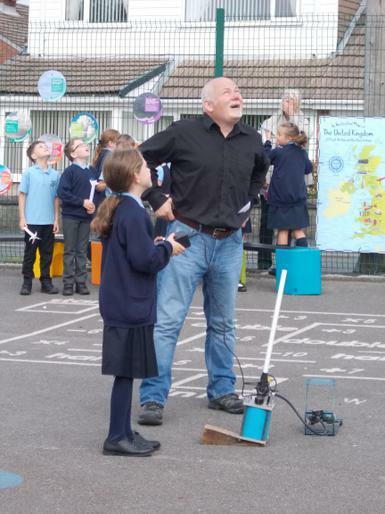 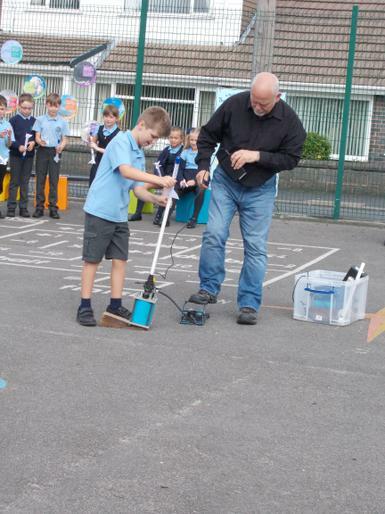 the whole school went out to the car park to watch a real rocket being launched from the field next to school. 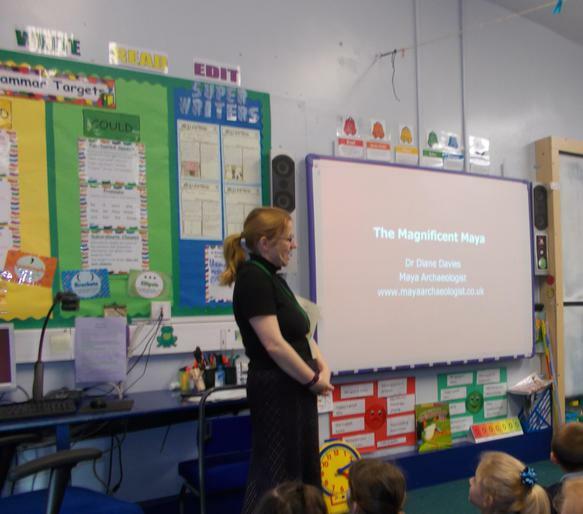 We had a magnificent day! 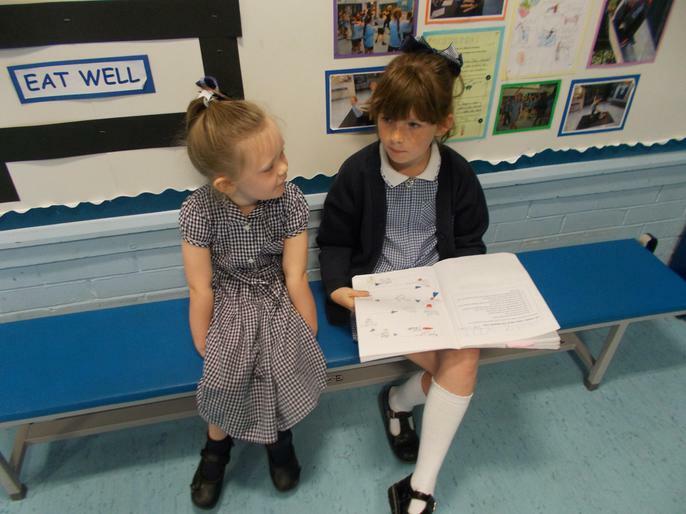 Well done to our enthusiastic readers. 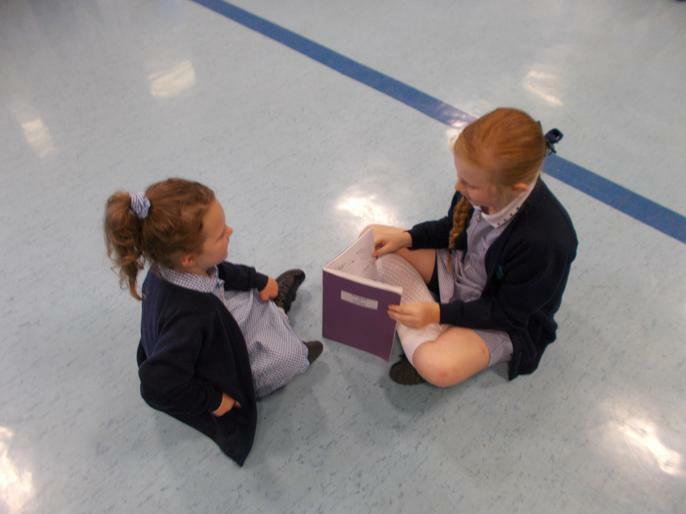 Niamh reached her 250 stamps award and was presented with a book in assembly and well done to Grace-Mai and Megan on reaching their Bronze award. 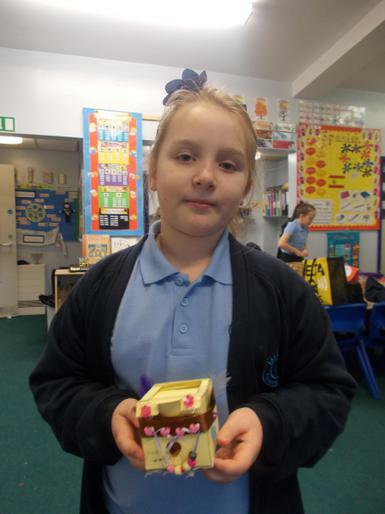 Well done Faye, we are all very proud of you. 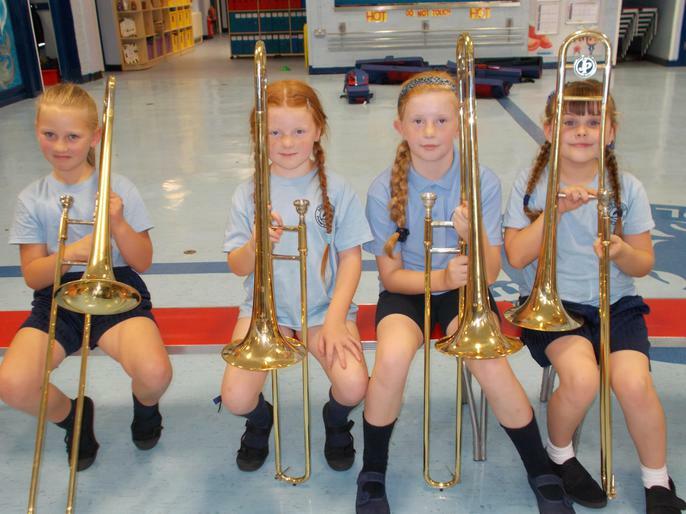 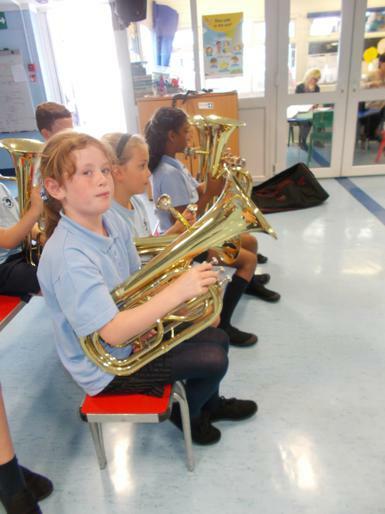 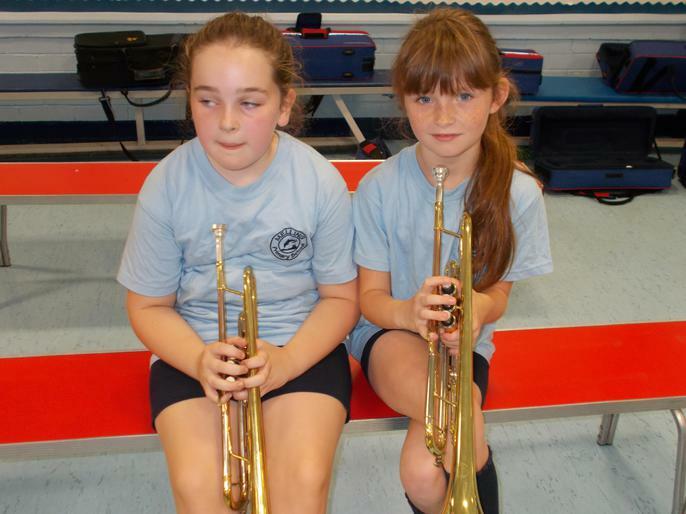 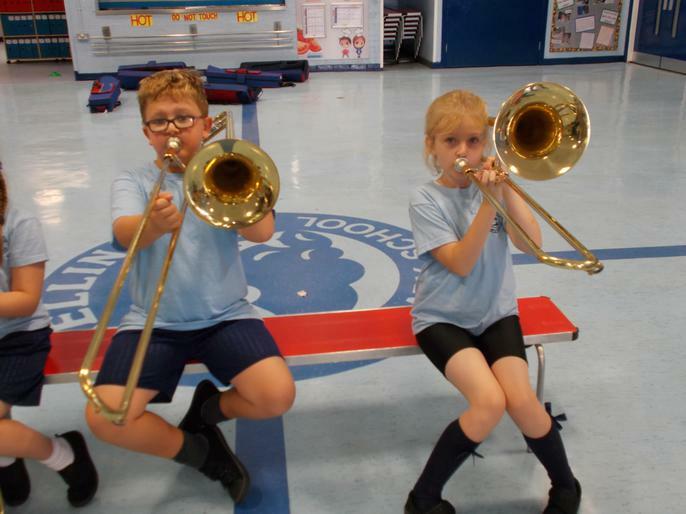 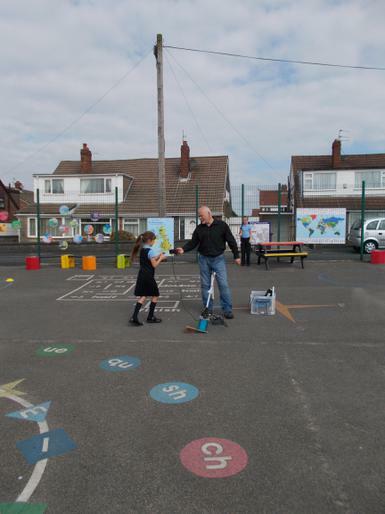 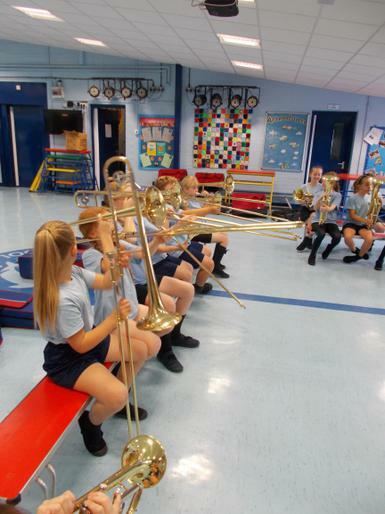 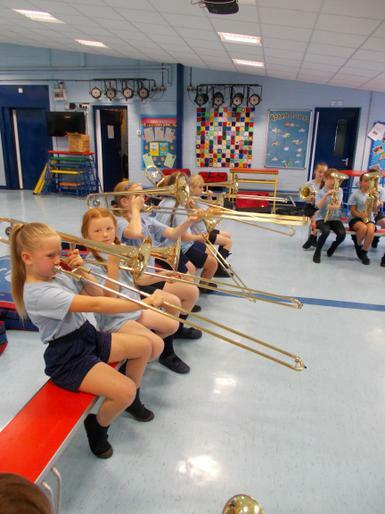 On our transition day at the end of Y3, this was the 4 a day that the Y4 class had been doing. 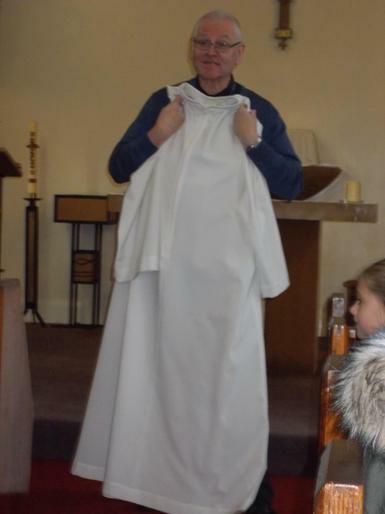 We thought it looked really scary! 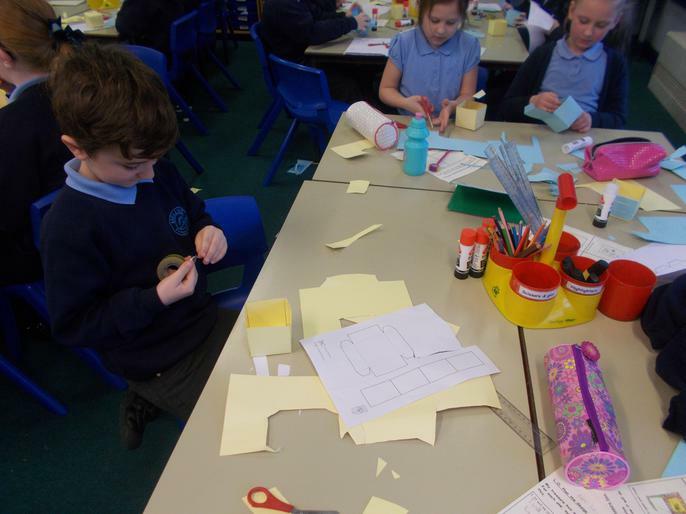 By the end of Y4, we WILL be able to do it! 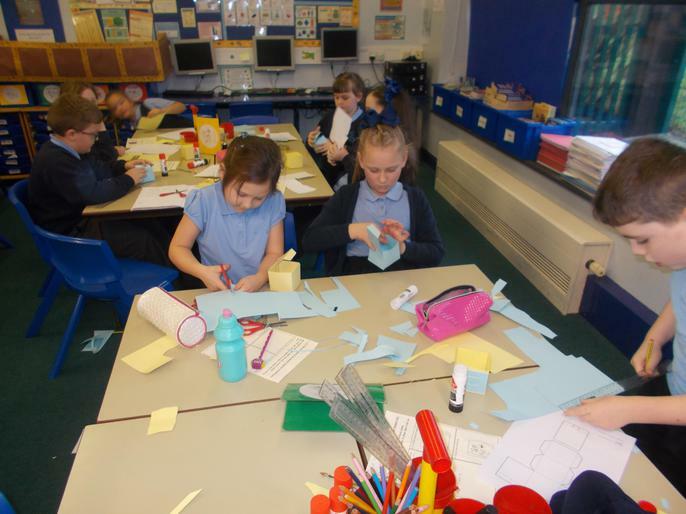 We are already working hard and looking forward to an exciting year.